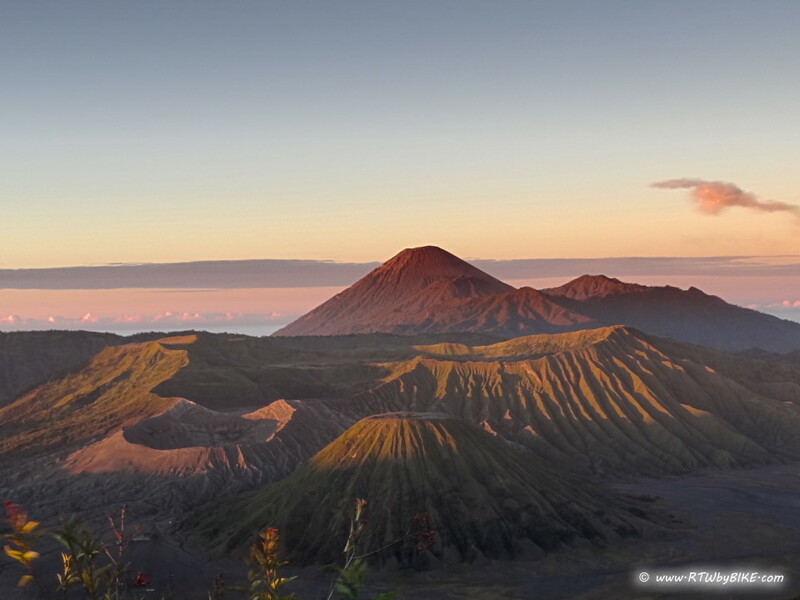 Indonesia is becoming one of our favorite countries we have to admit. 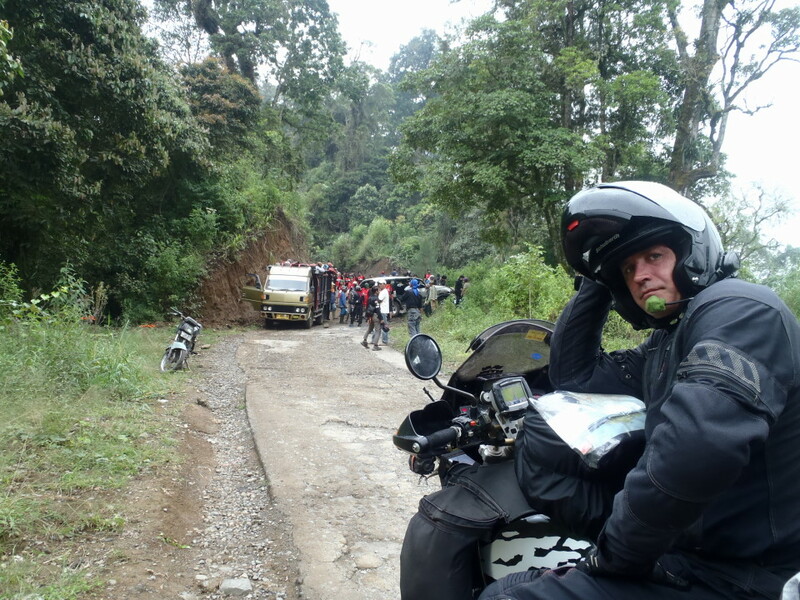 Friendly helpful people everywhere, astonishing landscapes and even though the traffic in some areas and the street conditions are a nightmare we really do enjoy it. 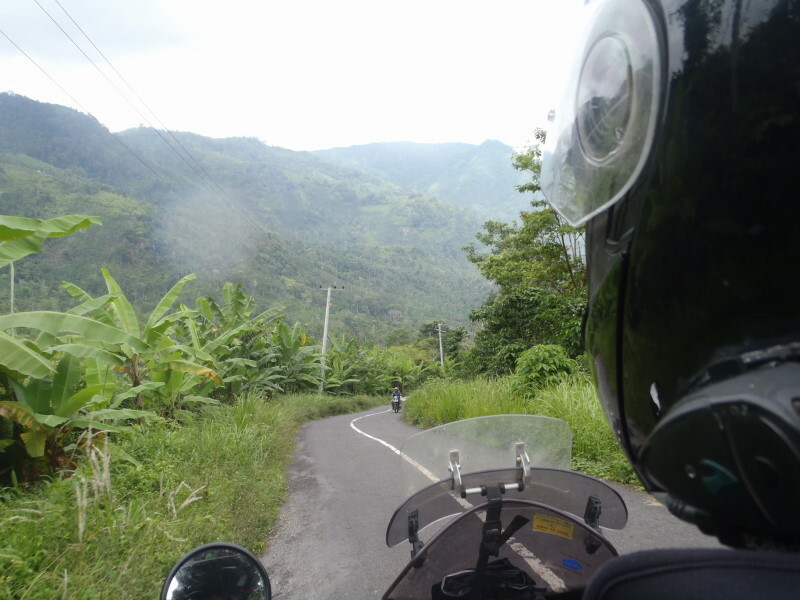 Going around here and getting known the details and differences in each area is just astonishing. 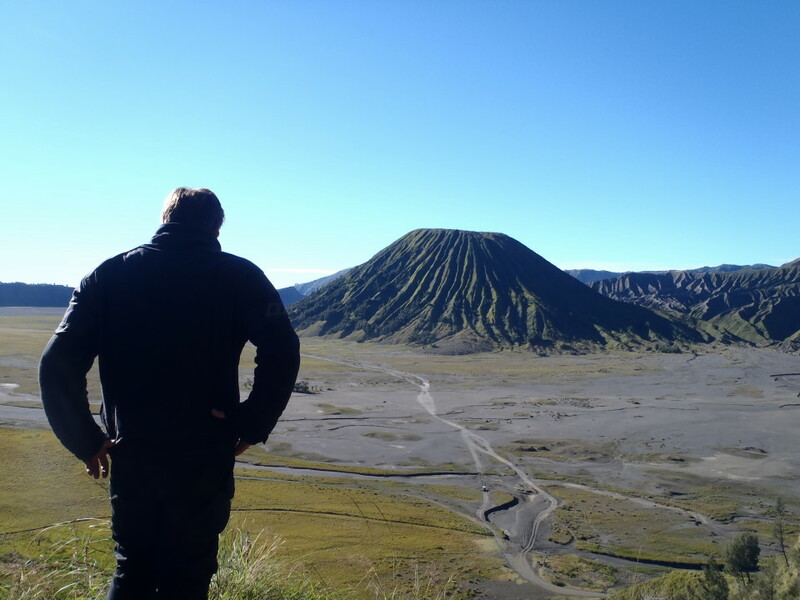 We prolonged already our visa but we feel already sad of the idea leaving the country and not having seen places like Sulawesi, Papua or Borneo… Anyhow for sure we have to come back to meet all the incredible people we became friends and also visit many places which are outstanding! 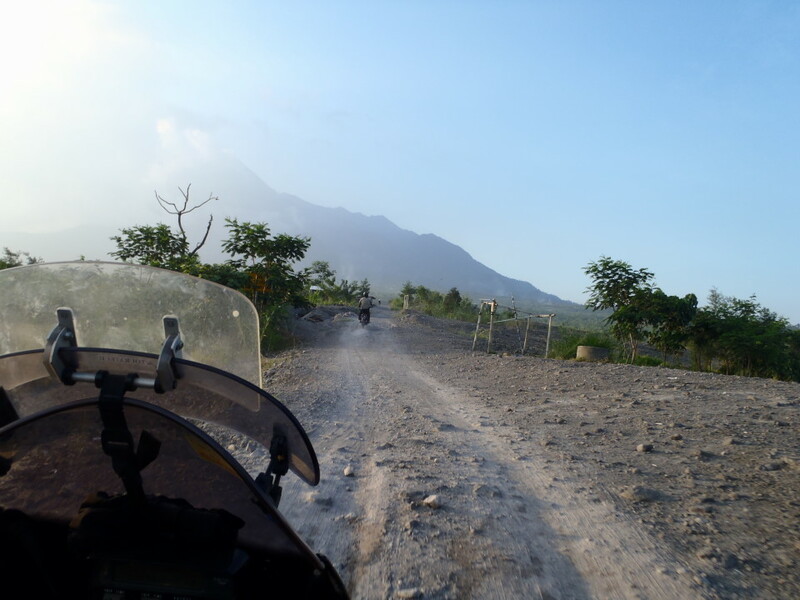 Mt Merapi, the mountain of fire, is a real active volcano, actually the most active one in Indonesia. 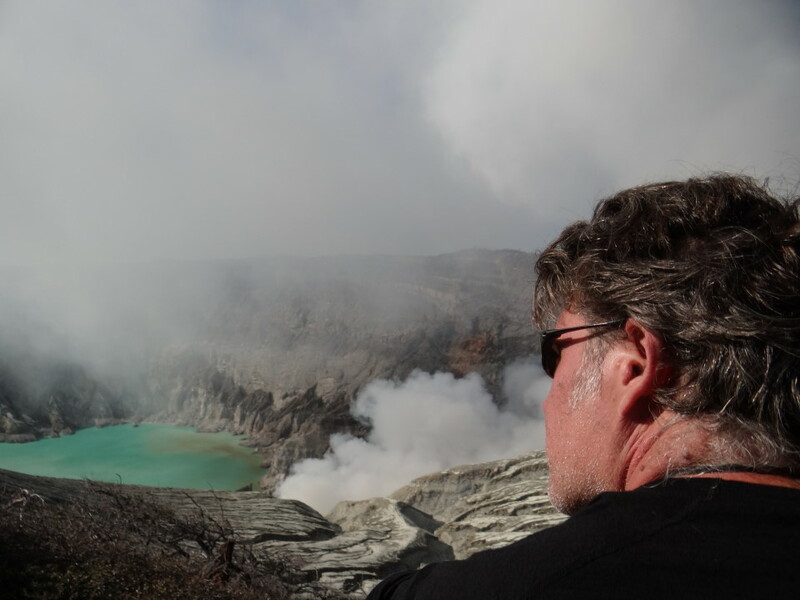 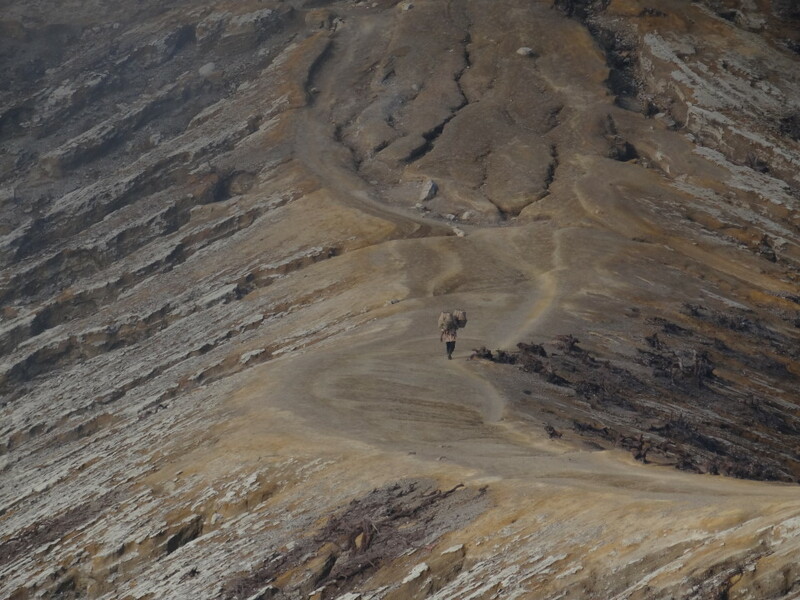 The last eruption was in 2010 and still you can see the impact… beauteous and scary at the same time. 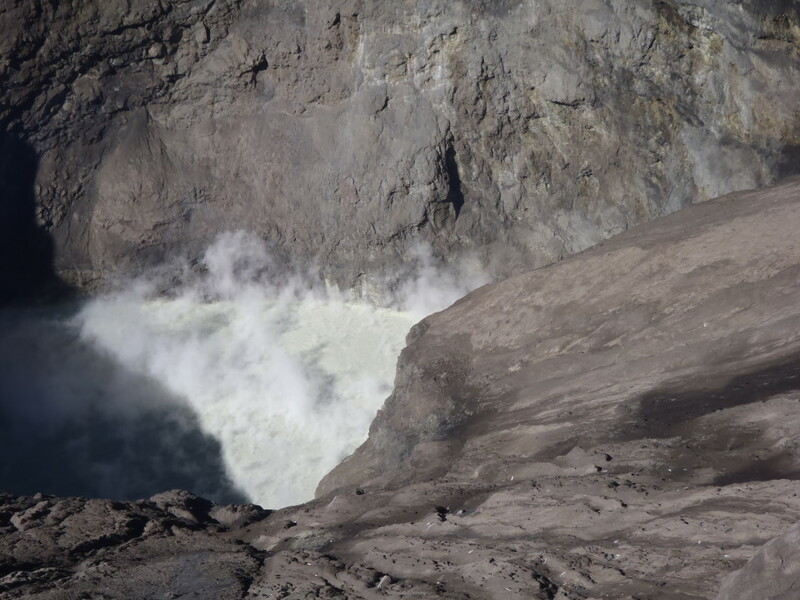 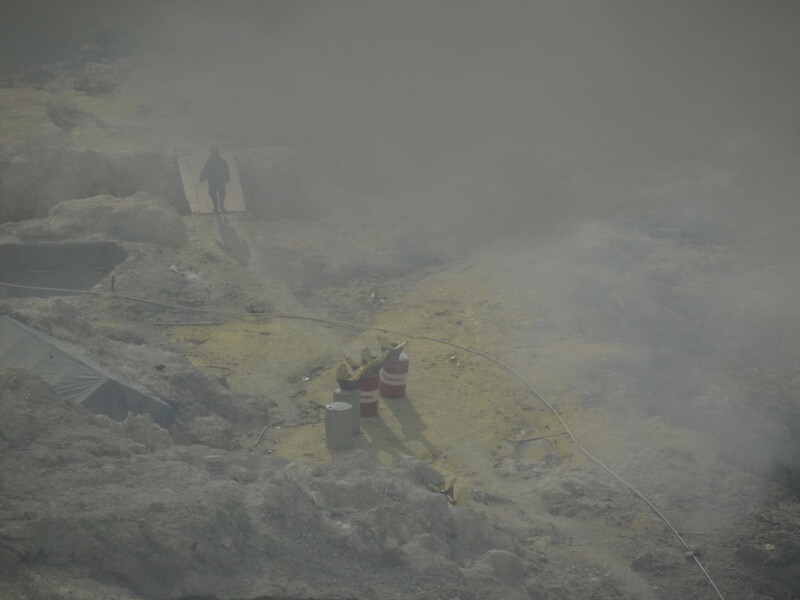 The people told us how intensive they could feel the eruption and the shakes. 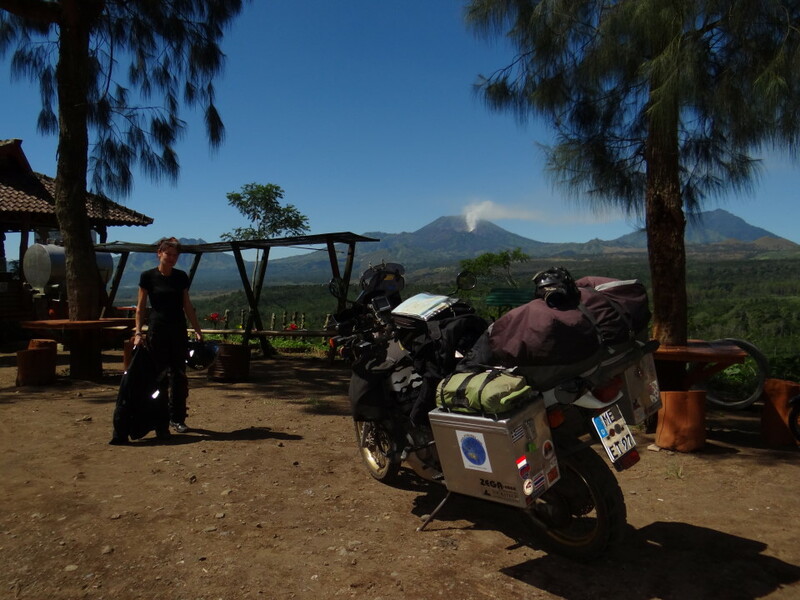 It was raining ashes for several weeks in Jogja which is about 50 km away. 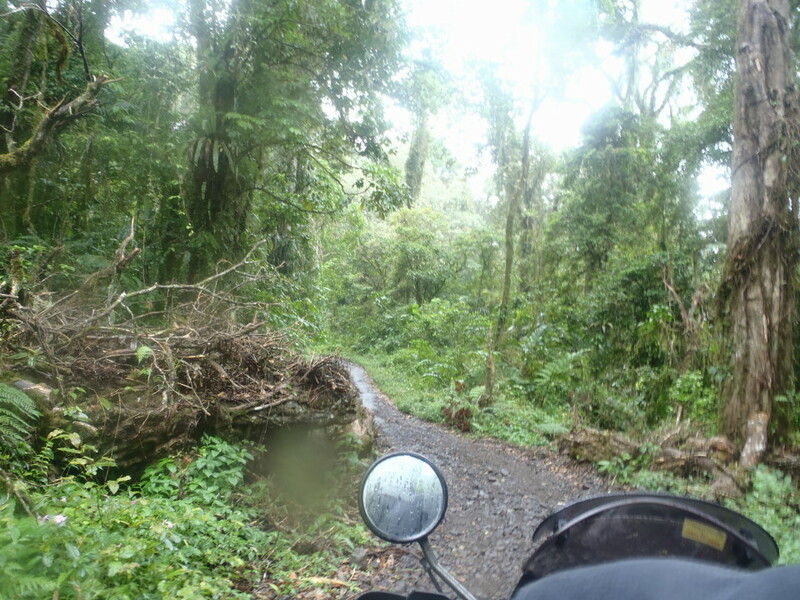 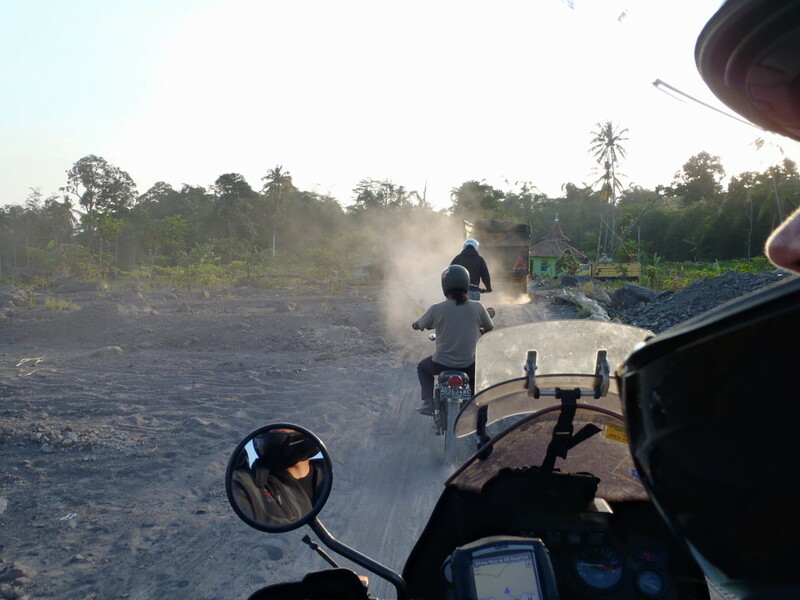 Thanks to Johnny (a friend of Shinta and Andy) and his cousin we went up little narrow roads and through the lava river to have the closest spot in the dawn. 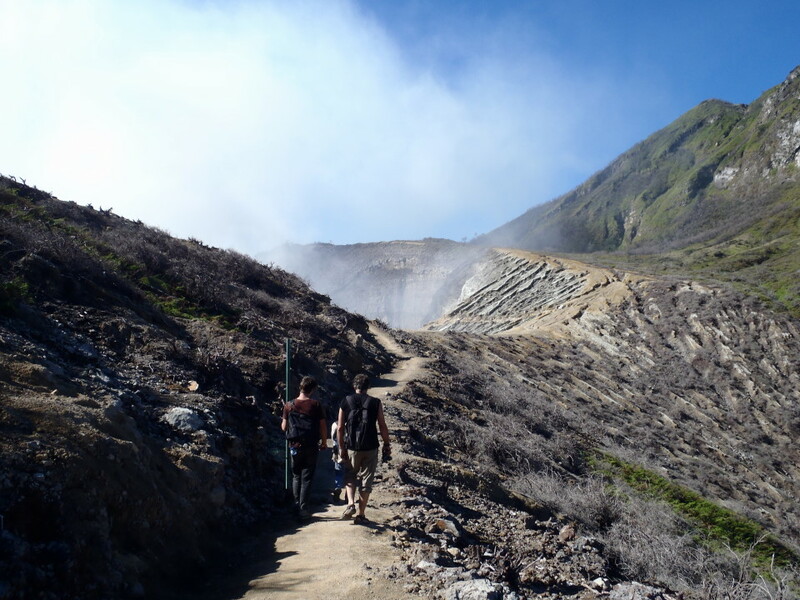 We got internal information about the activity of this volcano and had an amazing trip together with them. 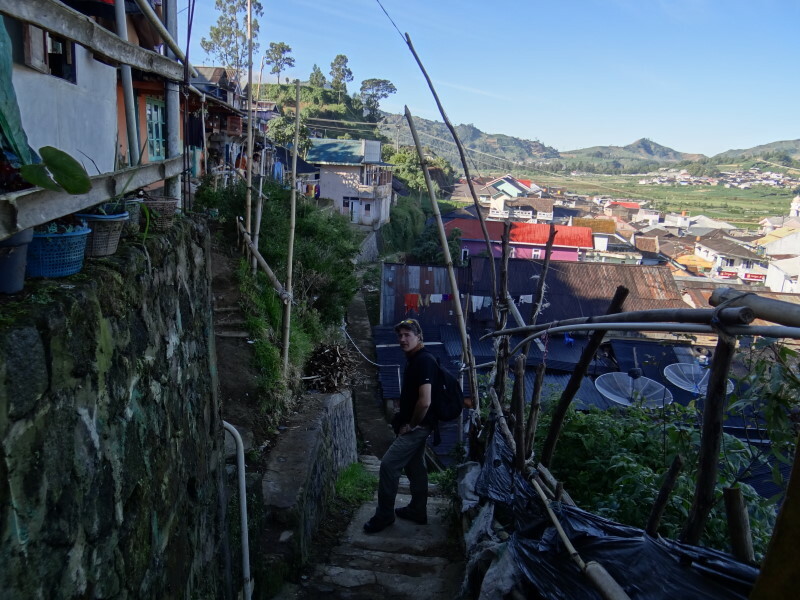 Some of the houses we saw have been covered with ashes till the top of the roof. 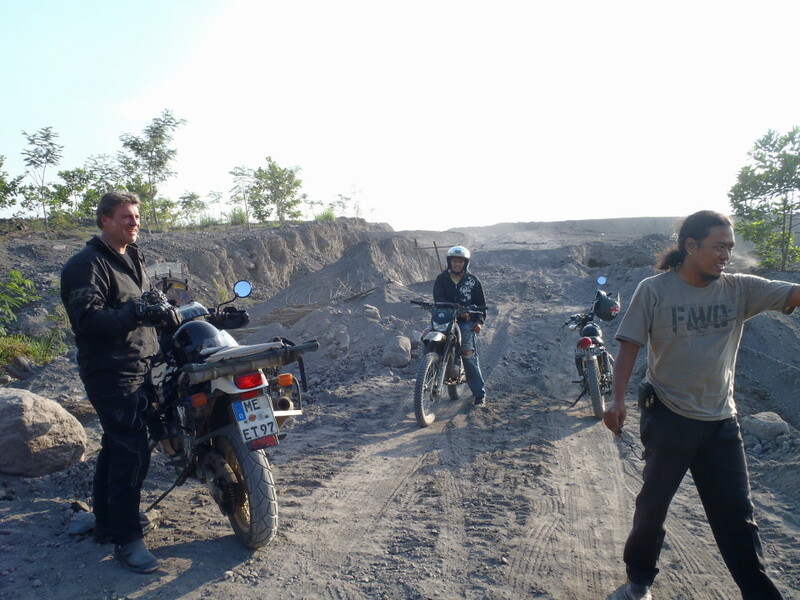 At the same time it is just a big playground, sandbox for all Off-road enthusiasts… Thank you Johnny for taking us there and showing us the place! 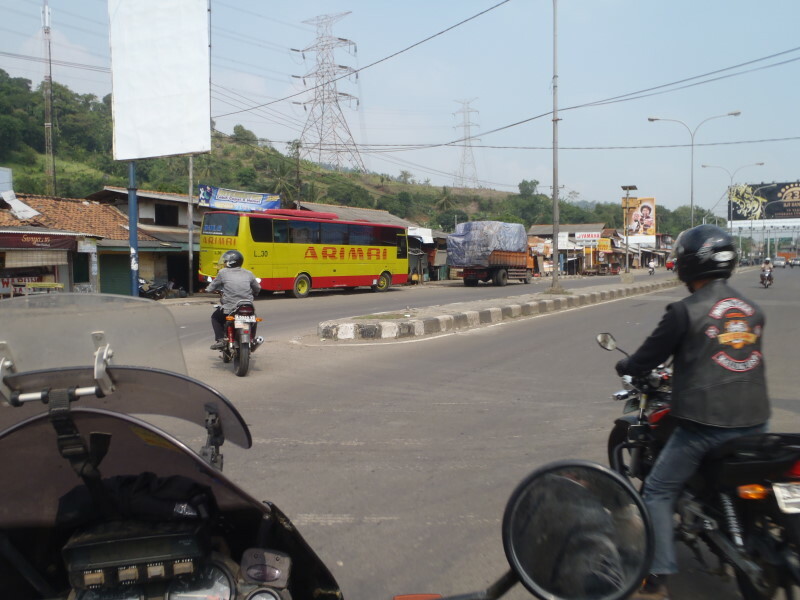 At this point we would like to THANK Shinta again! 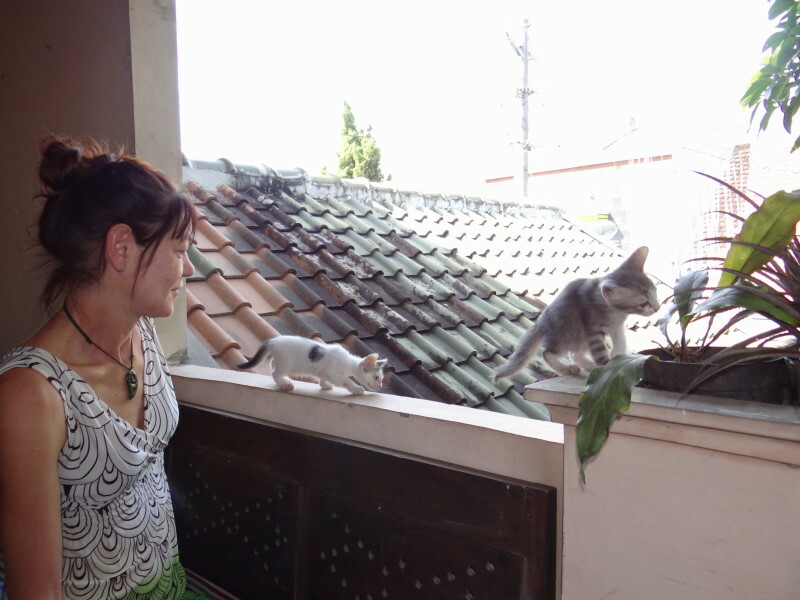 She gave us a lovely home in Jogja and introduced us to her nice family and friends!!! 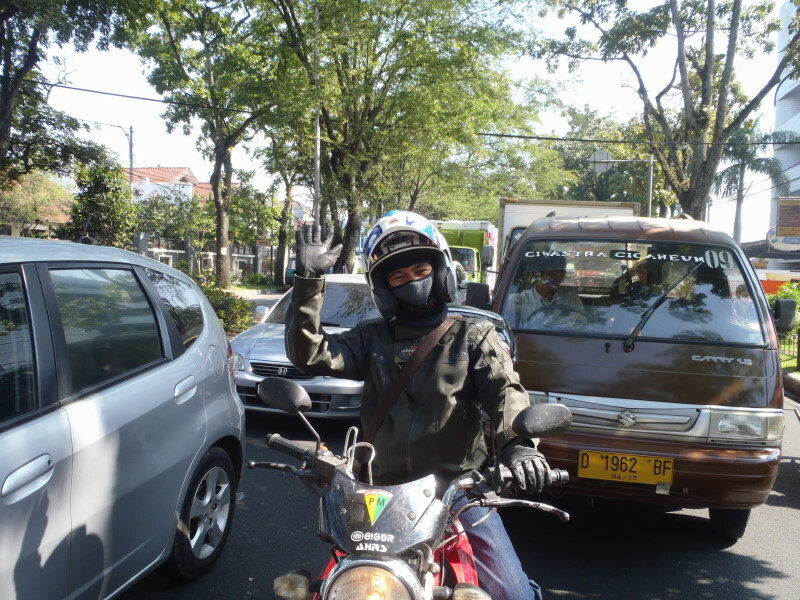 Hope to see you soon again! 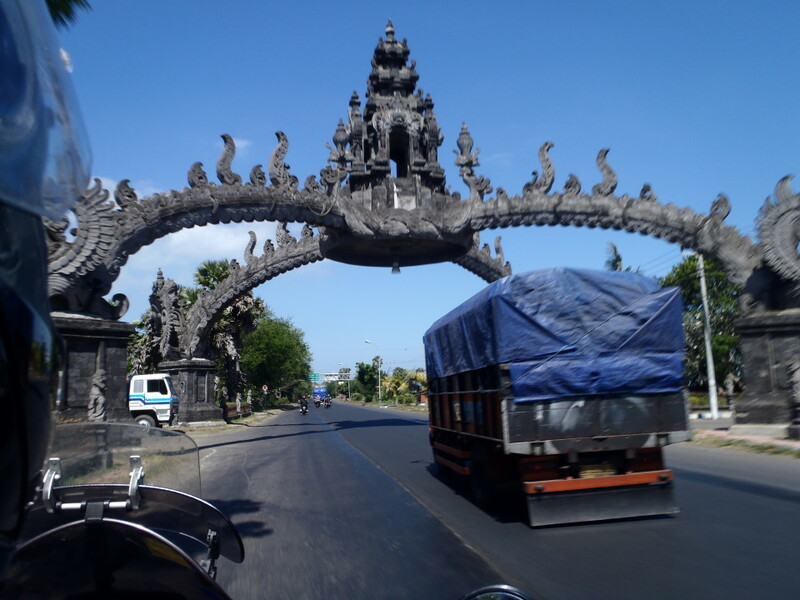 We skipped Borobudur… we have seen many temples; it is vacation period… not in the mood to see some ruins crowded with tourists and “hello mister people”. 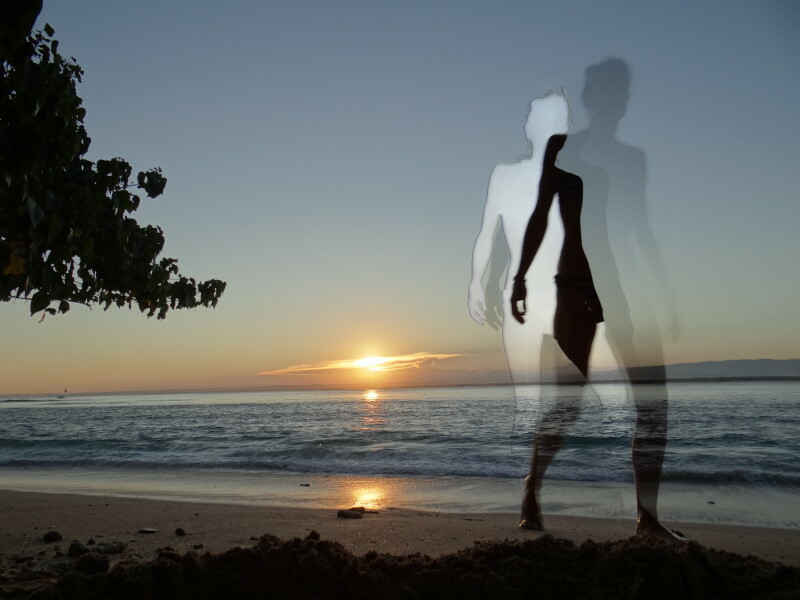 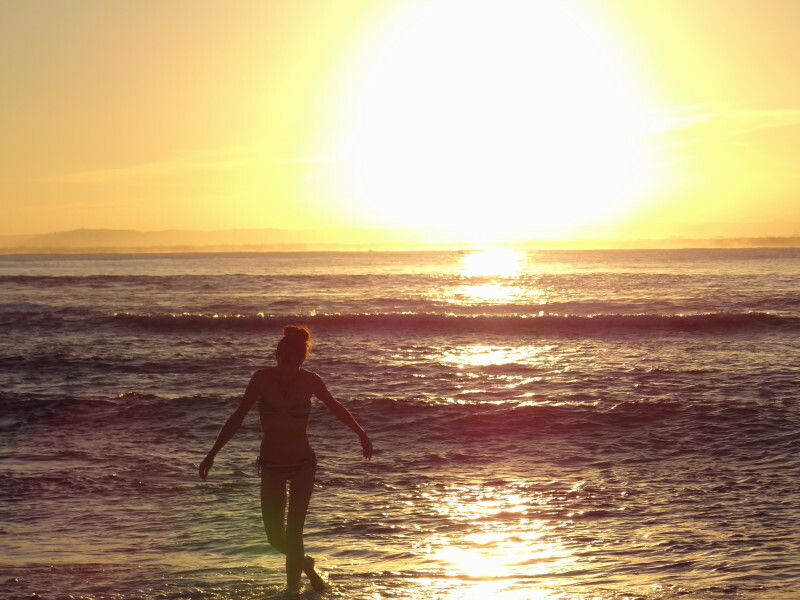 It will look the same in 5 or 10 years… still time for that one day. 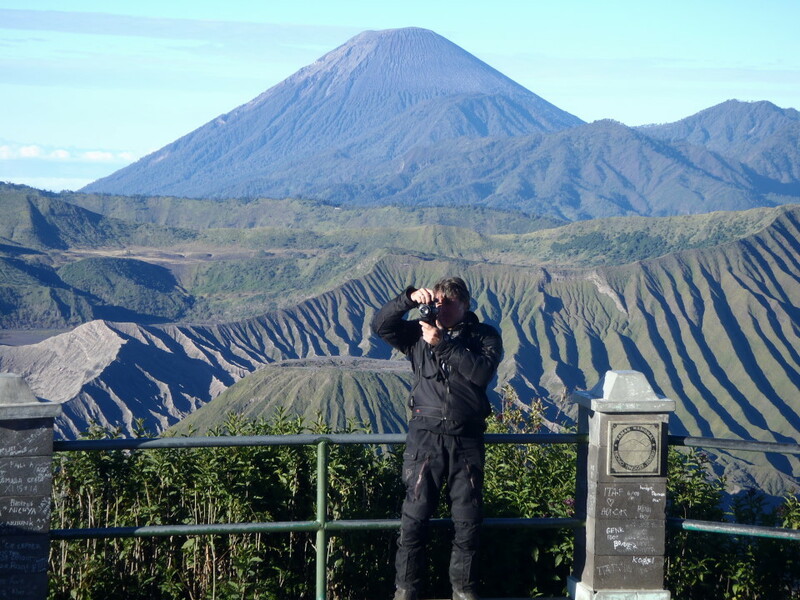 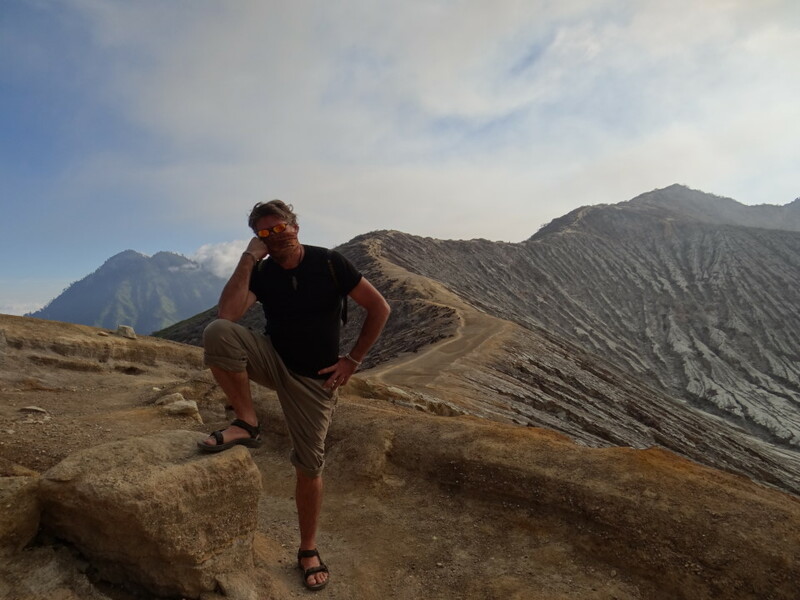 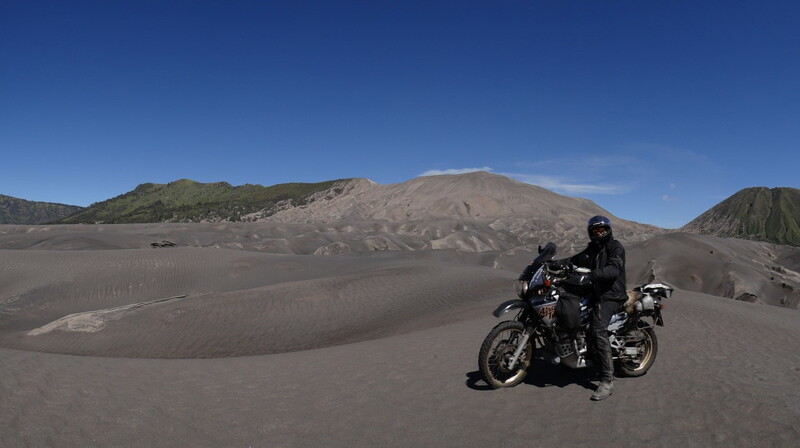 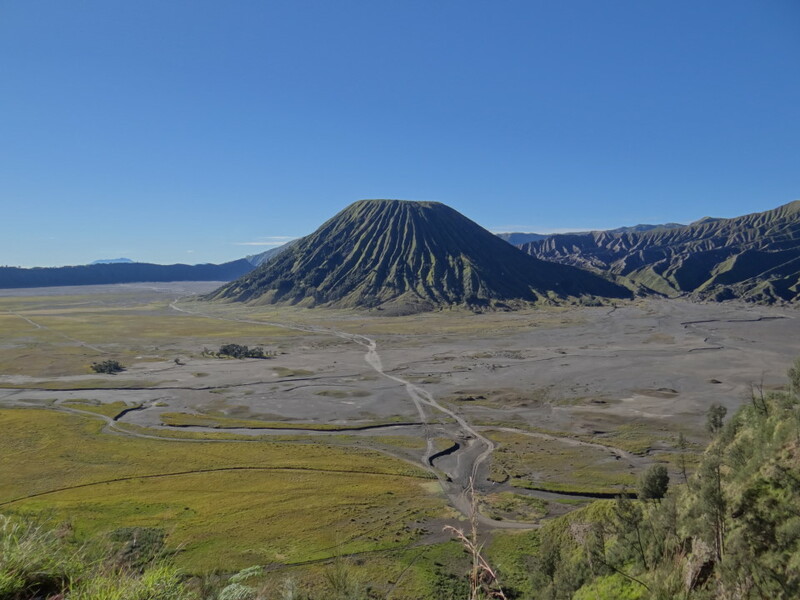 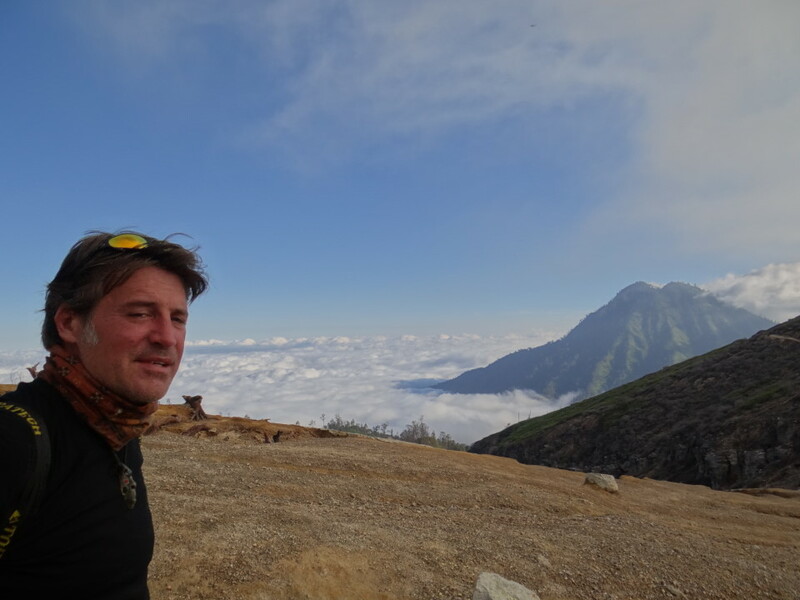 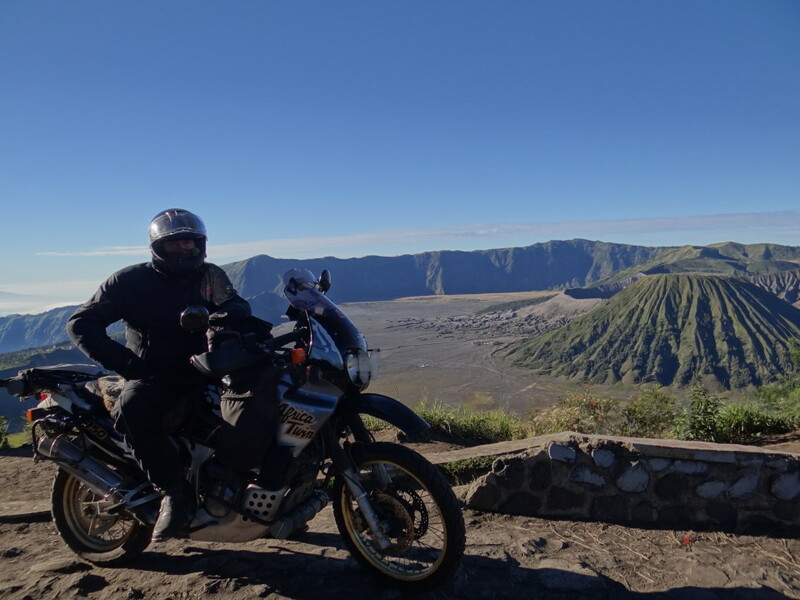 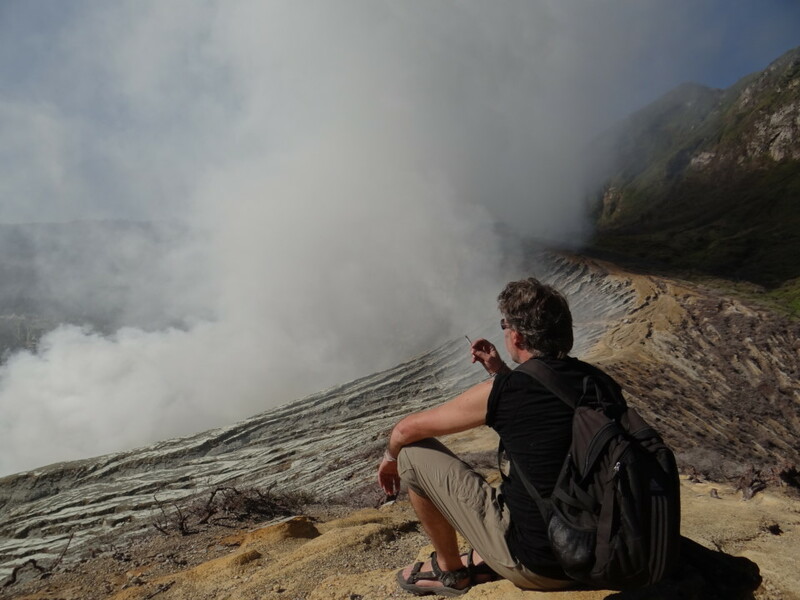 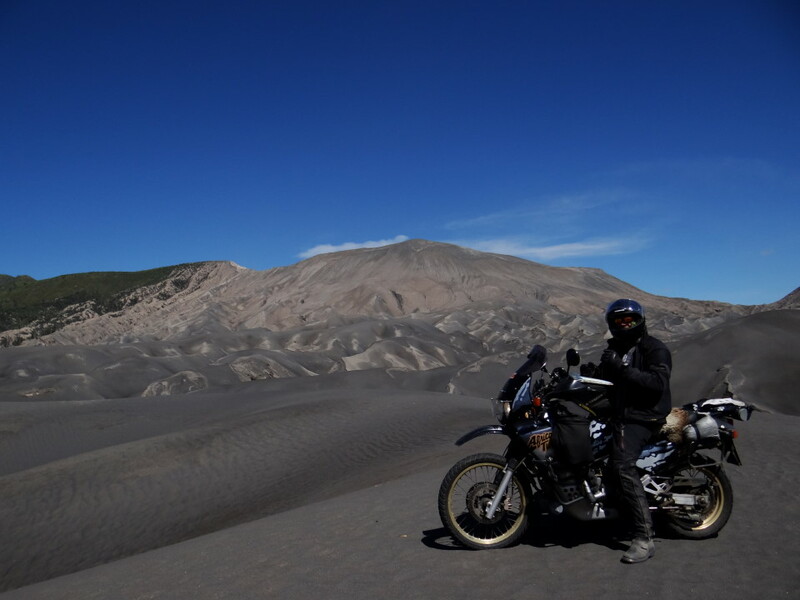 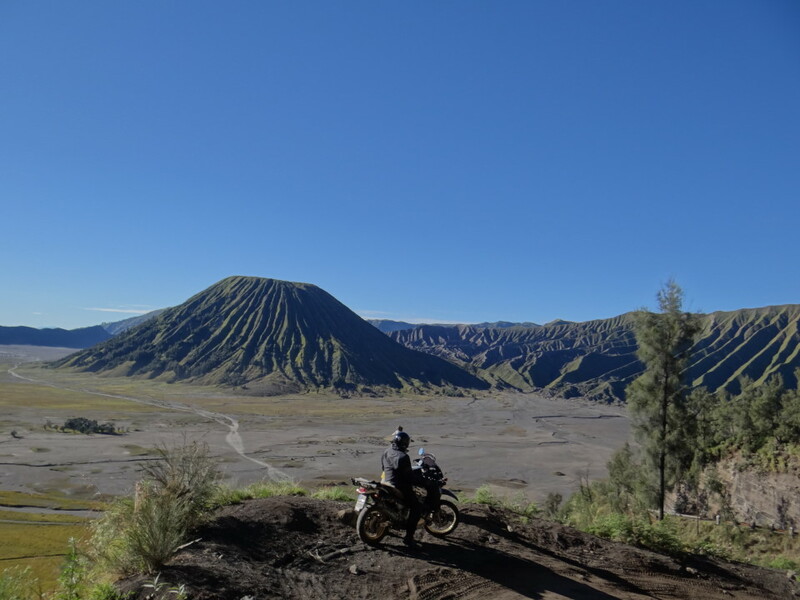 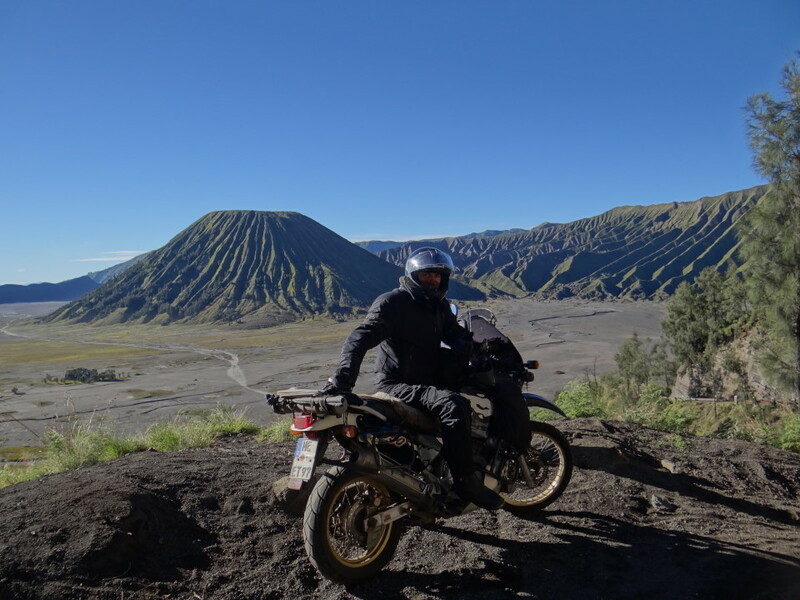 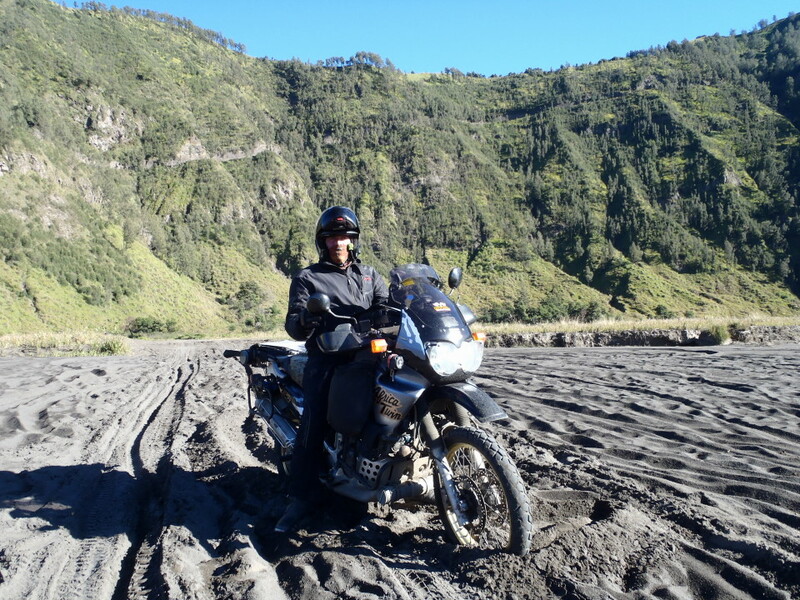 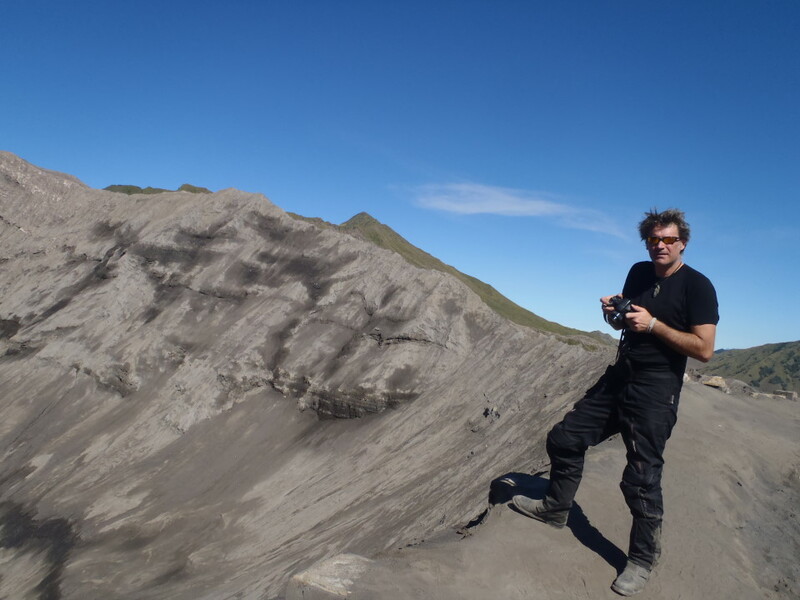 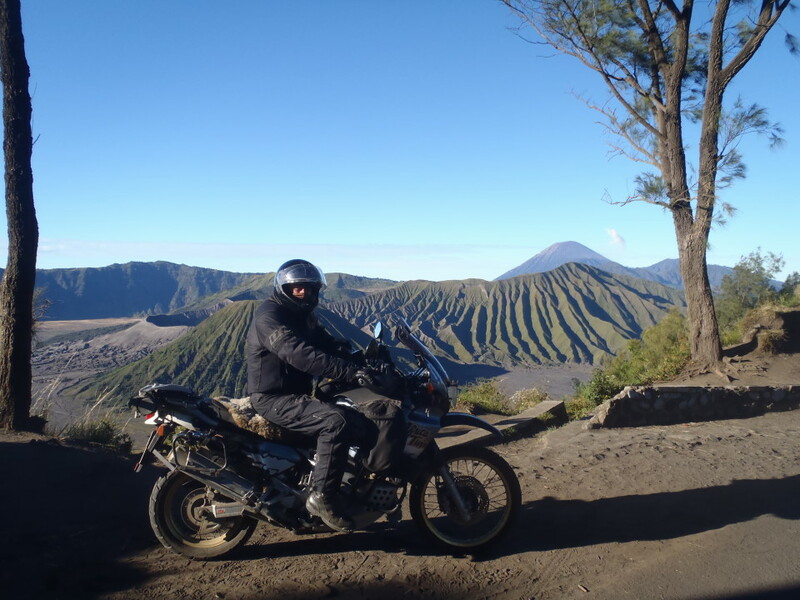 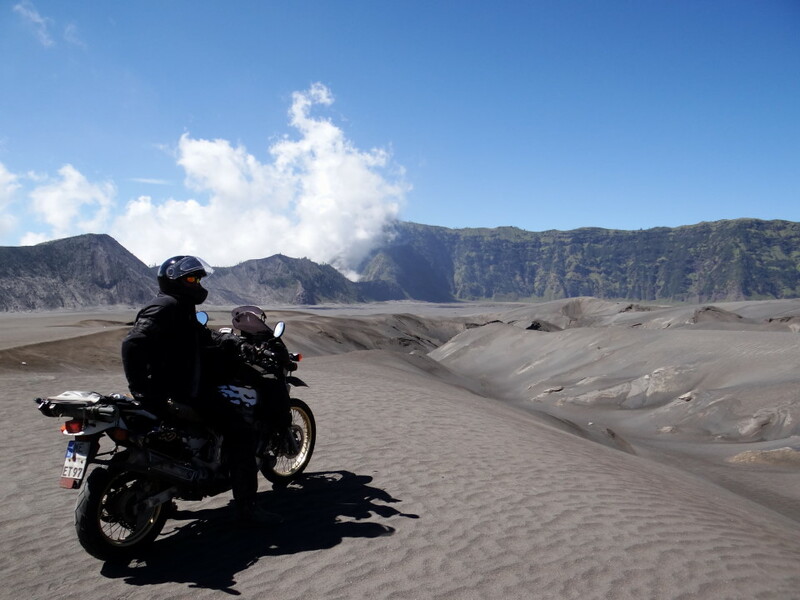 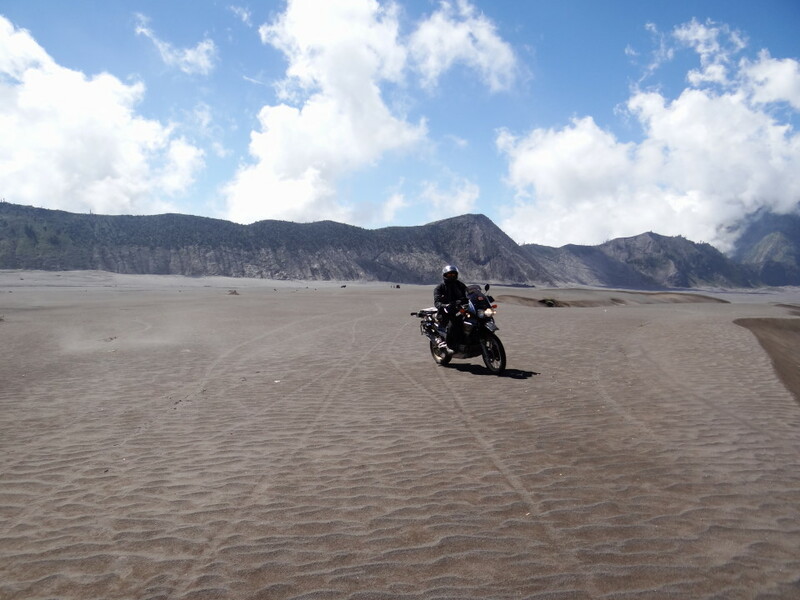 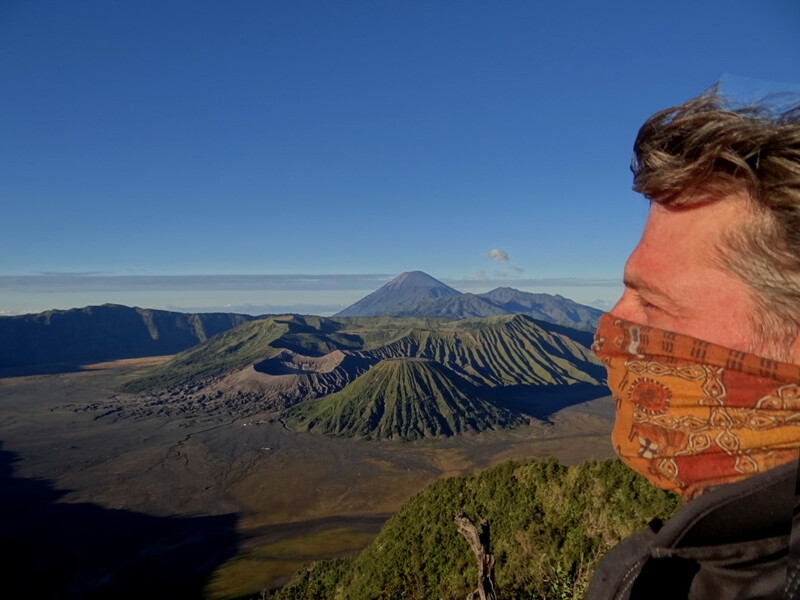 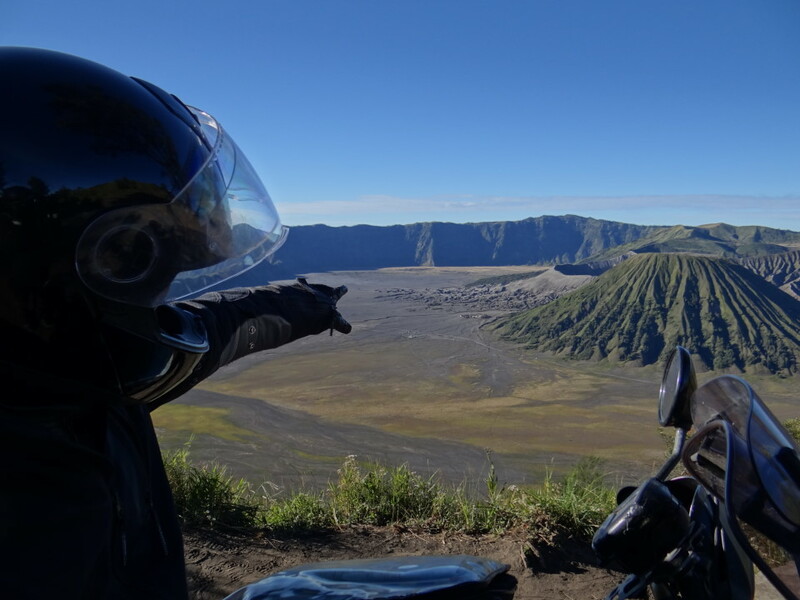 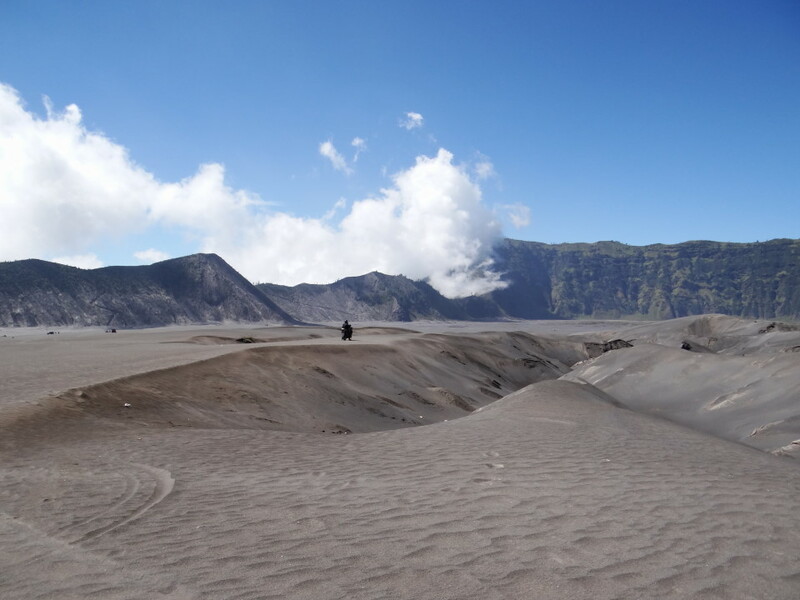 As well we had a look around the more uncommon areas and we were leaving about early afternoon Mt Bromo happy and full of impressions! 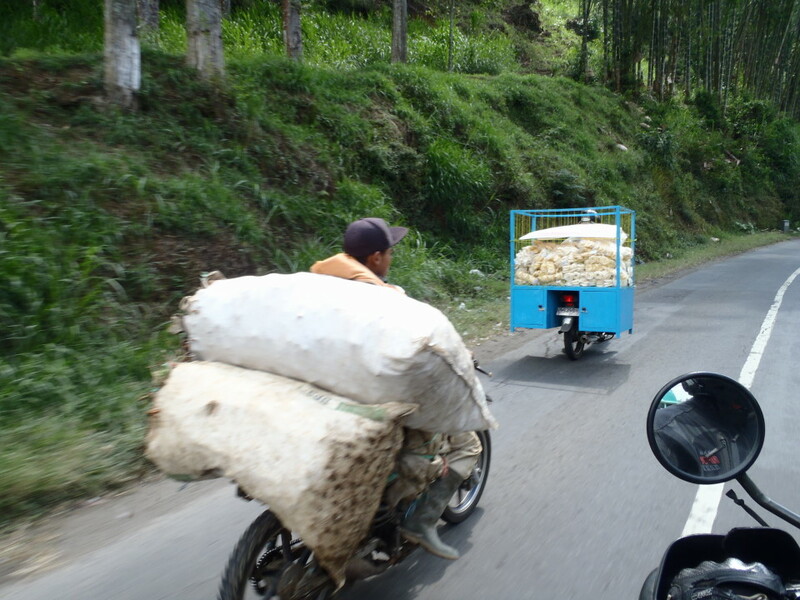 Not that far away but still a fair bit of a ride… When we entered the idjen plantation area where they grow coffee, cacao, and fruits we felt a bit like in a fairy tale… having another wake up coffee with the smoking Ijen in the background we were continuing through this more or less non touristic region which has a one-kilometer-wide turquoise-colored acid crater lake. 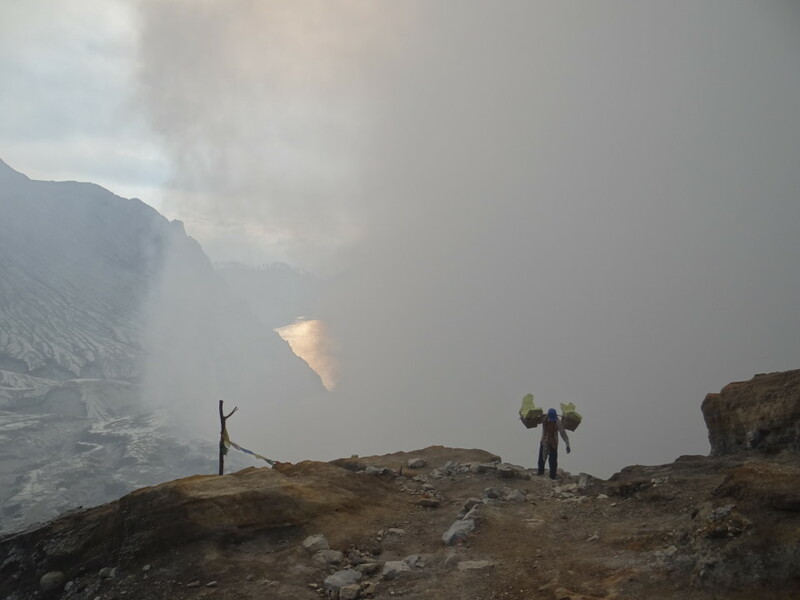 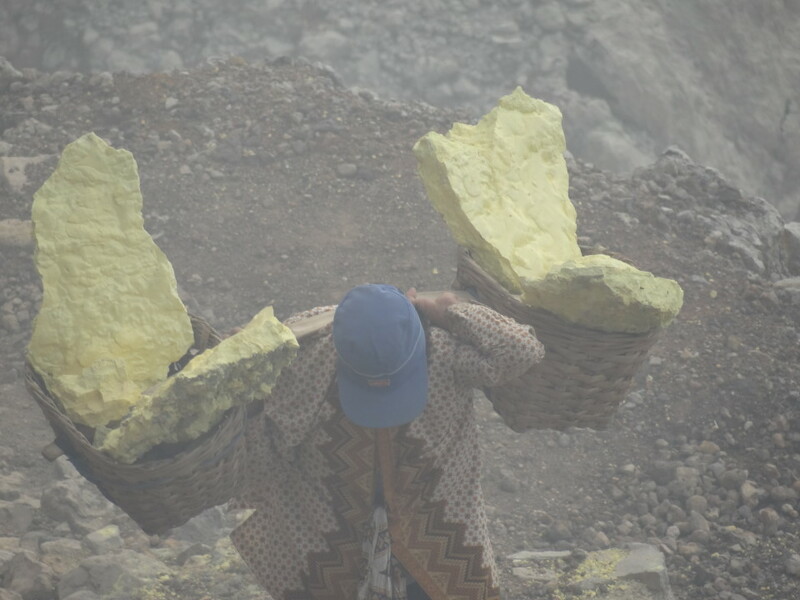 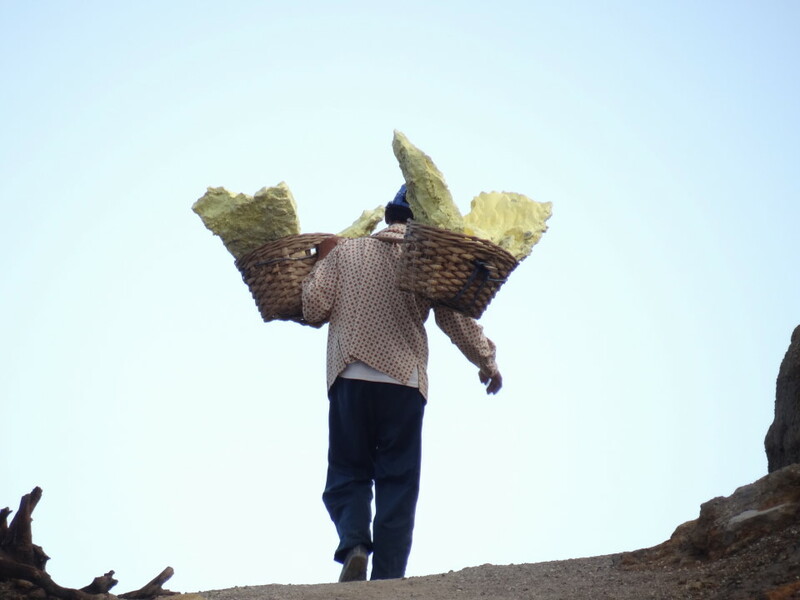 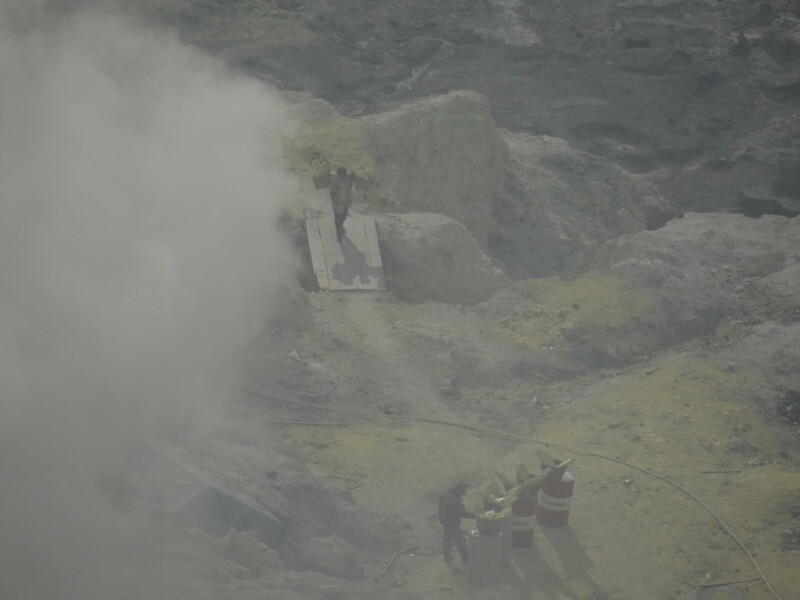 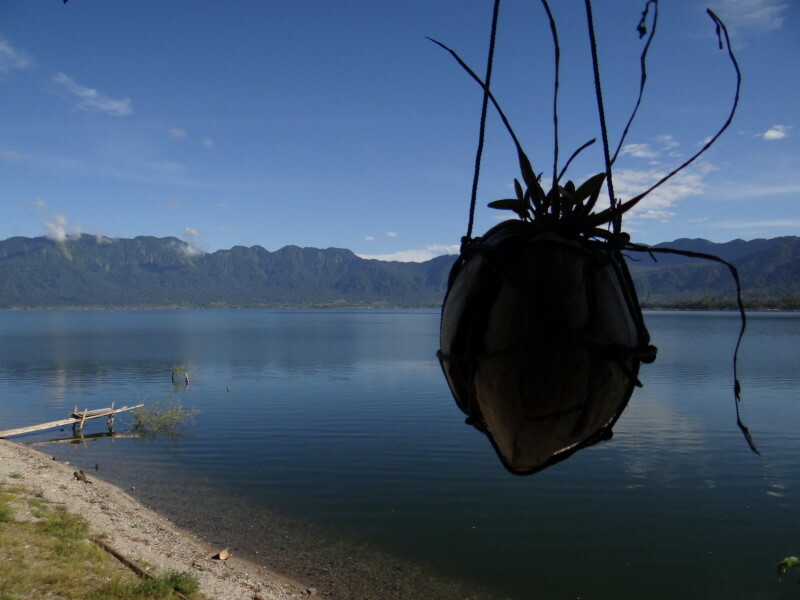 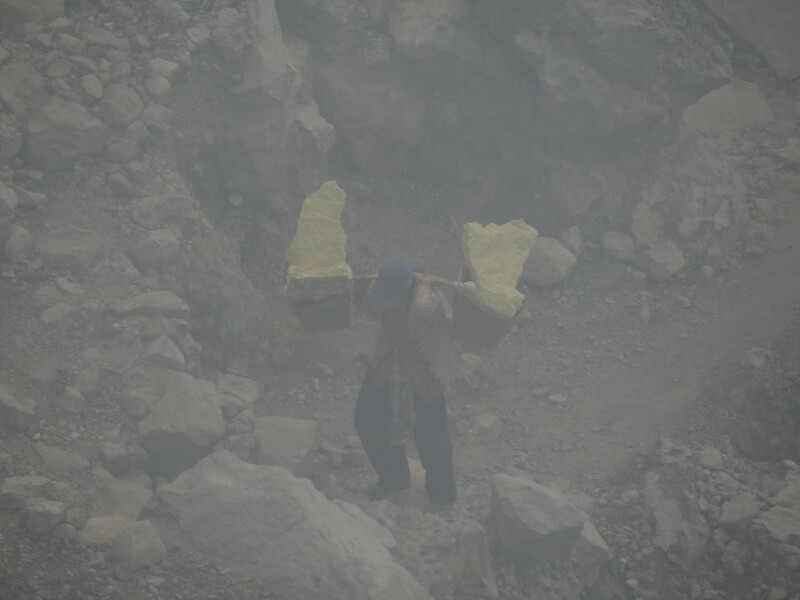 The lake is at the side of a labor-intensive sulfur mining operation, in which sulfur-laden baskets are carried by hand from the crater floor. 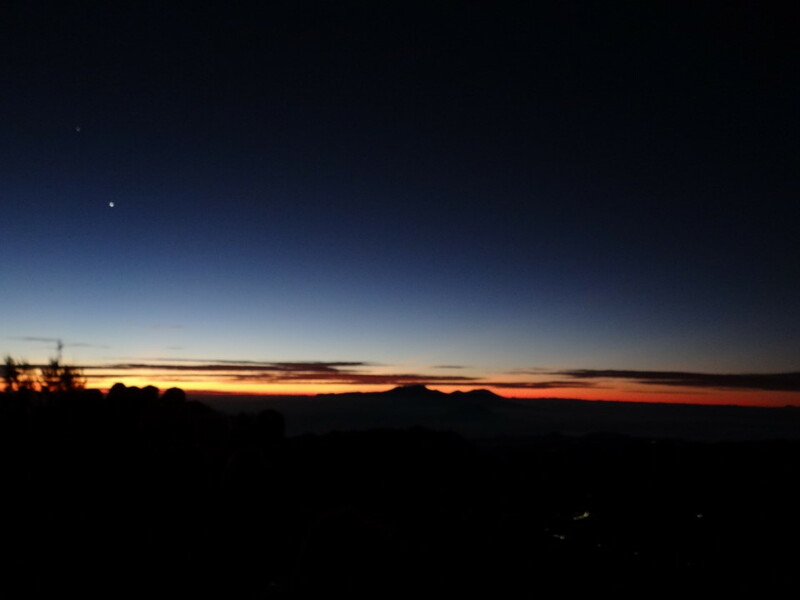 We spend one night up there. 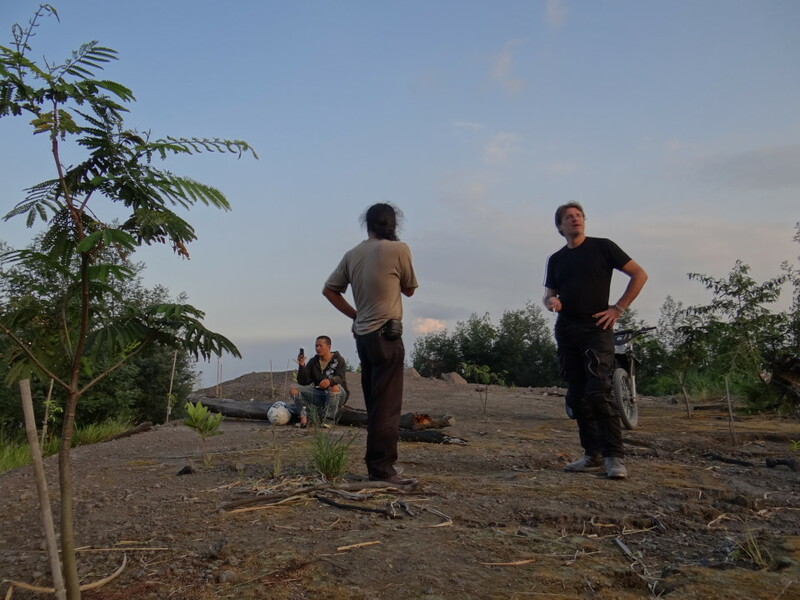 We built up our tent and we were chatting, laughing and eating with the workers at their fire place. 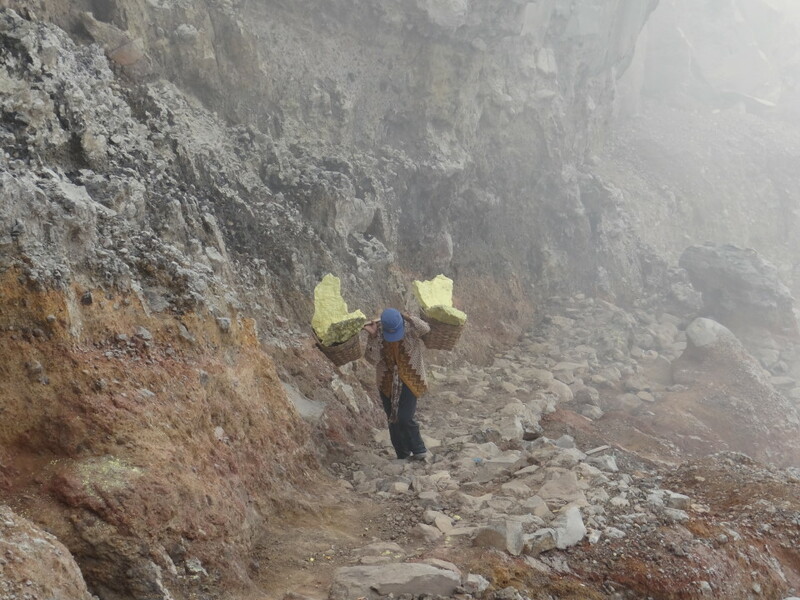 It is hard to put our impressions and feelings in words… this is one of the hardest jobs in the world we guess. 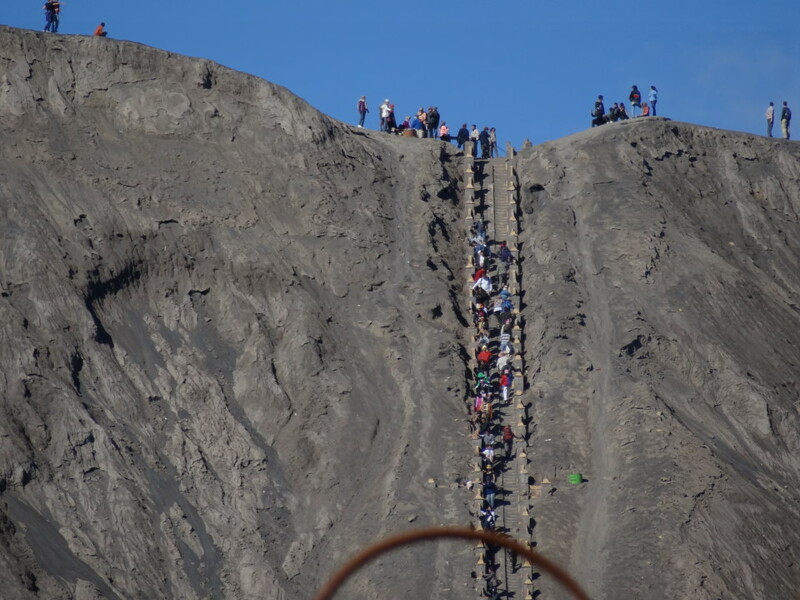 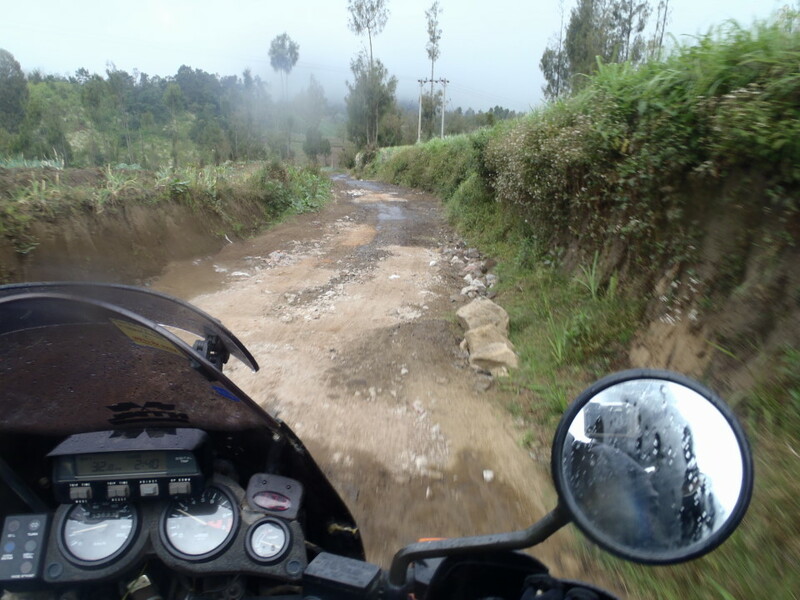 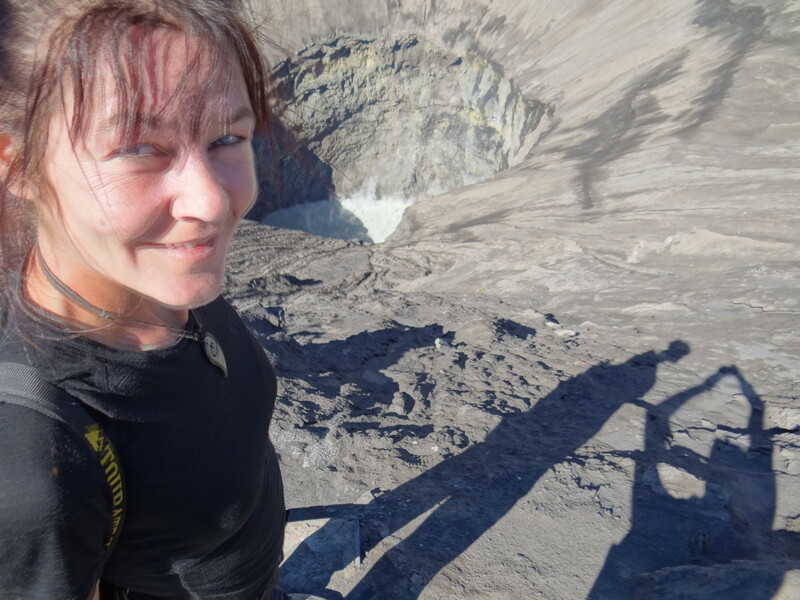 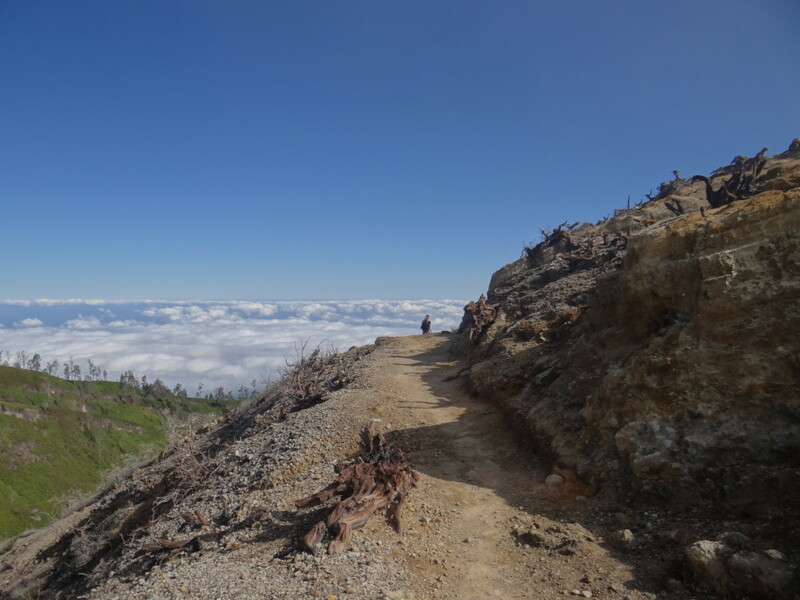 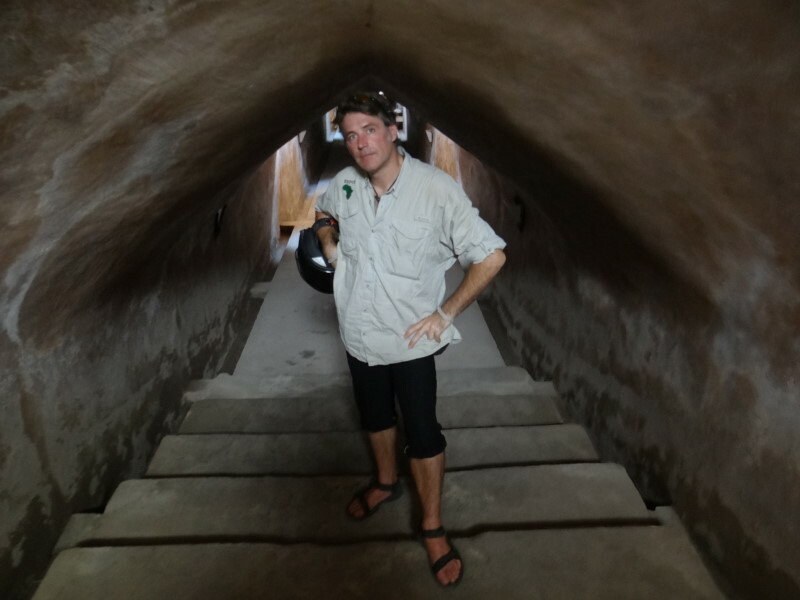 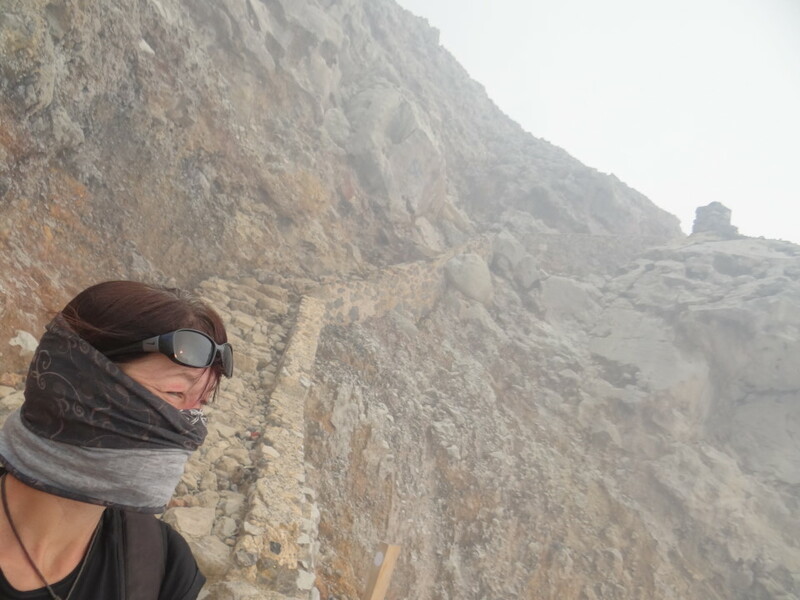 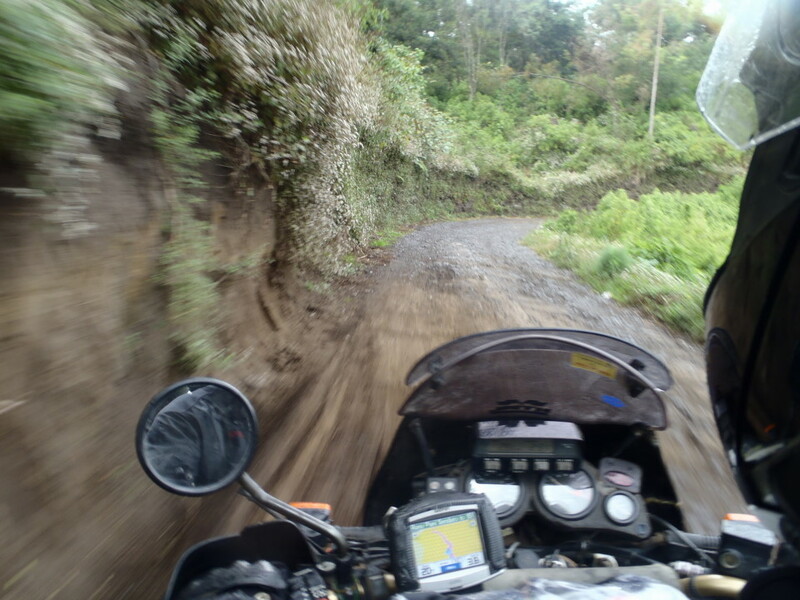 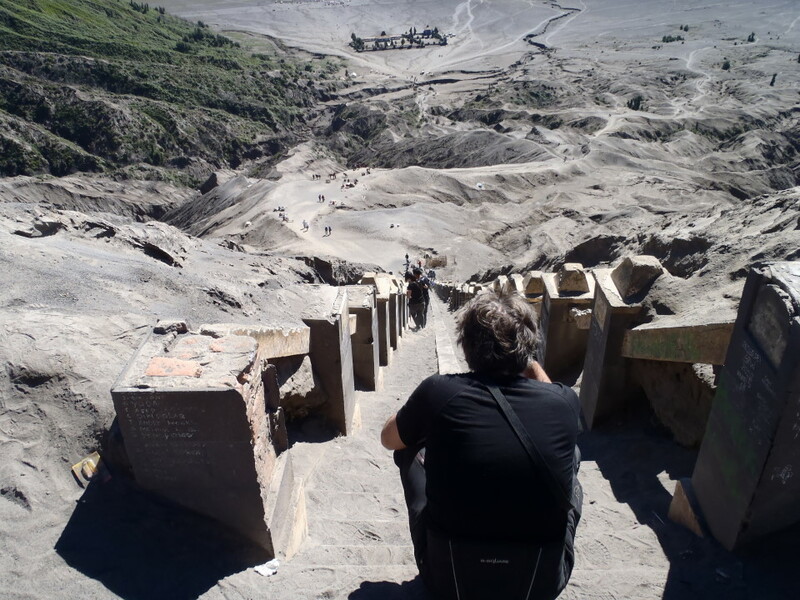 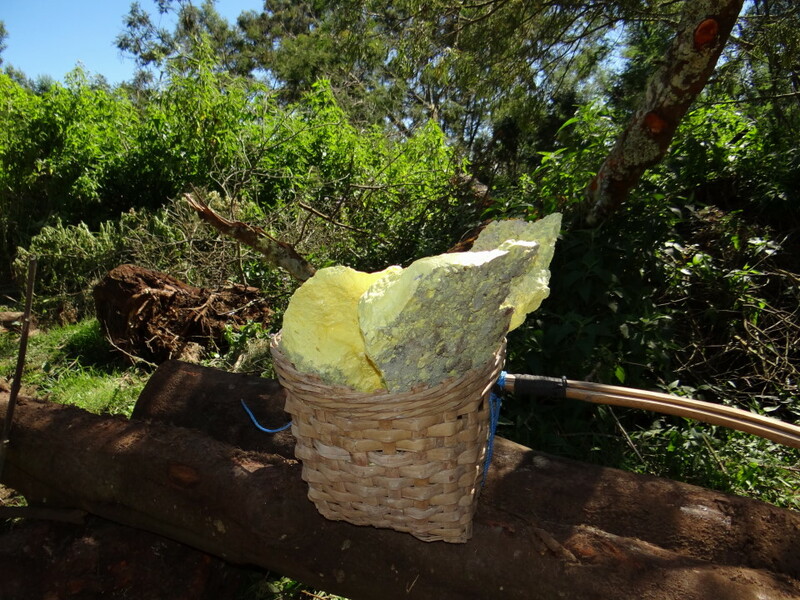 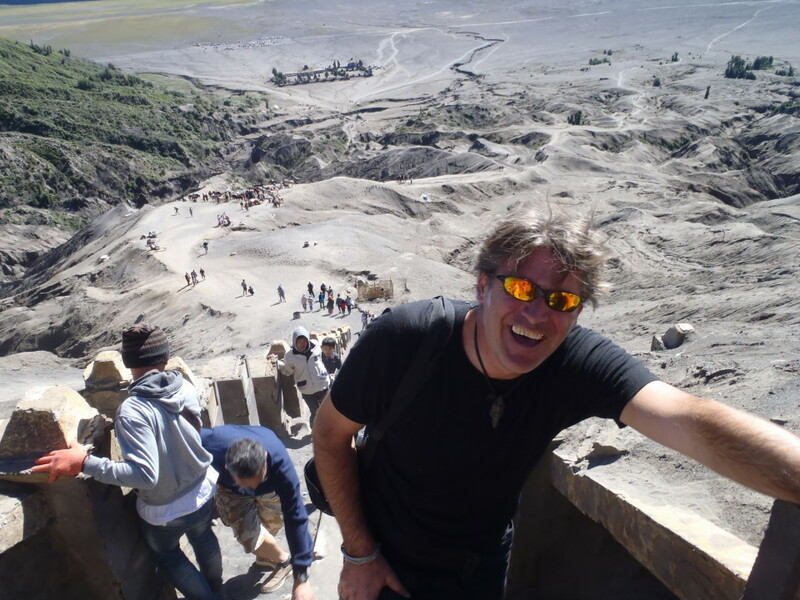 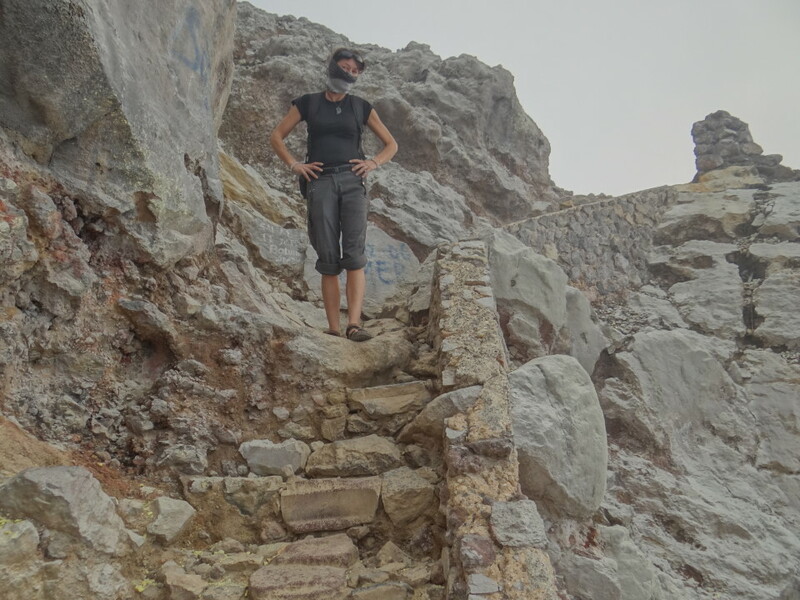 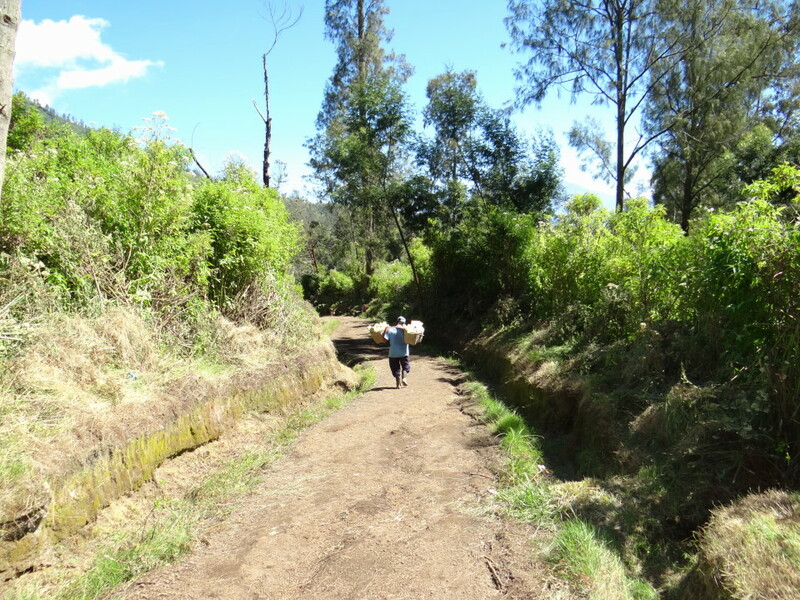 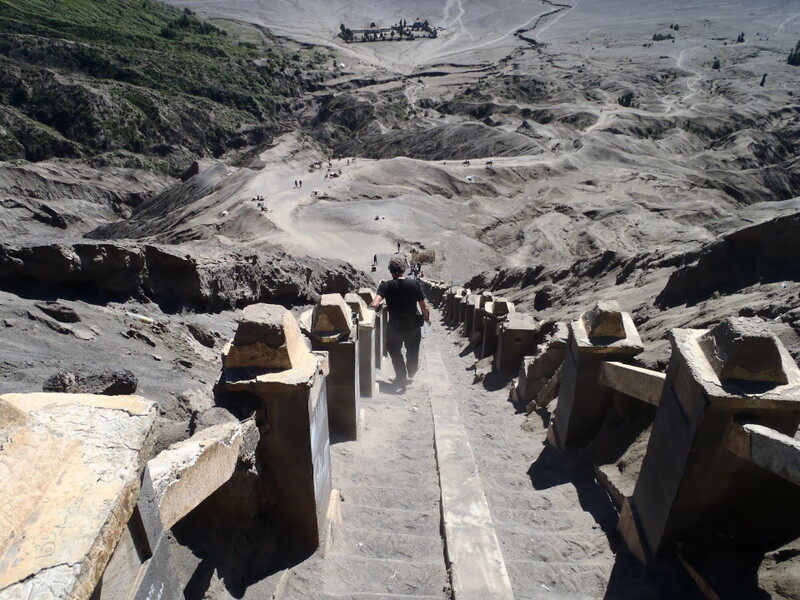 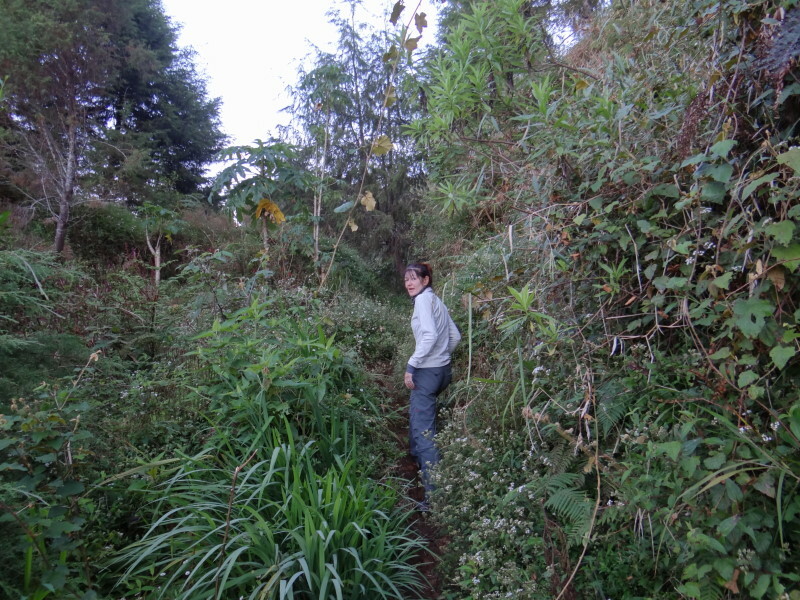 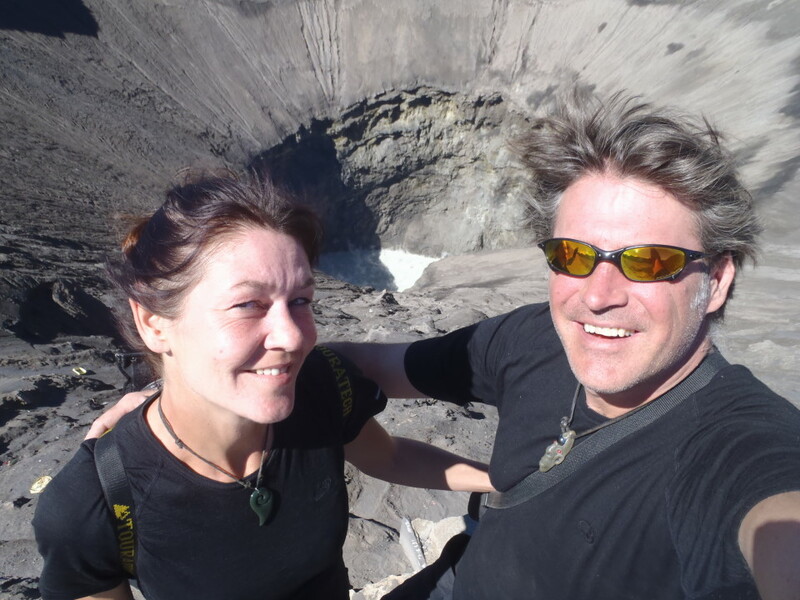 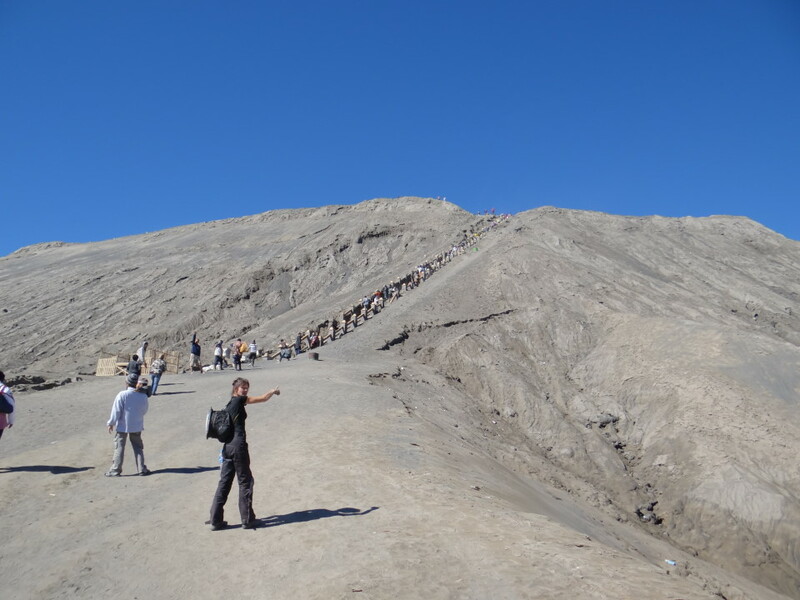 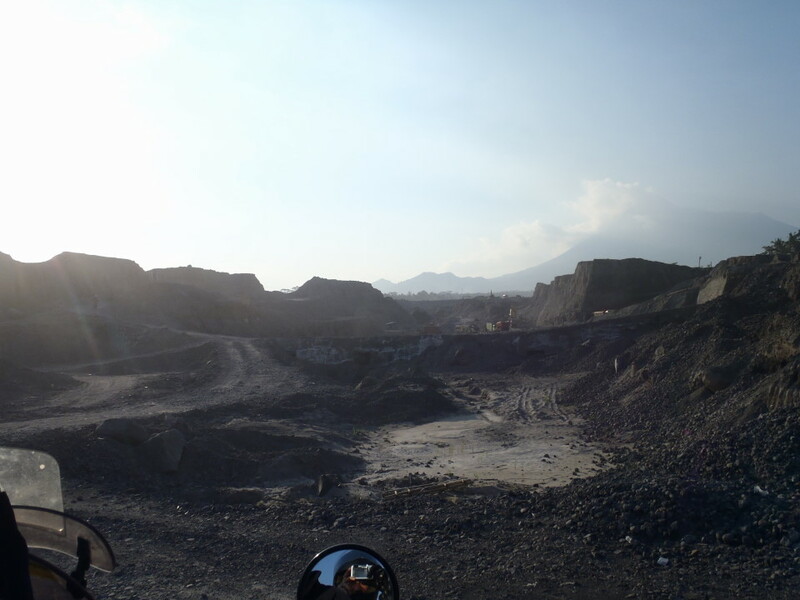 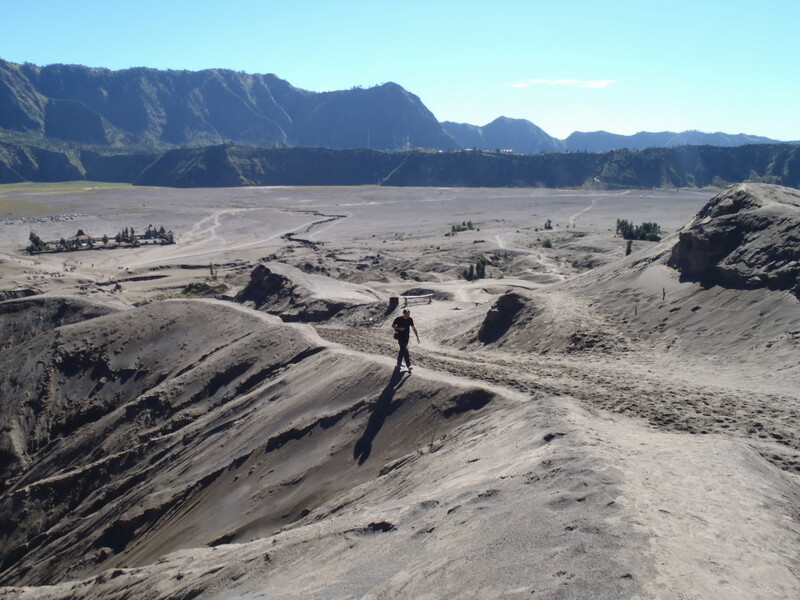 Each of the buckets they carry up the crater and then down this 3km steep dirt track is about 60kg… Unreal! 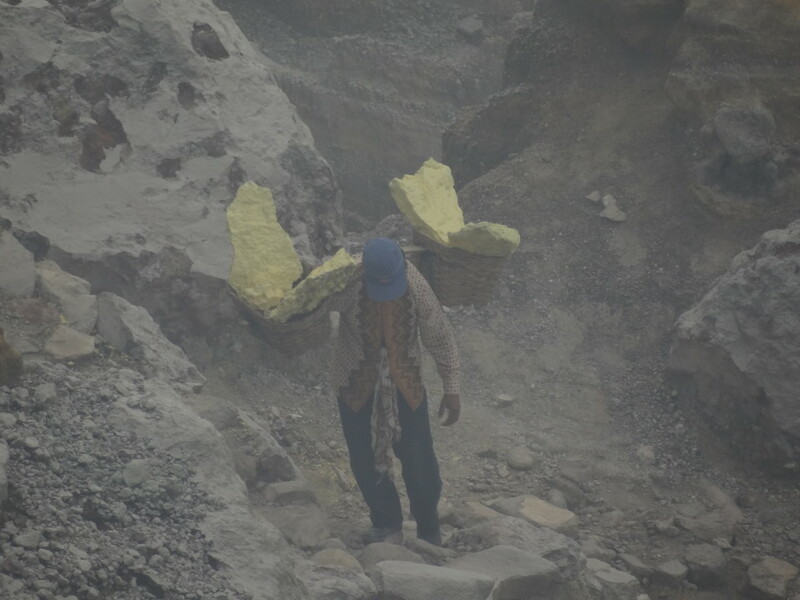 Early the next morning we had rice breakfast with coffee at a local place – and we could see already the guys coming down with their sulfur buckets. 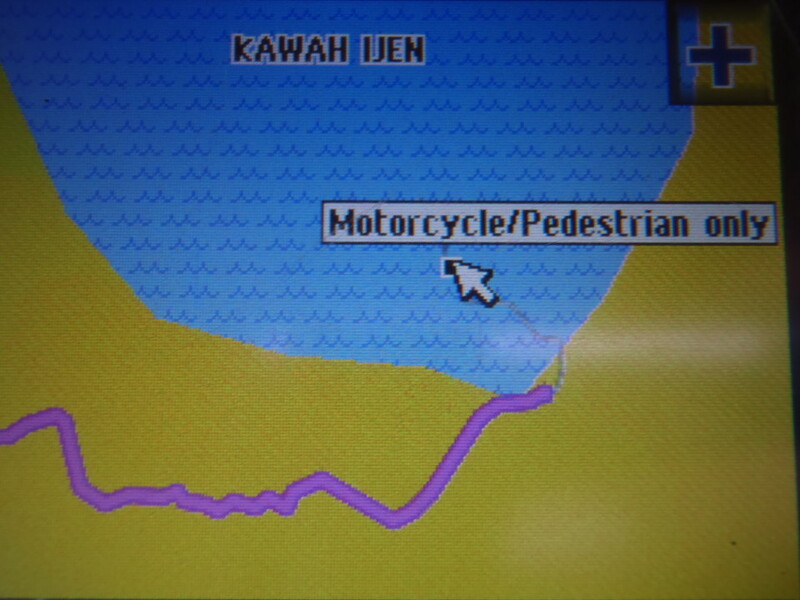 For us it was time to leave direction ferry port and we were driving down to the east coast. 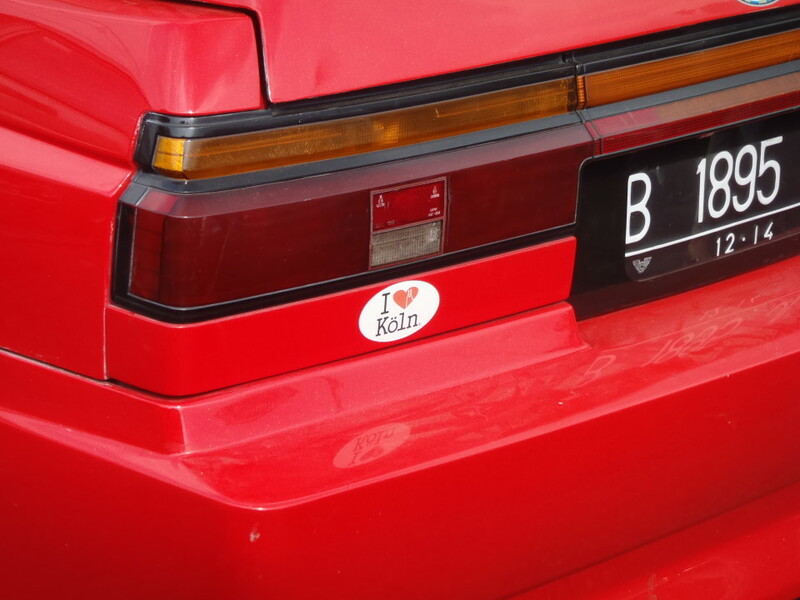 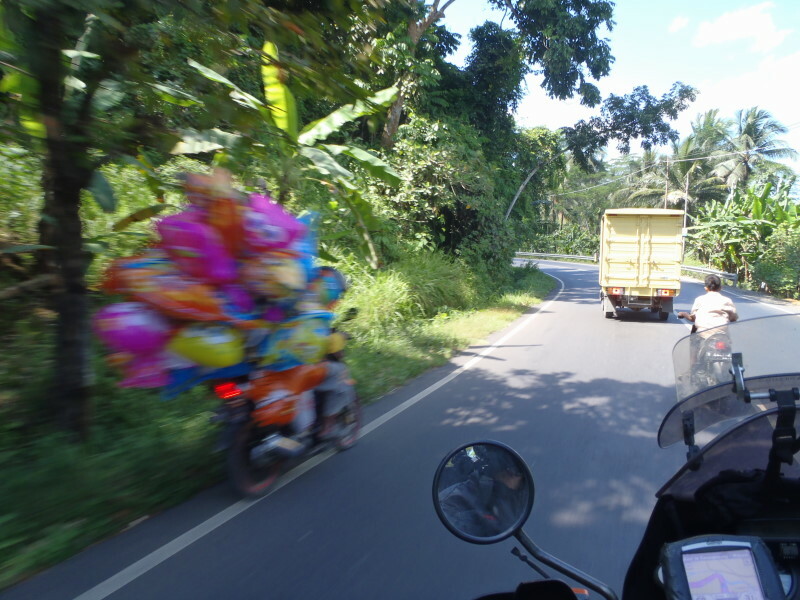 Bali is different. 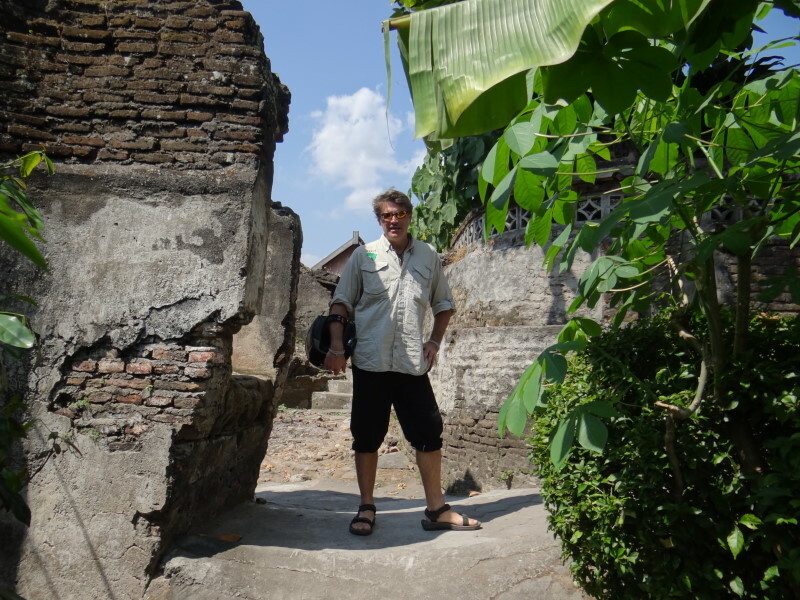 The style of buildings is different and you have a great infrastructure. 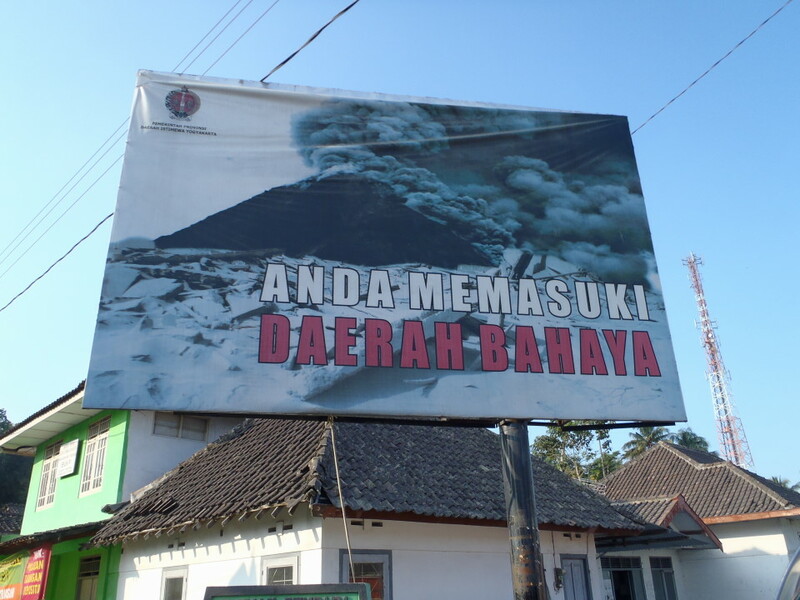 Indonesian`s tourism island number one. 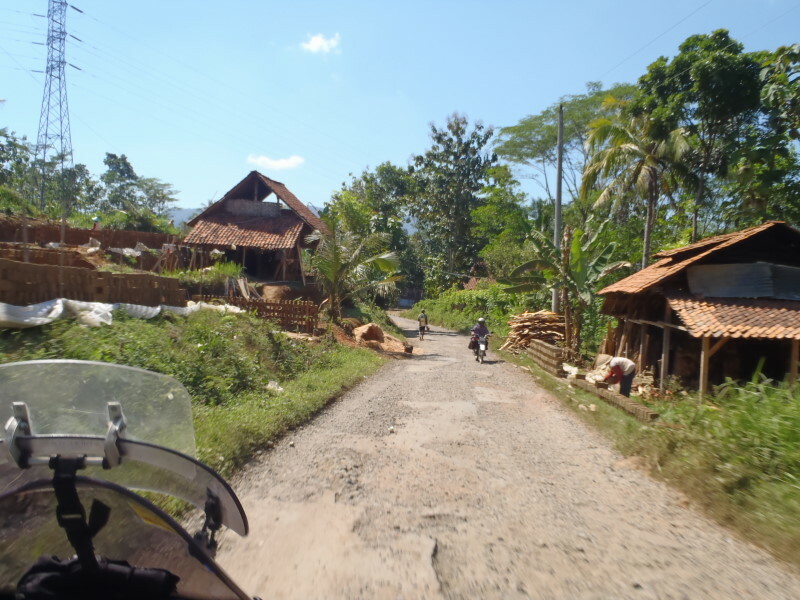 Even though we went north where less tourism is supposed to be, it is still nearly everywhere developed: resorts, homestays and hotels on each corner. 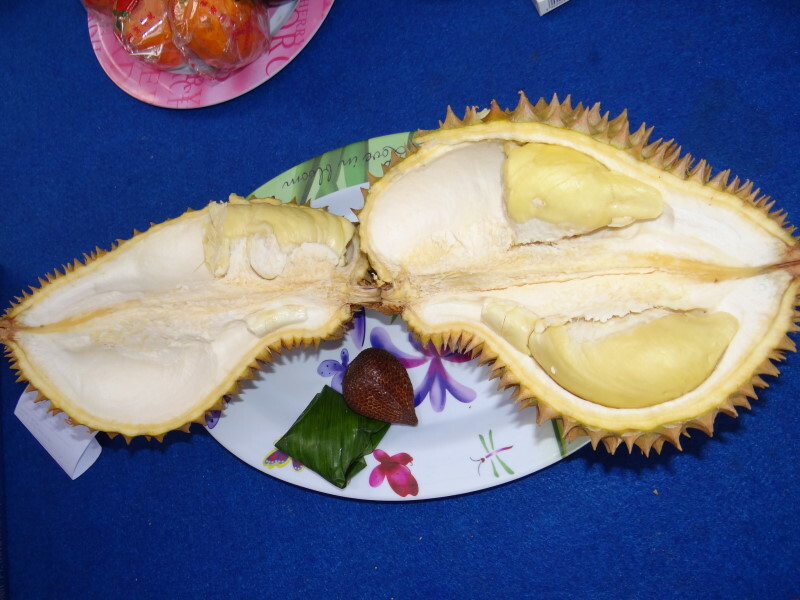 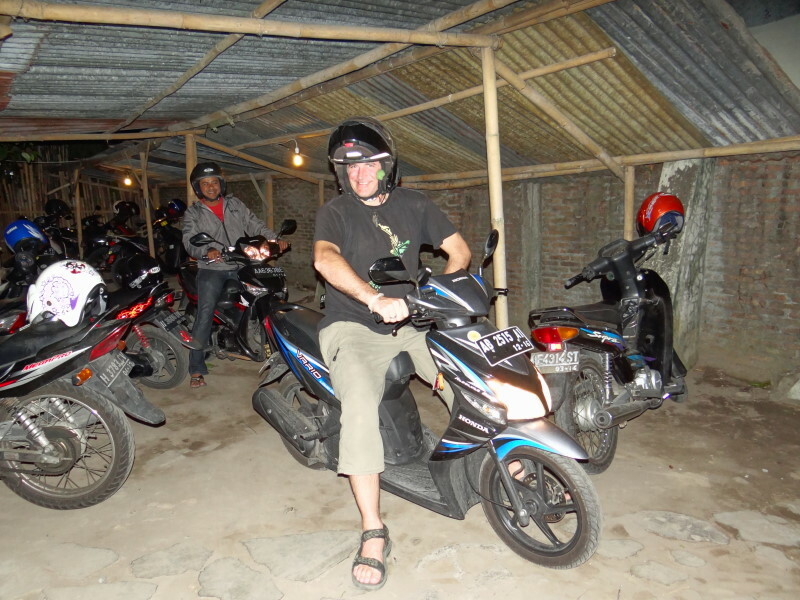 Nearly everybody is speaking English and the prices increased considerably in comparison to all other places we had been before so far in Indonesia. 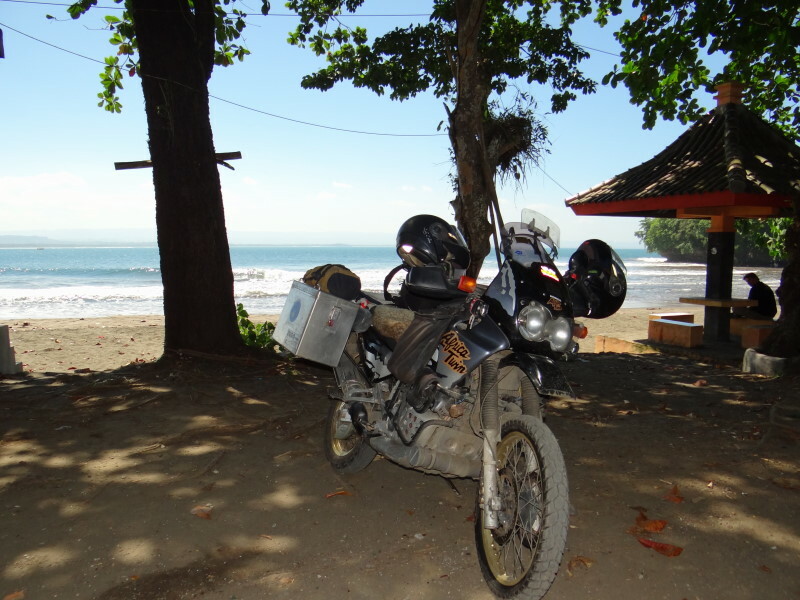 A little bit outside of Lovina beach in the little fishing village of Anturan we stayed directly at the beach front for two nights. 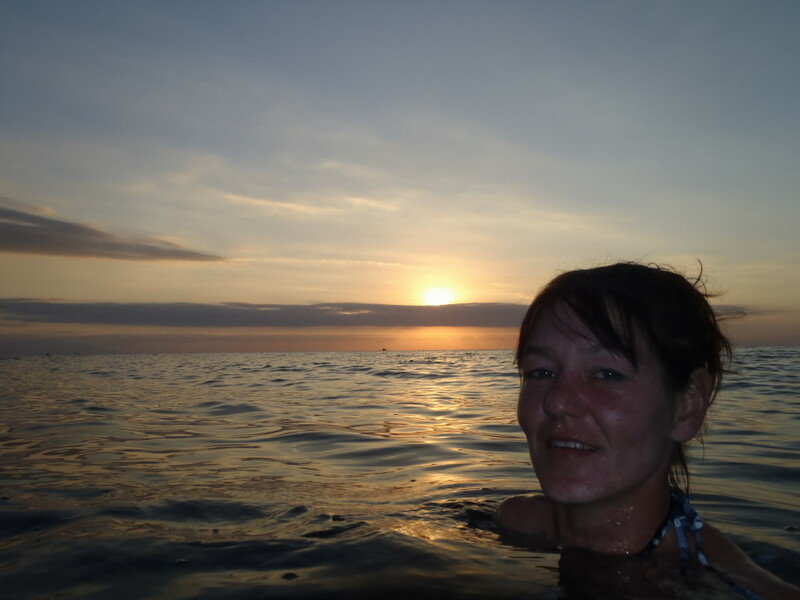 It was time for swimming, chilling and starting to work a little bit on our next update. 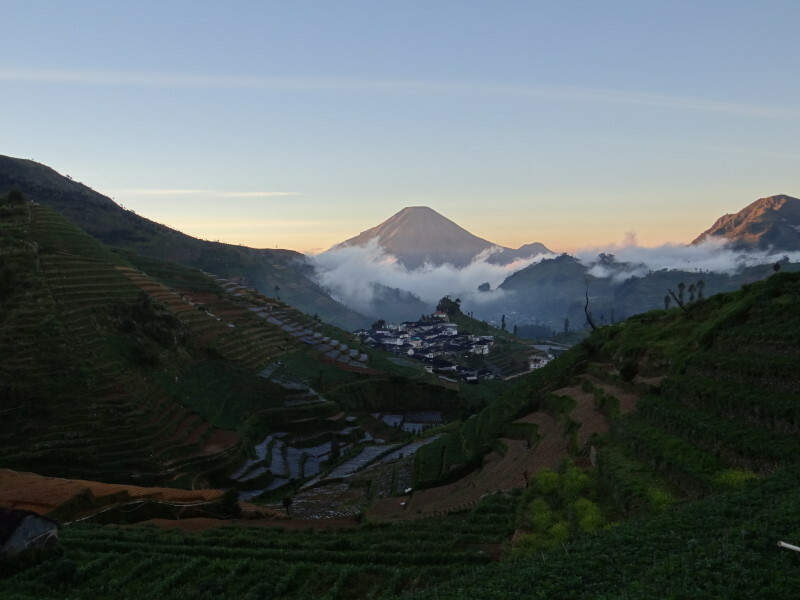 Currently we stay in Ubud located in the hilly inland surrounded by rice paddies. 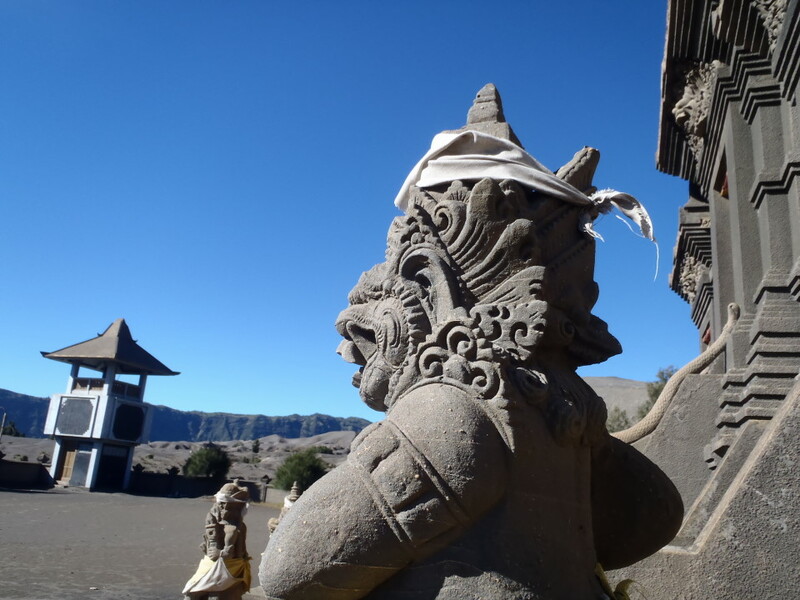 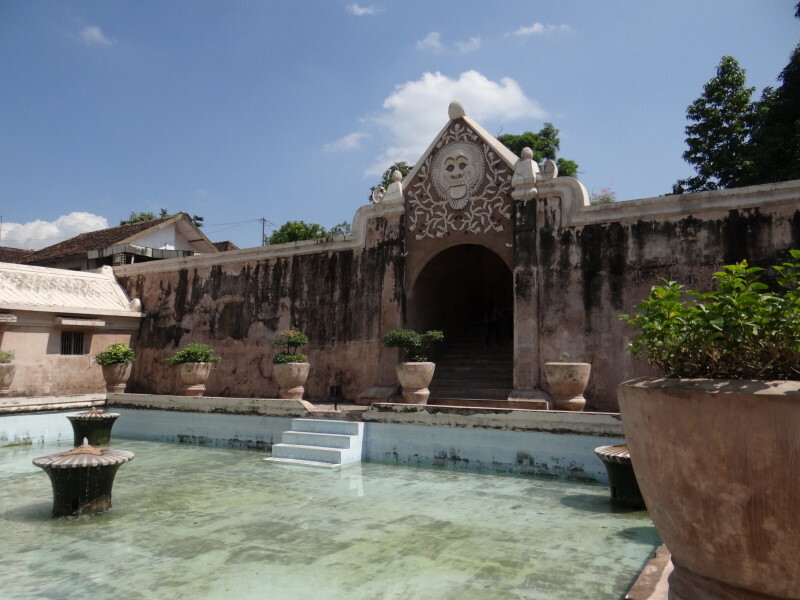 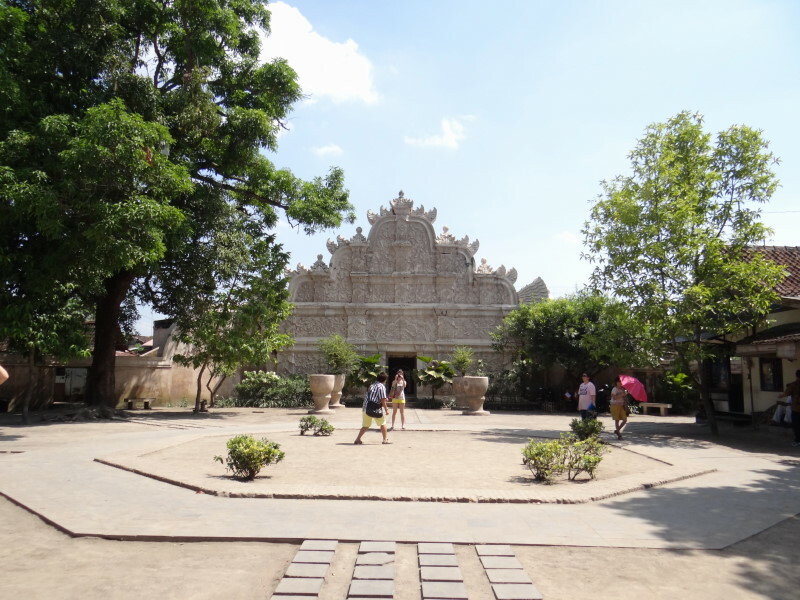 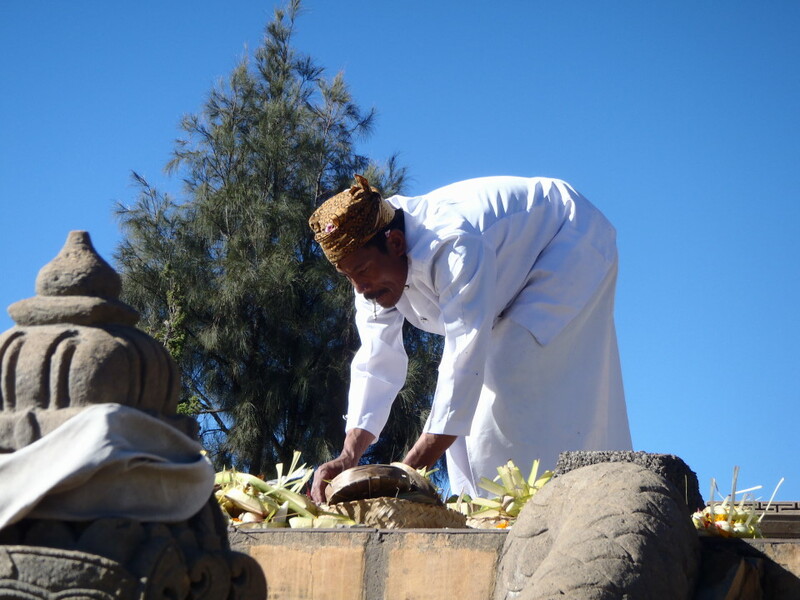 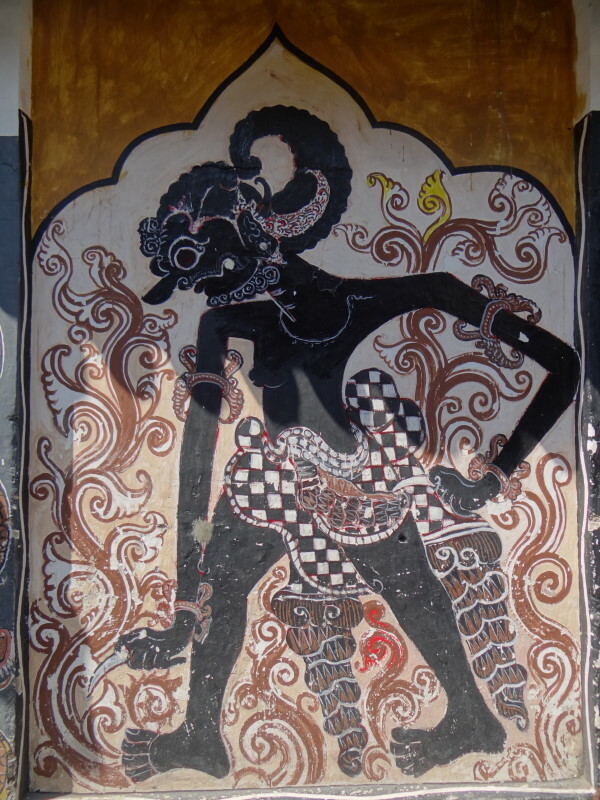 It´s focus remains on Balinese culture and around are temples, ancient sites and handicraft villages. 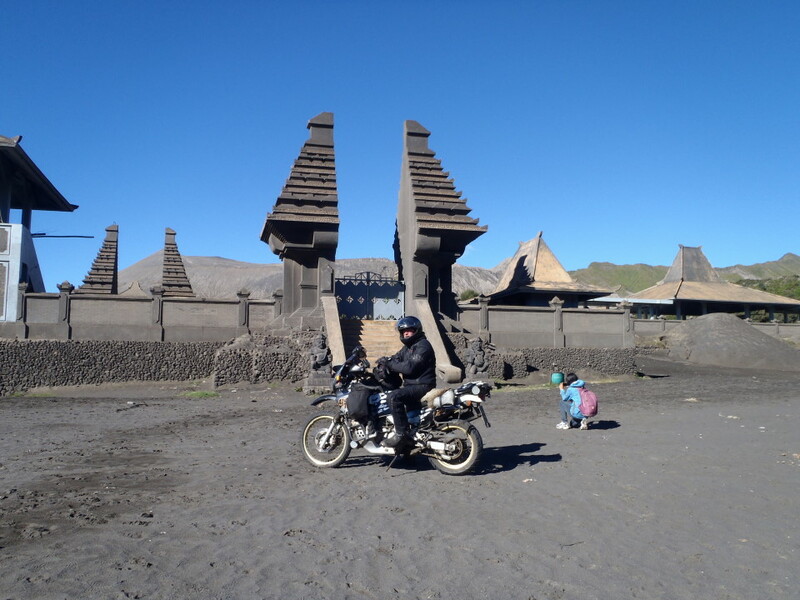 Sometimes it seems you are driving through a giant museum. 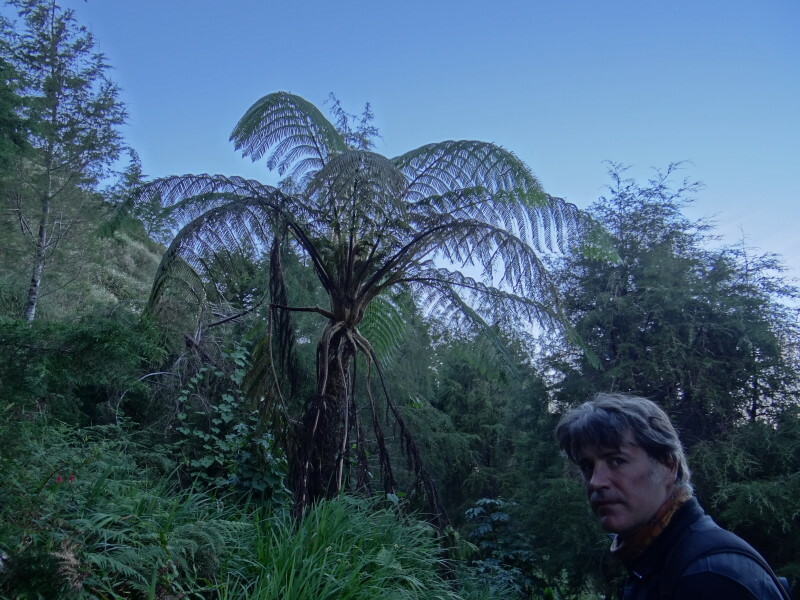 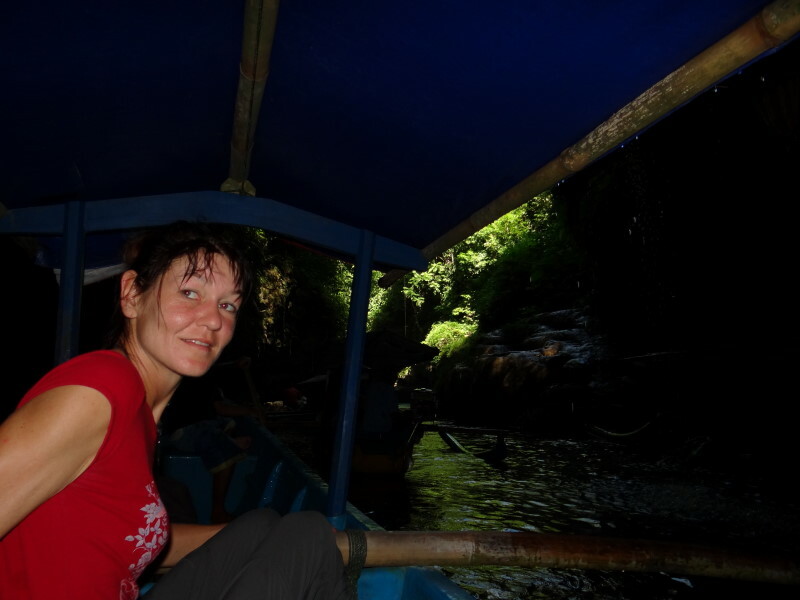 We found a nice place a little bit outside in the jungle for a fair price. 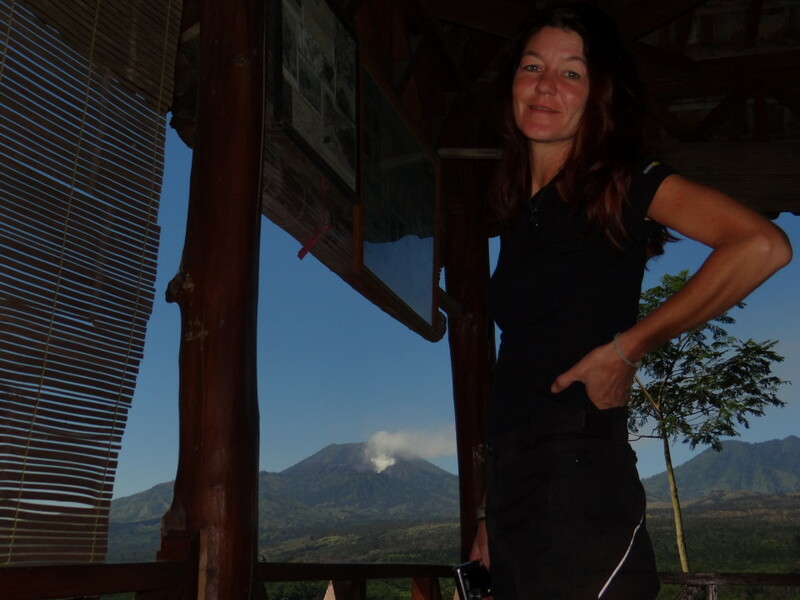 A huge room with terrace facing the jungle, own bathroom with hot shower, drinking water, coffee and tea and much as we want and a great breakfast included for about 8€. 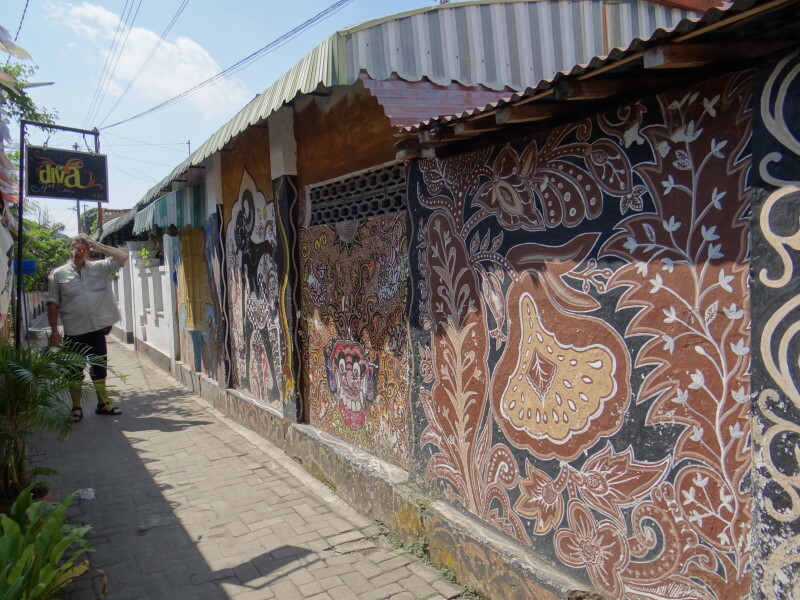 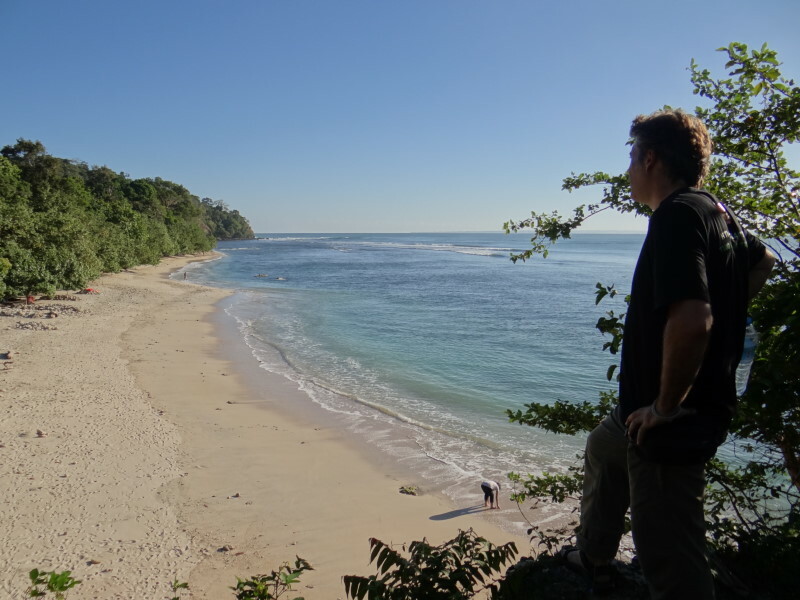 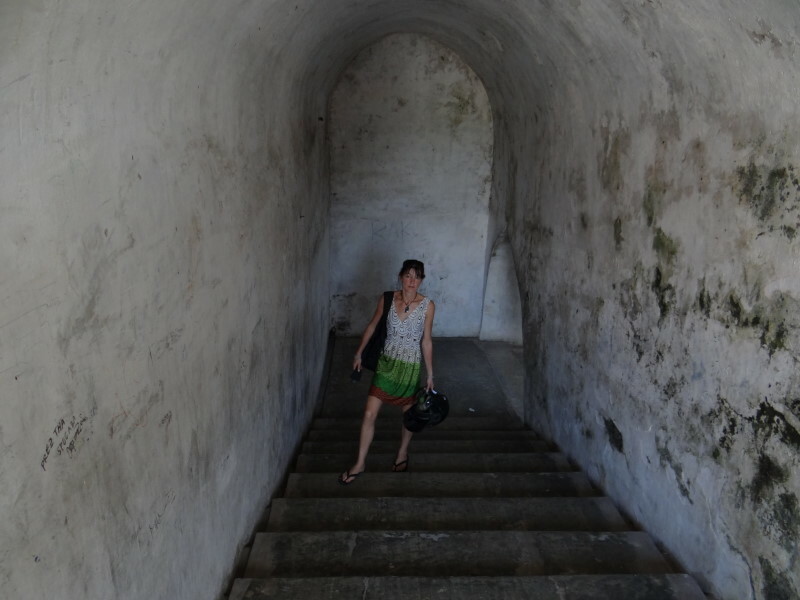 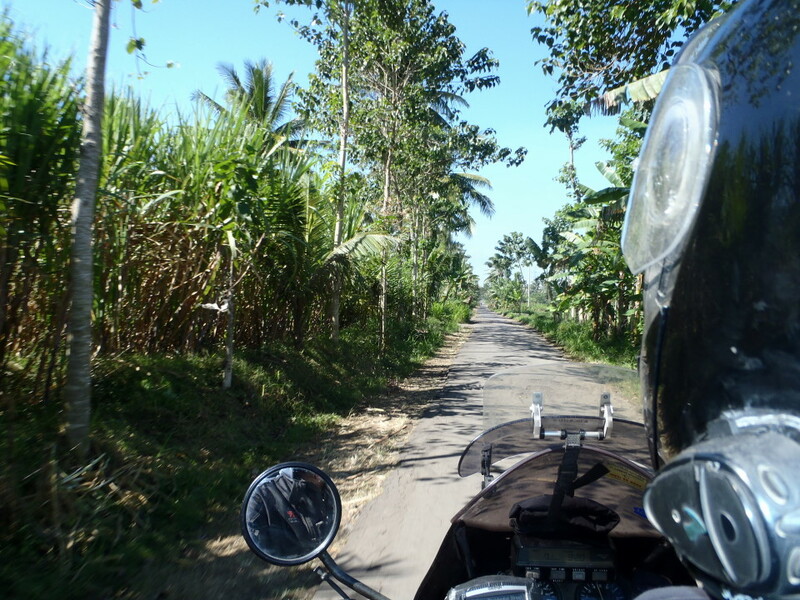 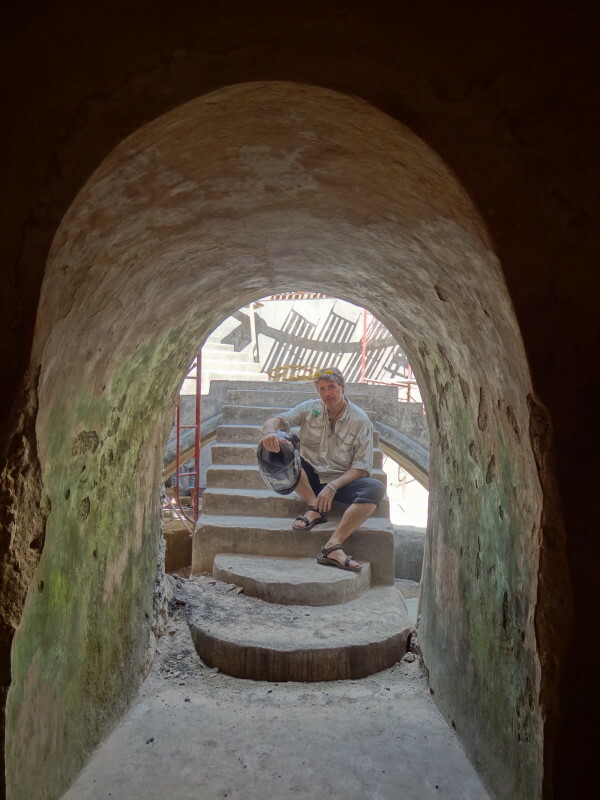 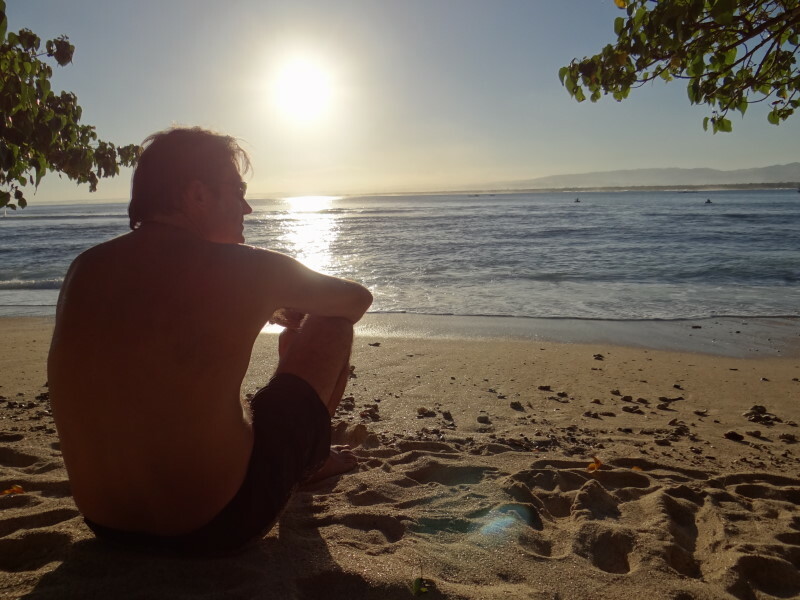 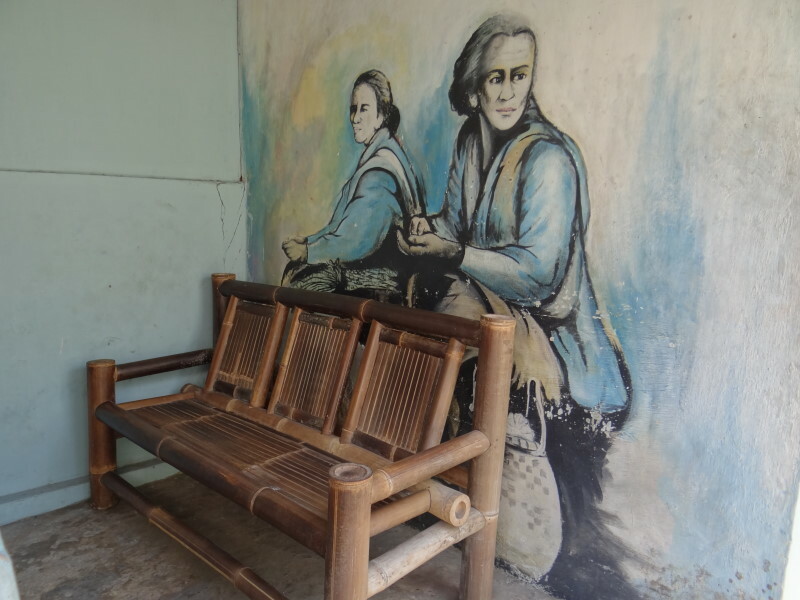 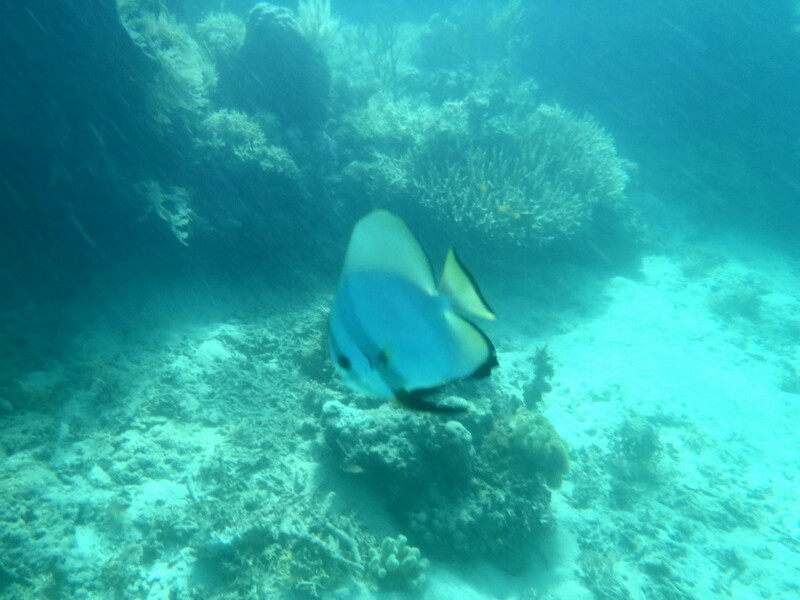 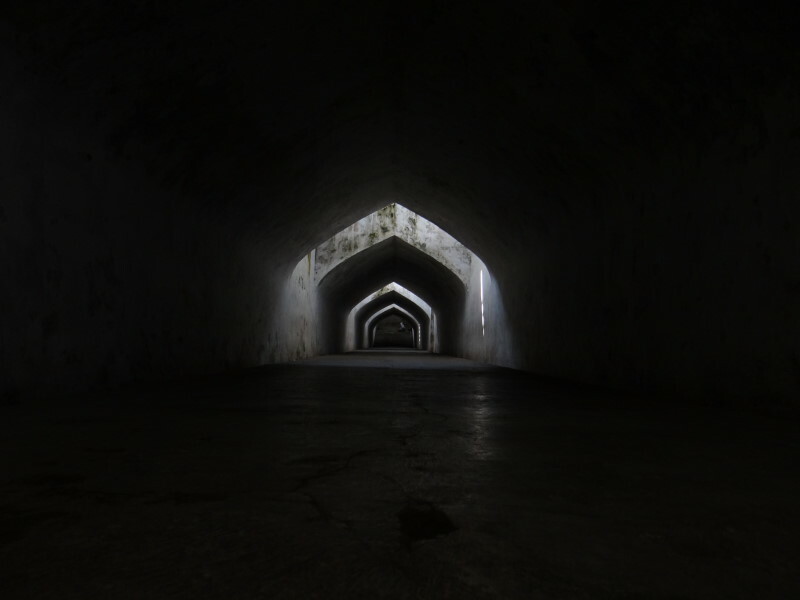 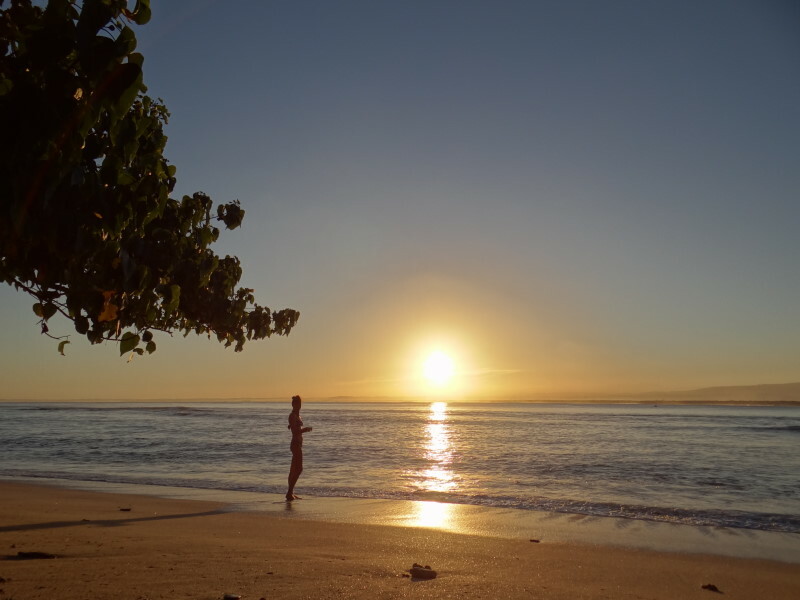 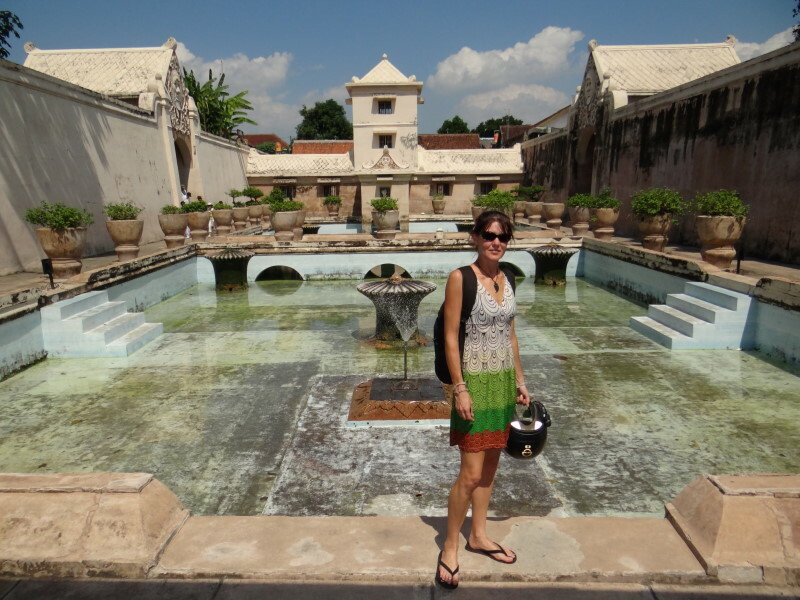 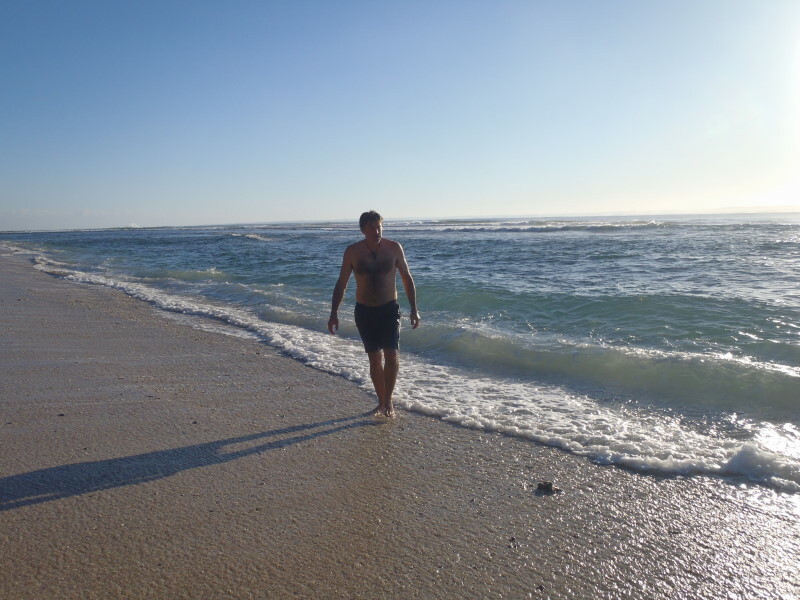 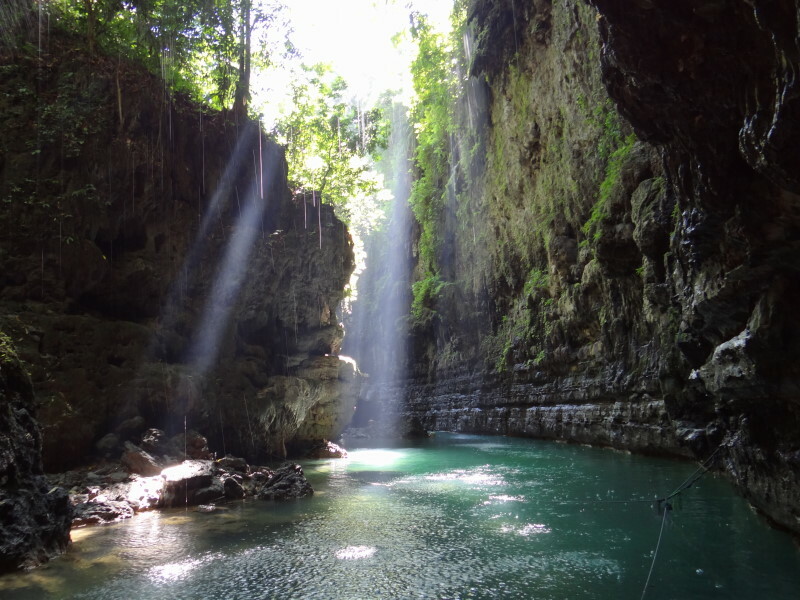 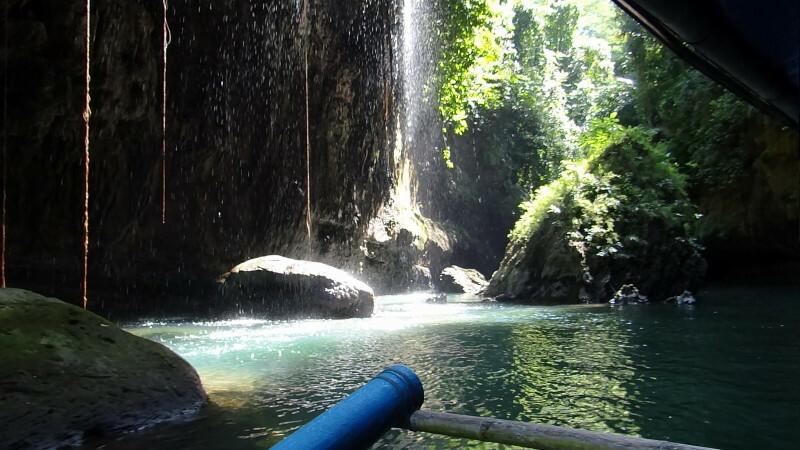 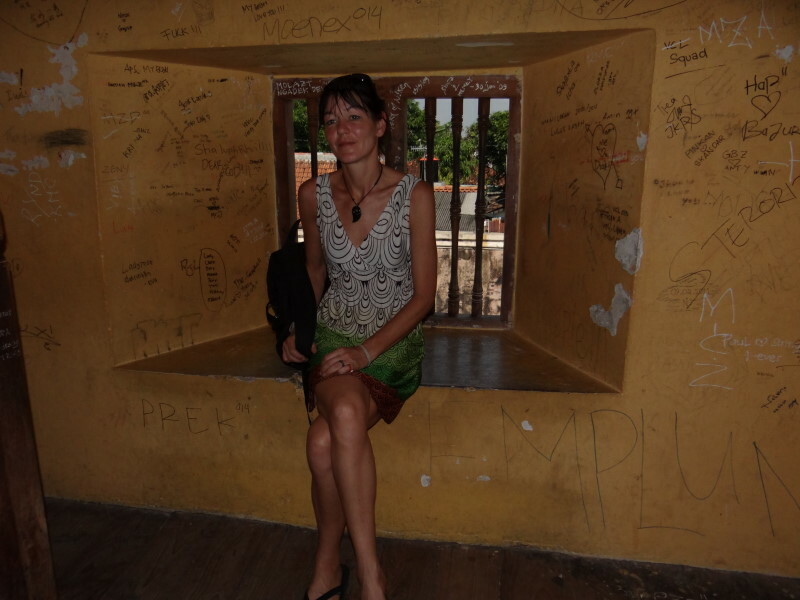 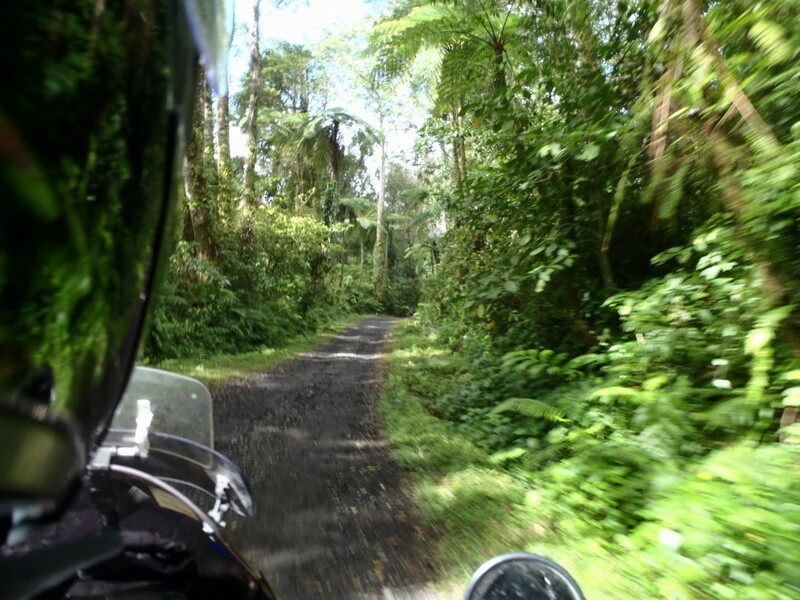 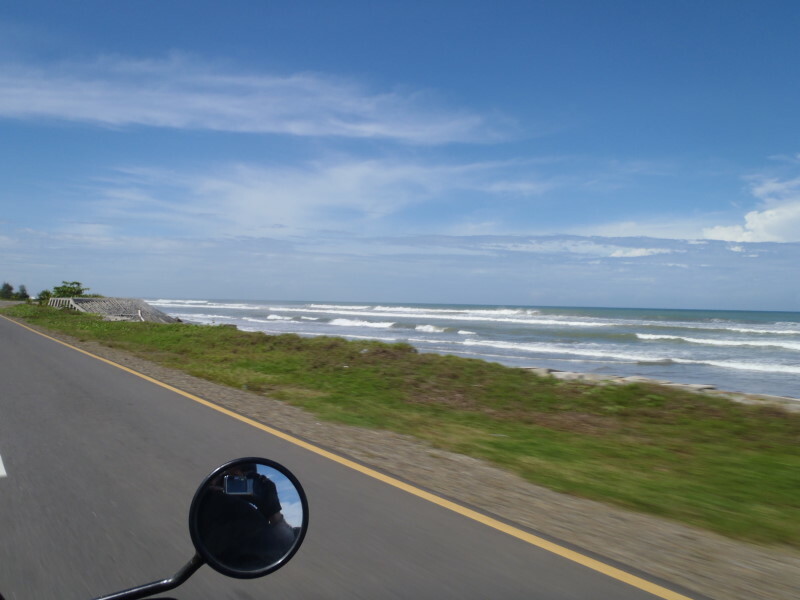 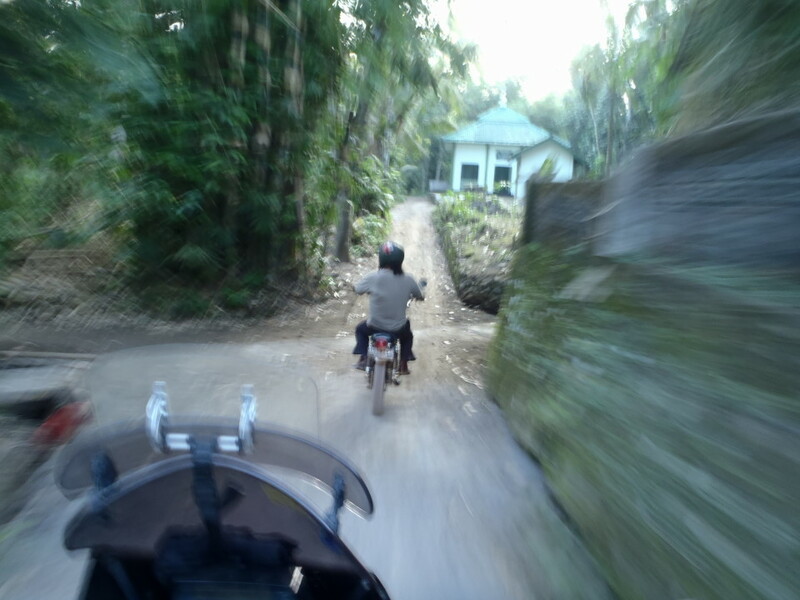 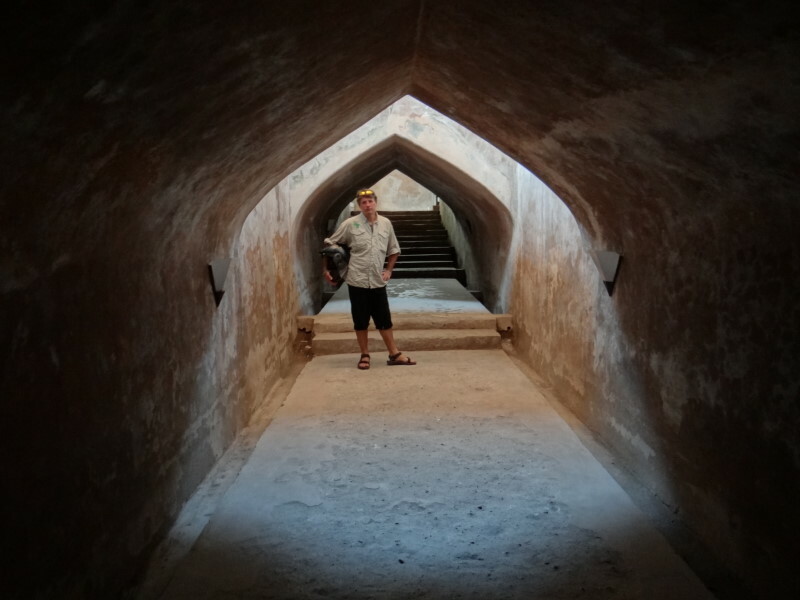 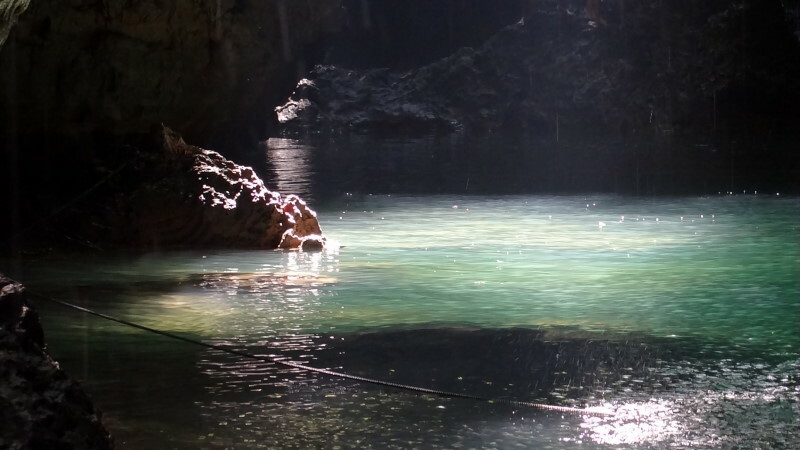 This we took as our base to explore the rest of Bali and finishing our update of the blog. 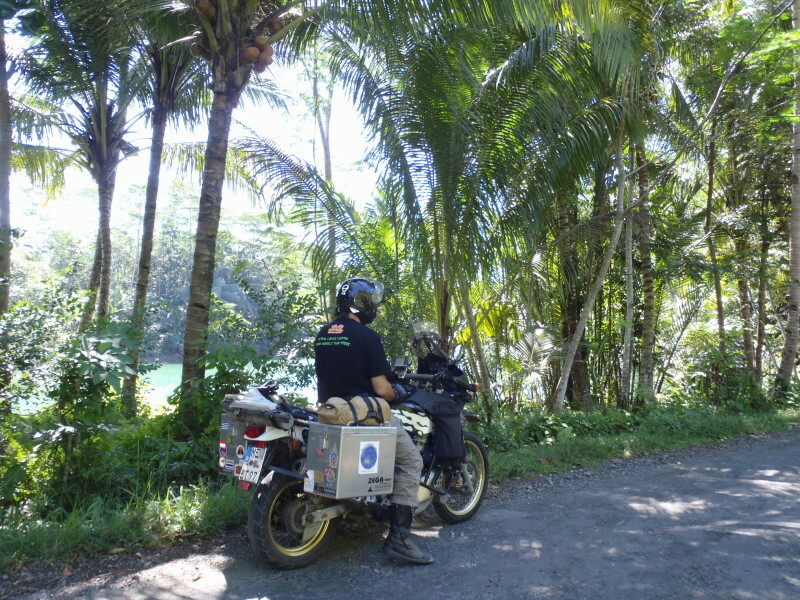 Recovered we left lake Minanjau on a mountain road towards the west coast. 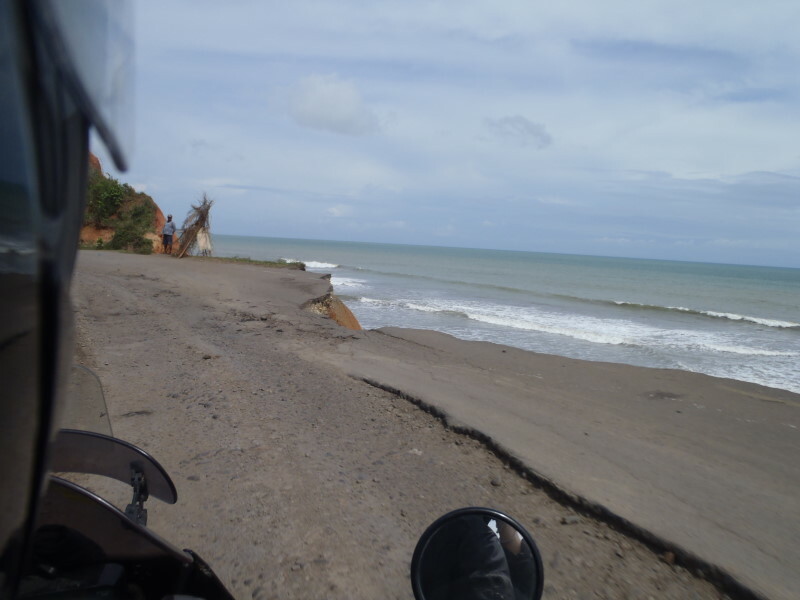 Smelling the sea we rode down until we reached a little beach south of Padang. 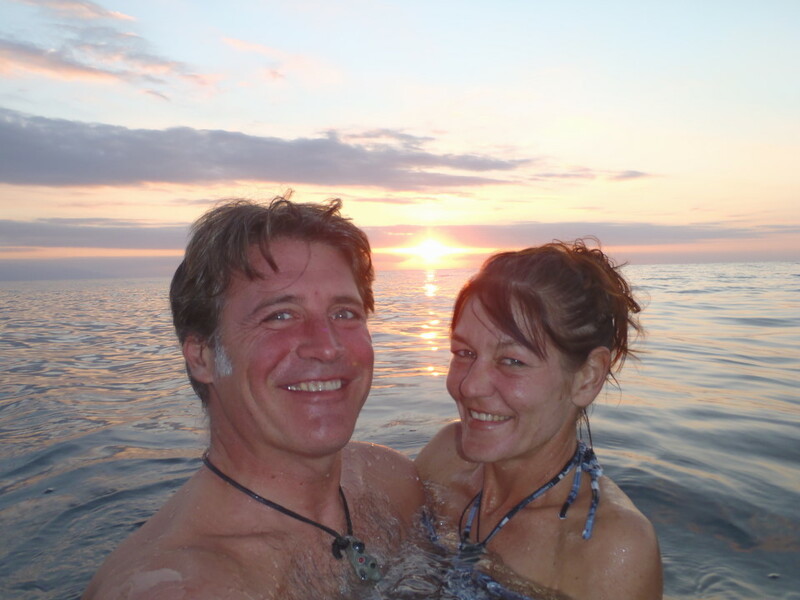 We had a jump into the ocean and were chilling at the beach directly in front of our room until late night. 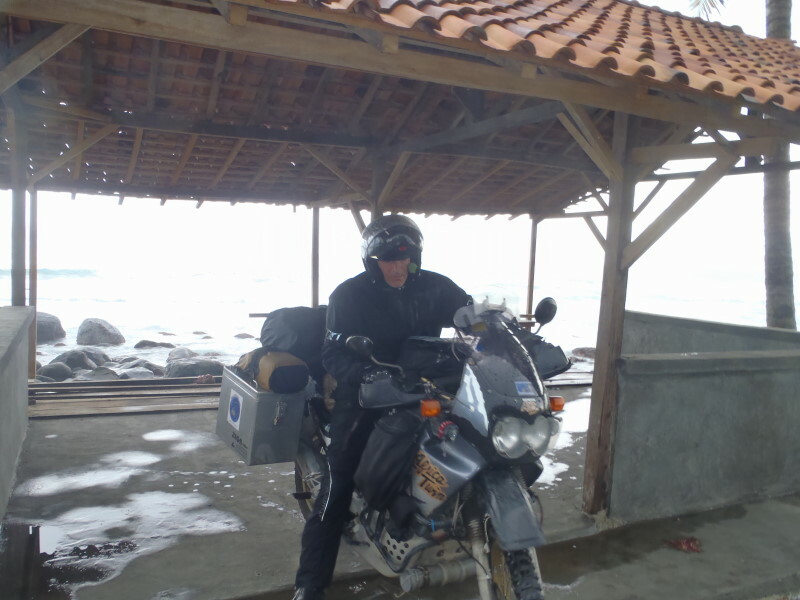 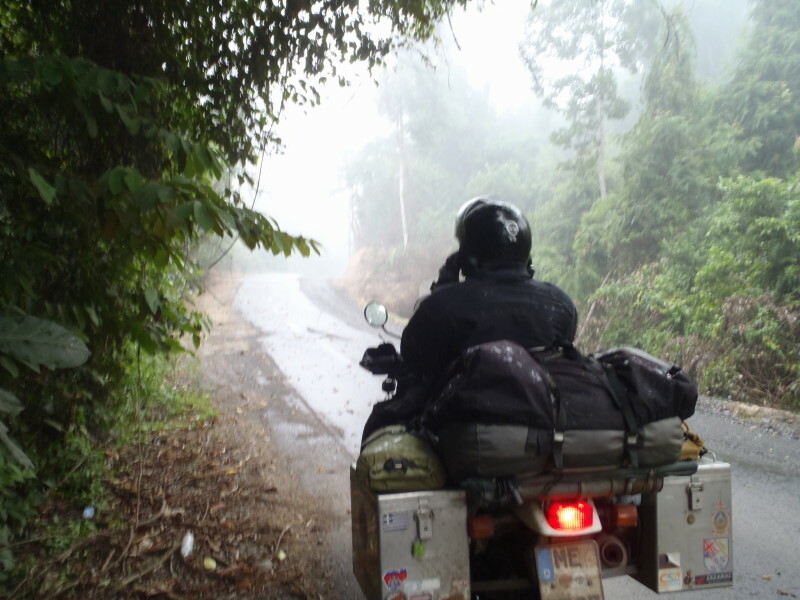 Heading further south along the coast the rain caught us half way to Krui. 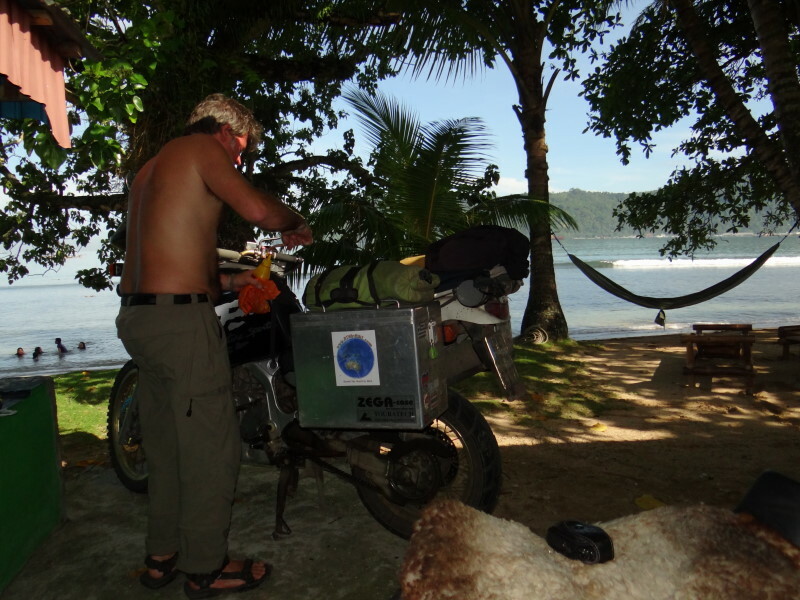 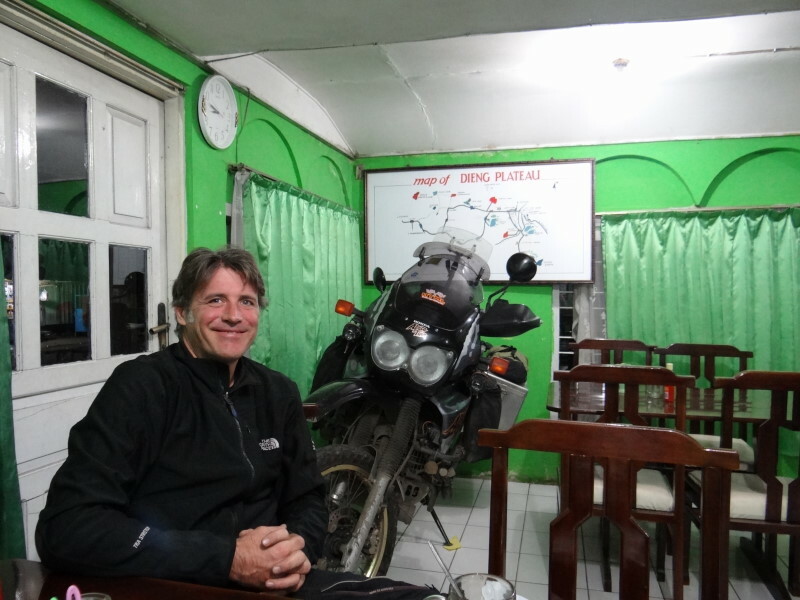 Krui is a well-known surf location and we had difficulties to find a non over prized accommodation. 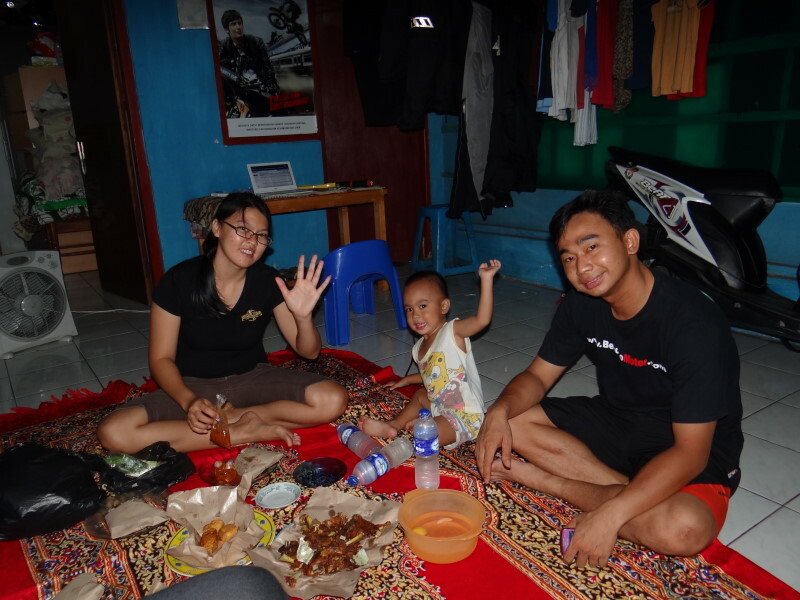 In the end we did, we hung out our clothes for drying and went for dinner. 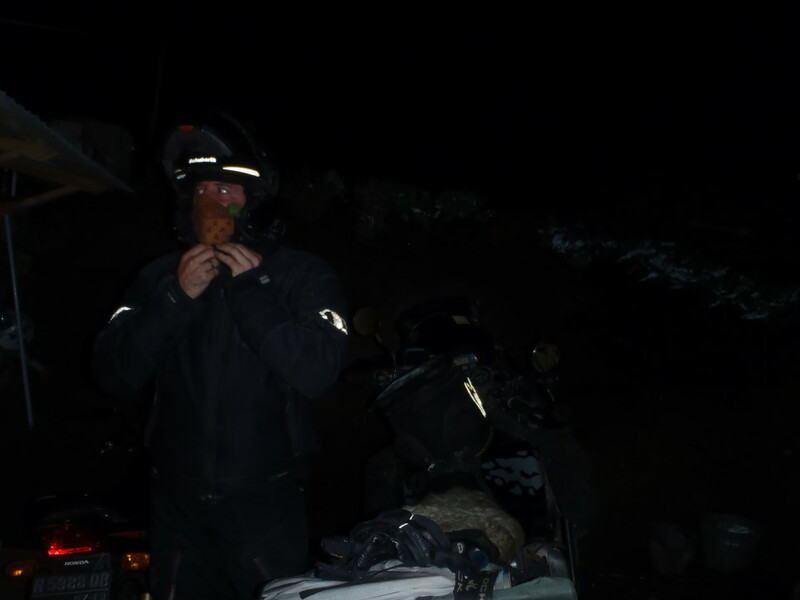 Unfortunately the food was not good and the result was that Kerstin hanging on the toilet for the whole night. 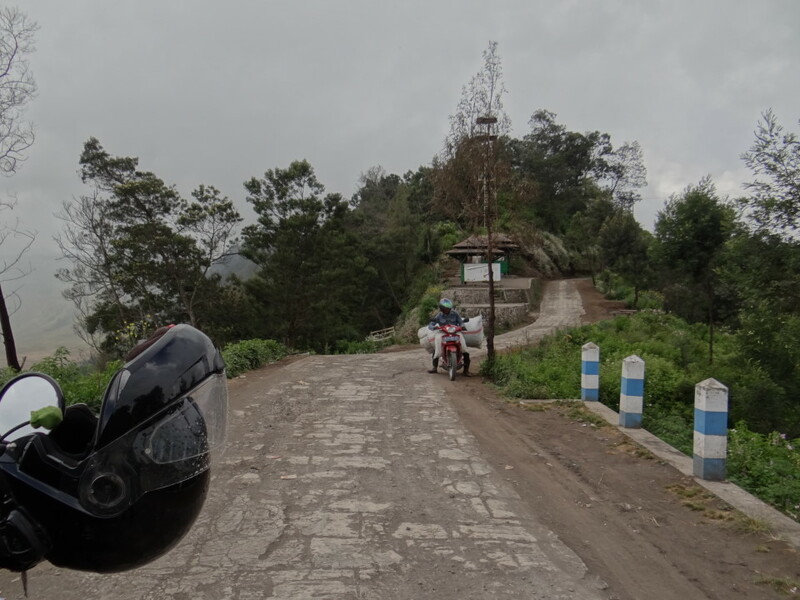 Not feeling well and flabby we decided to go only until Danau Ranau a small volcanic lake close by in the mountain. 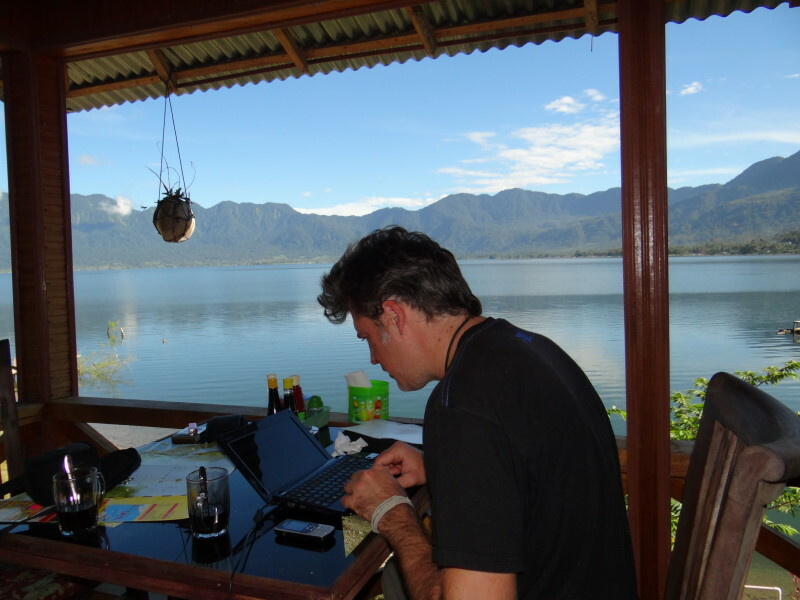 Not many accommodation offers in that area are available but in the end we found a nice family where we could stay with a view over the lake and got served with tea. 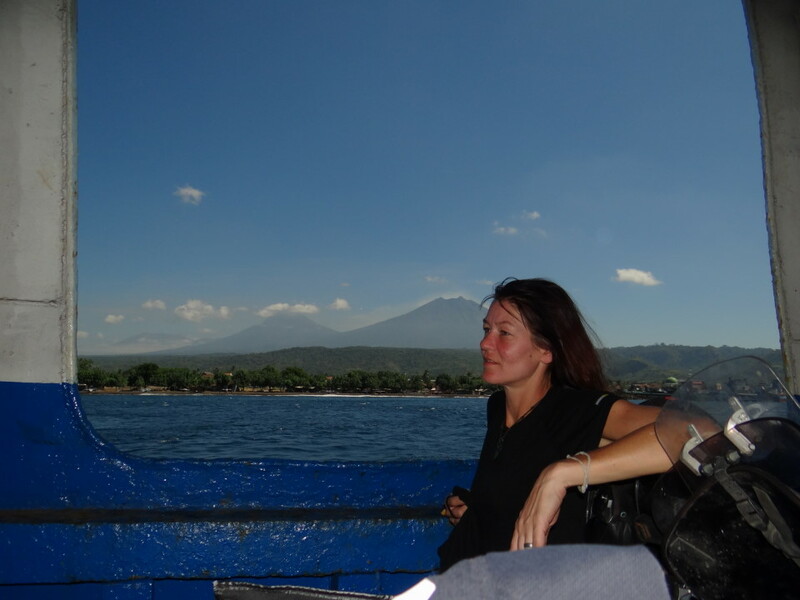 The next morning we left for the ferry to Java. 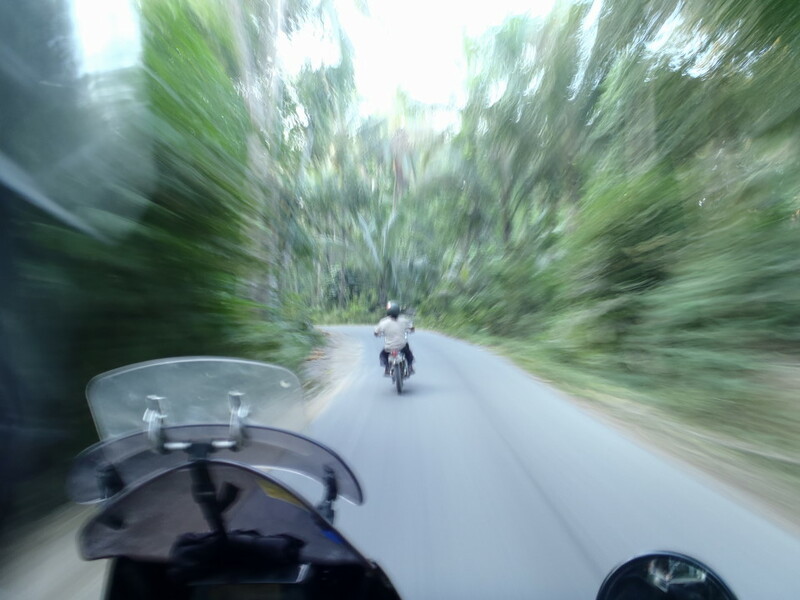 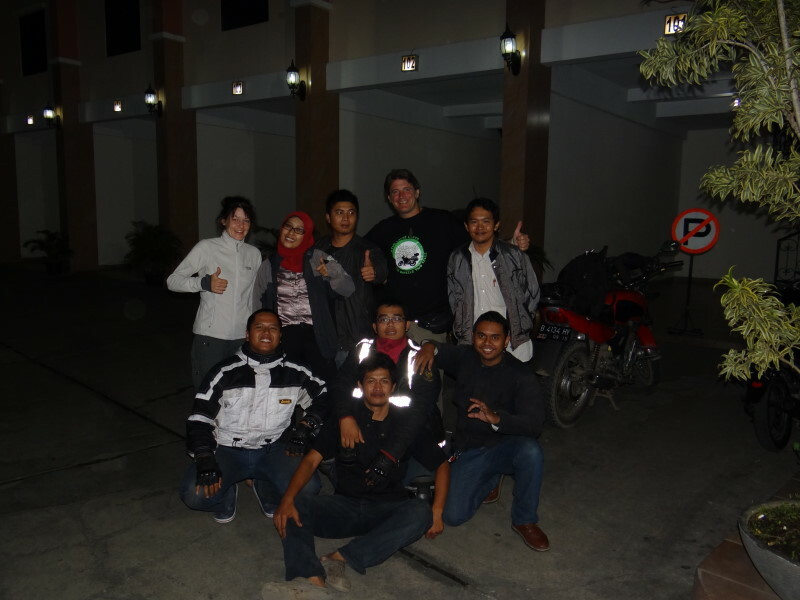 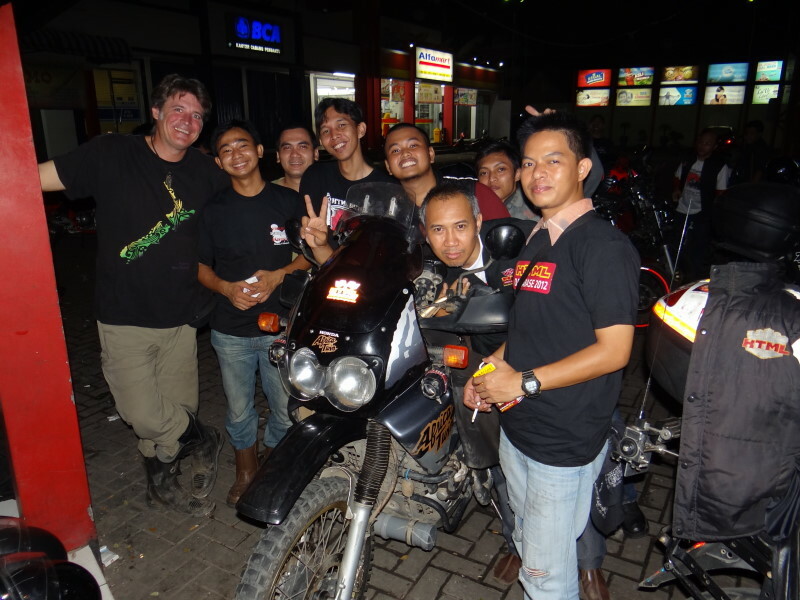 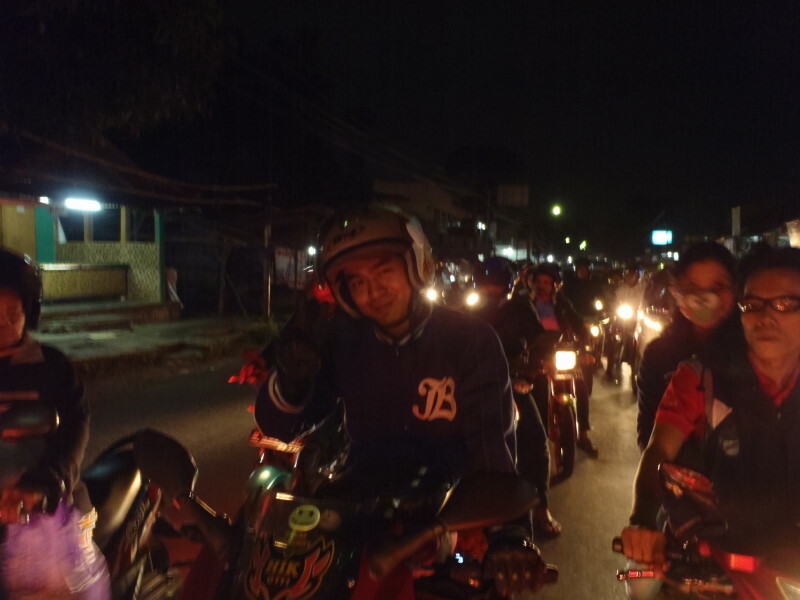 We were in contact already with Lutson, a member of the HTML- Club (Honda Tiger) from Tangerang and he organized that we get picked up by some club members from Cilegon which is close to the ferry port. 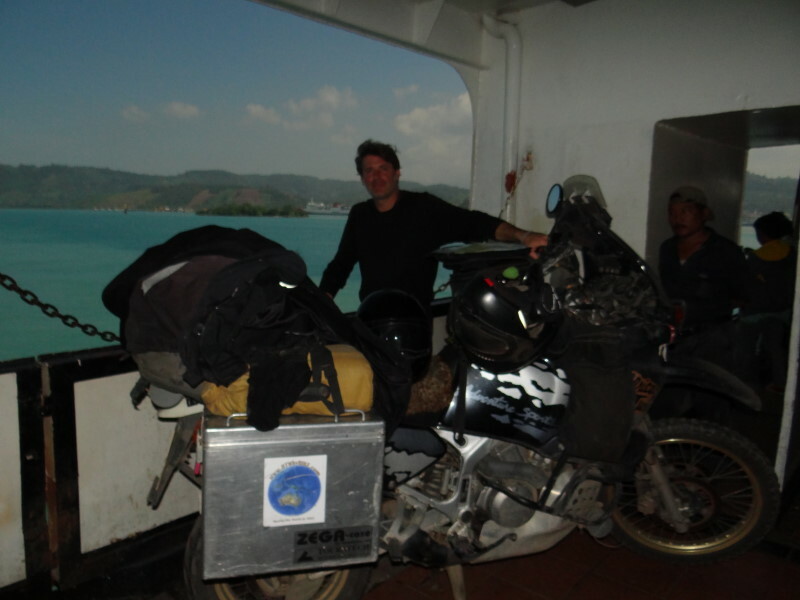 We jumped on the ferry and after 2,5 hours we arrived at Java. 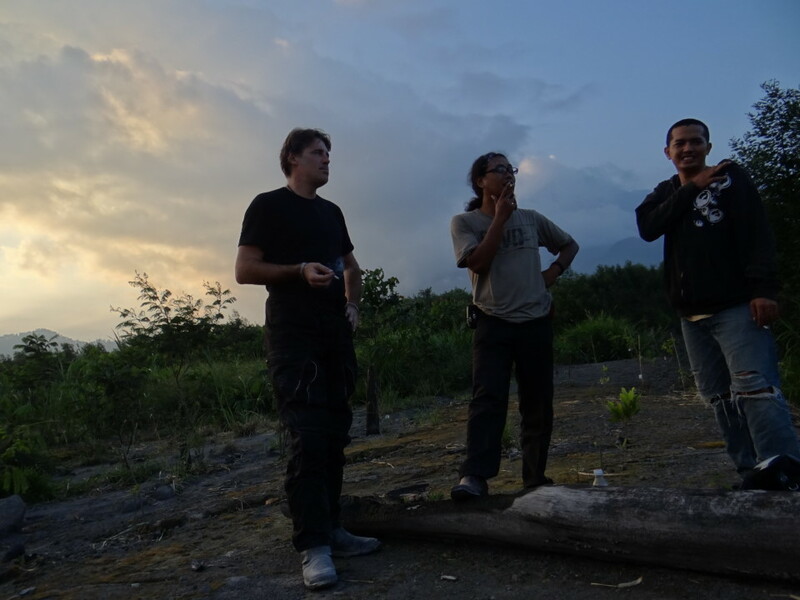 A view minutes later three guys from the HTML-Club arrived. 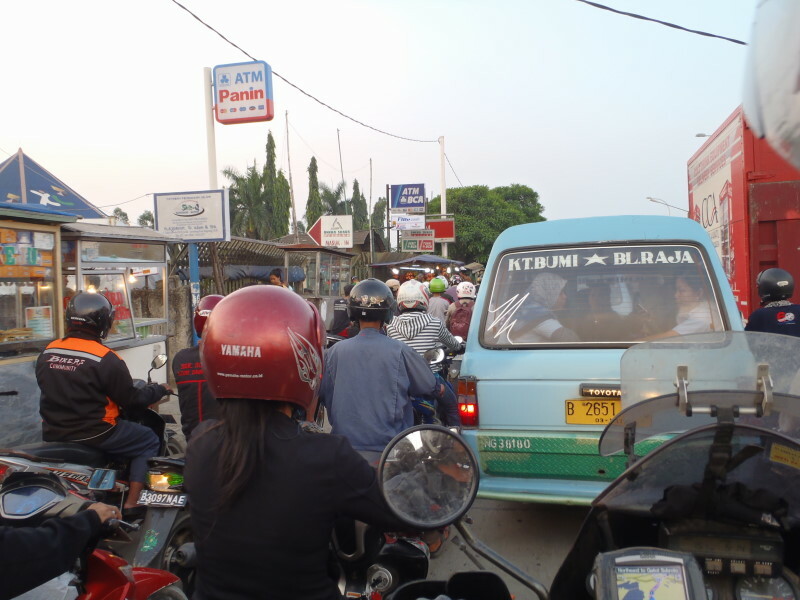 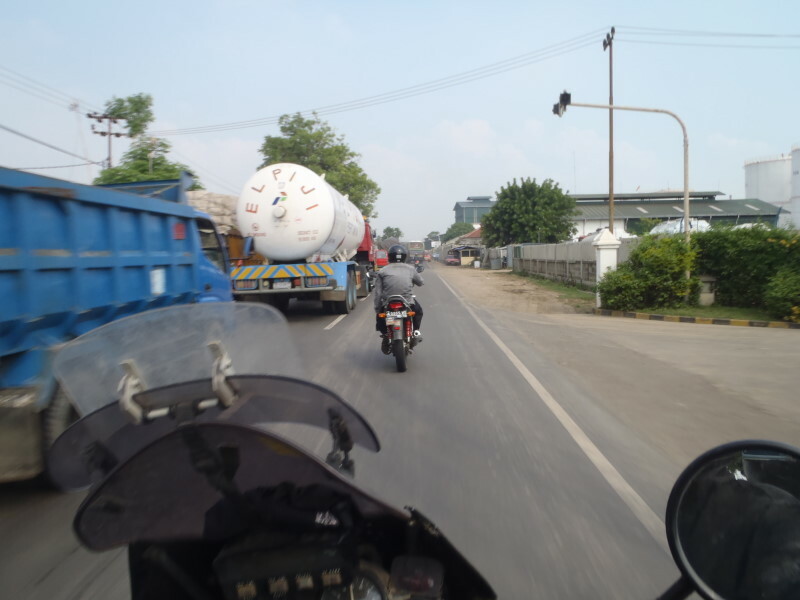 They escorted us until we got out of Cilegon on the right road to Tangerang. 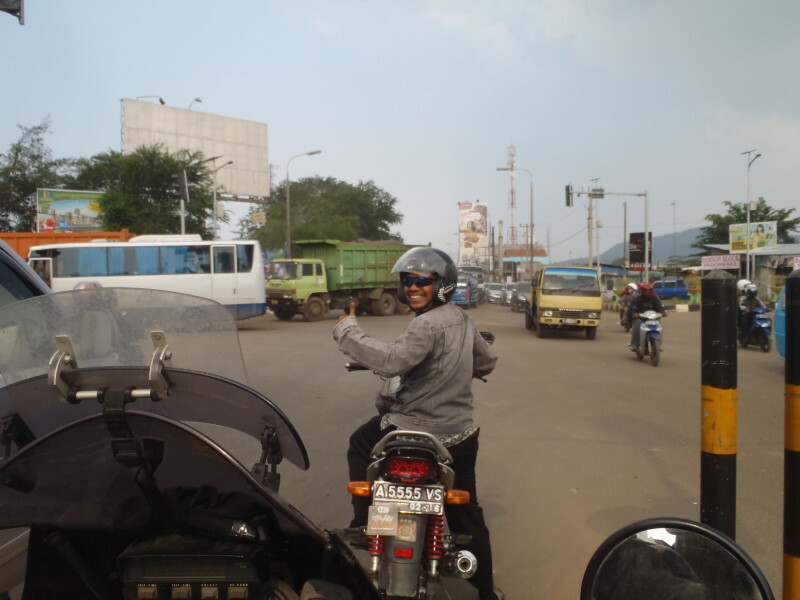 It was just great how fast we got through the traffic! 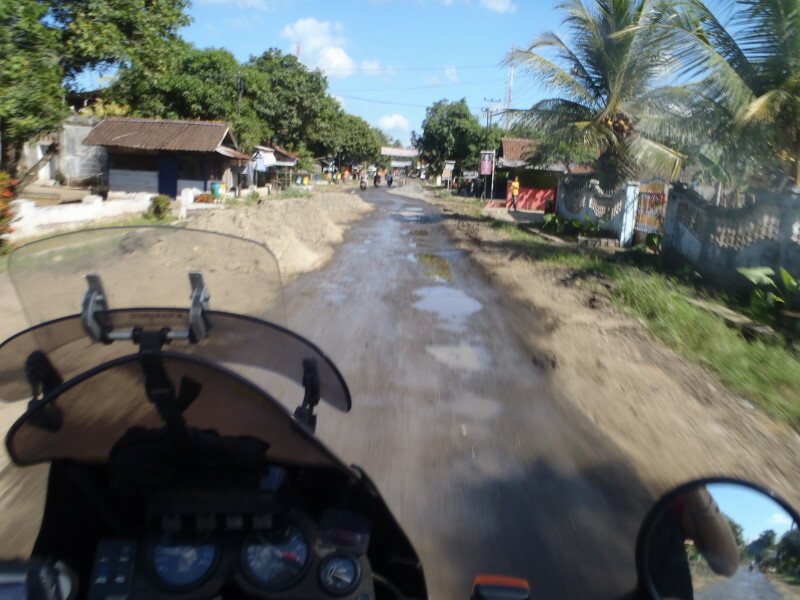 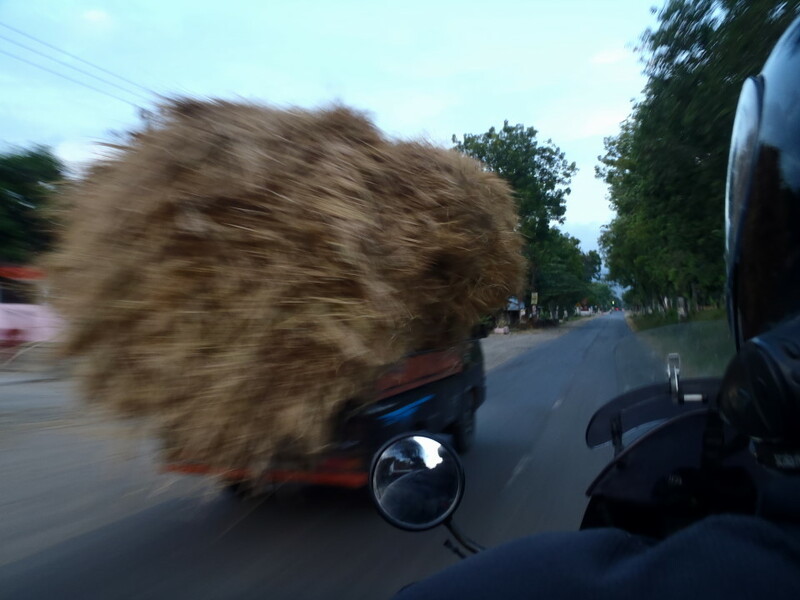 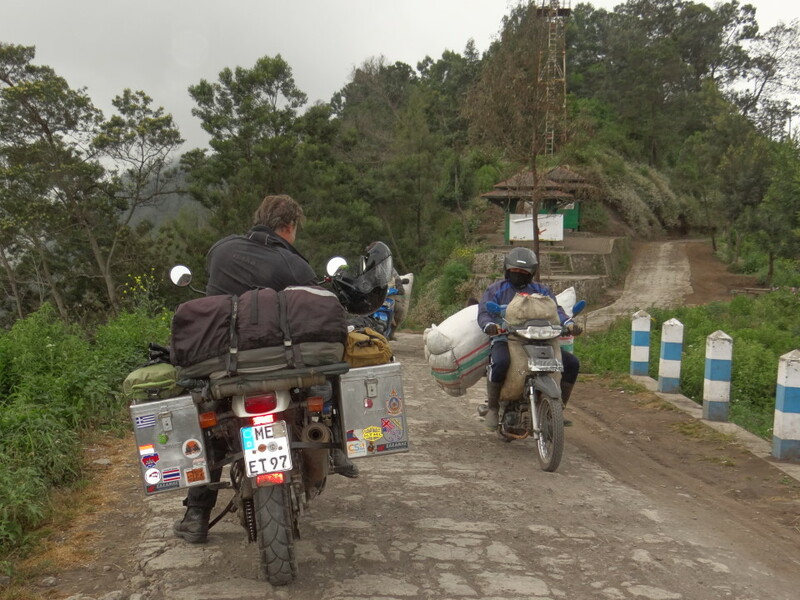 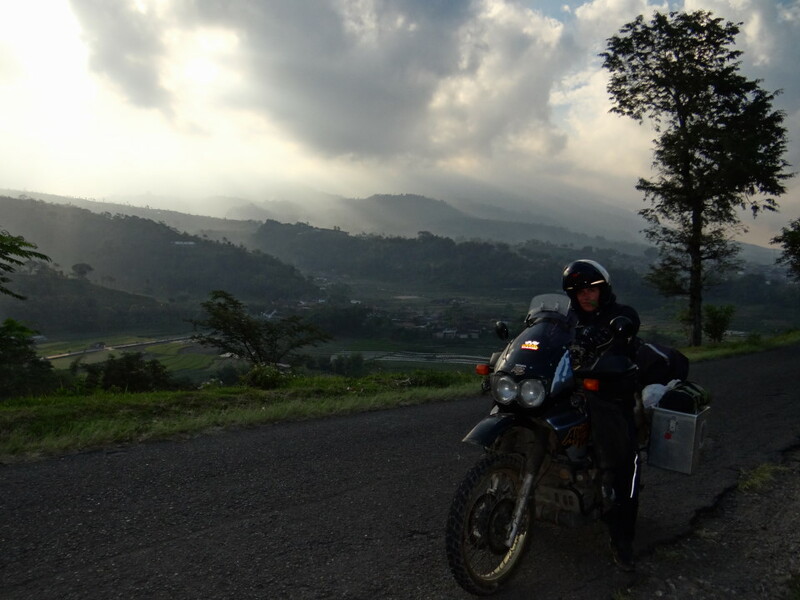 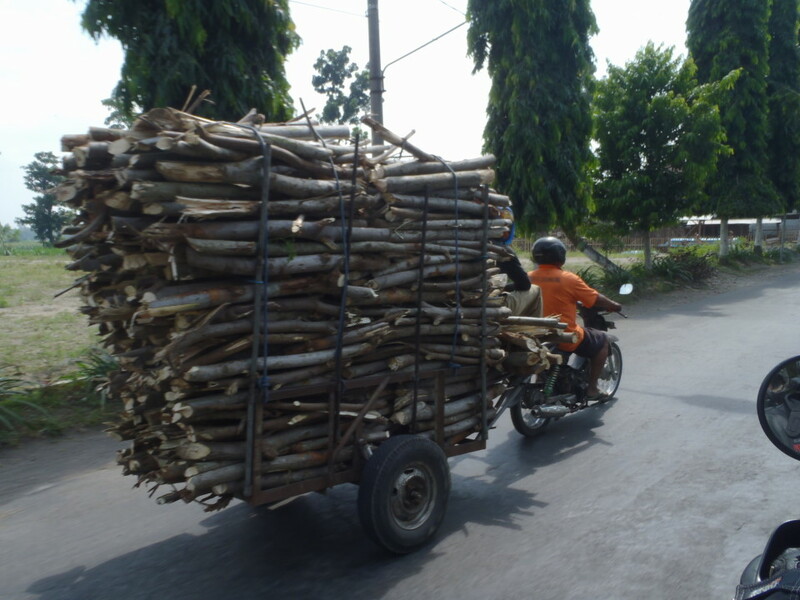 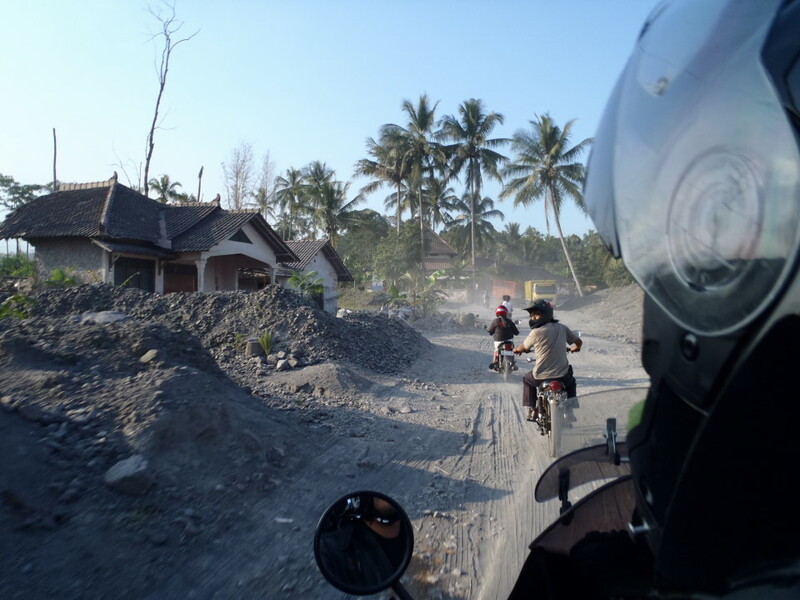 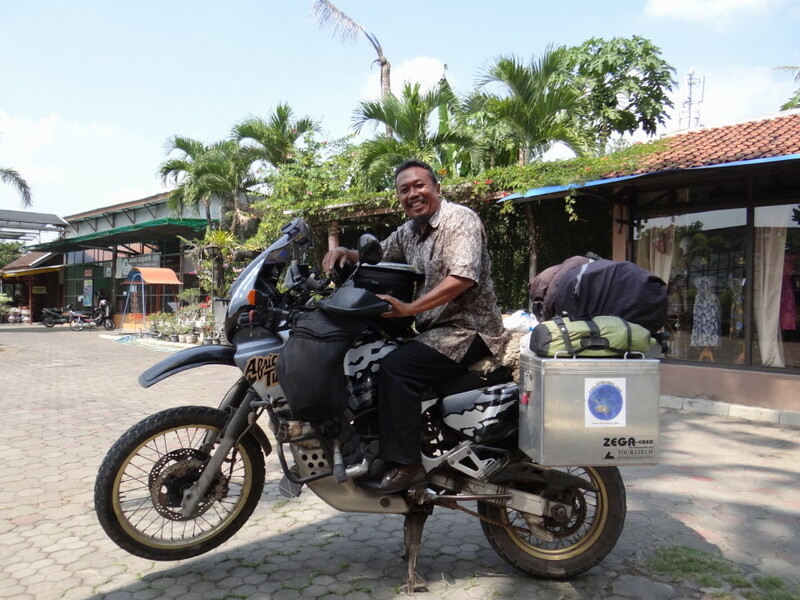 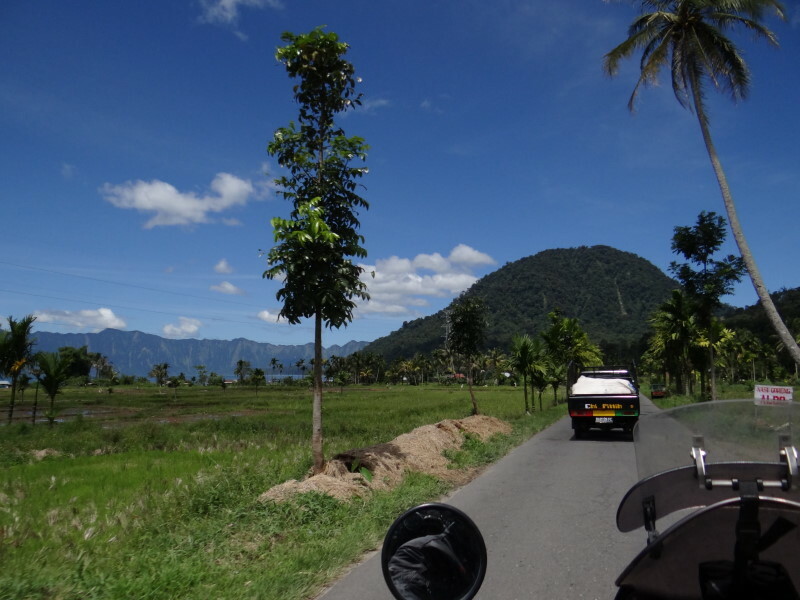 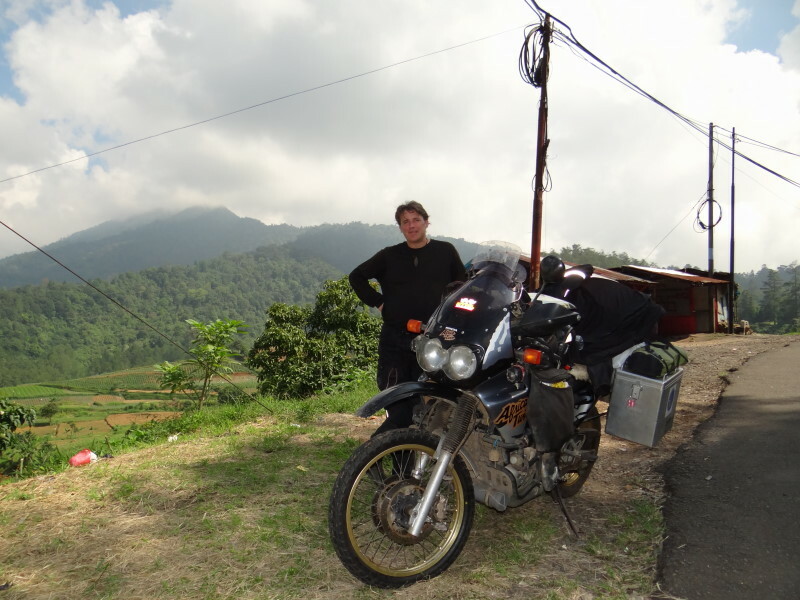 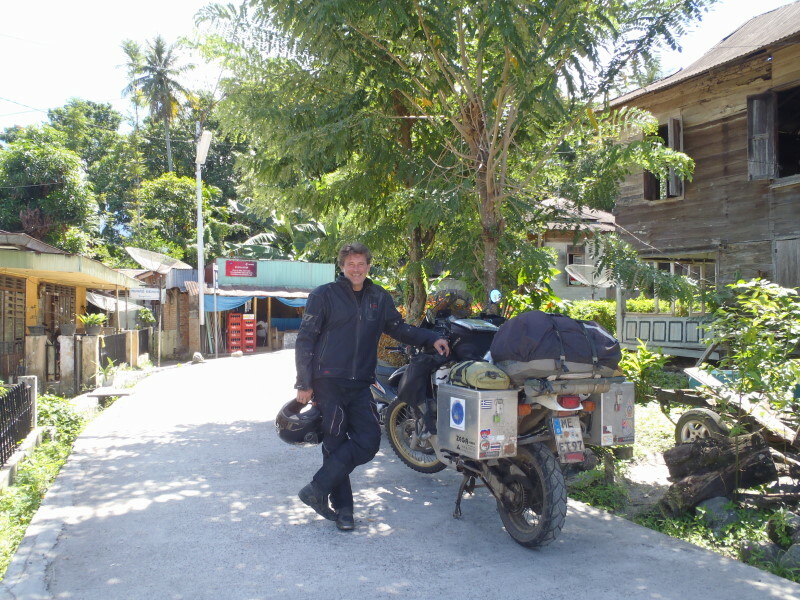 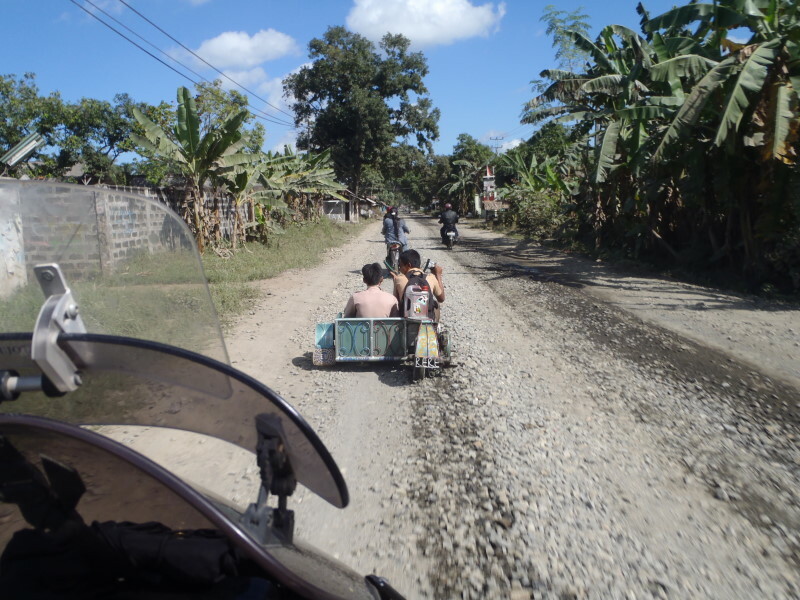 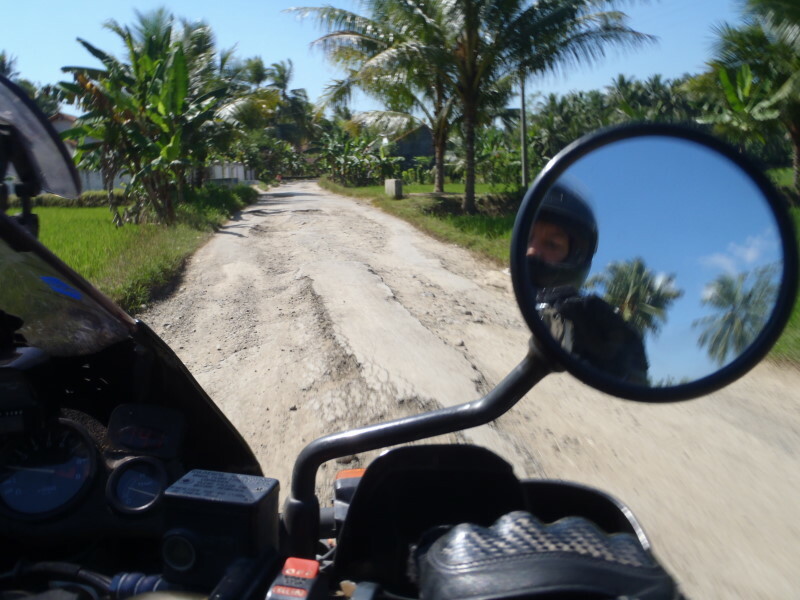 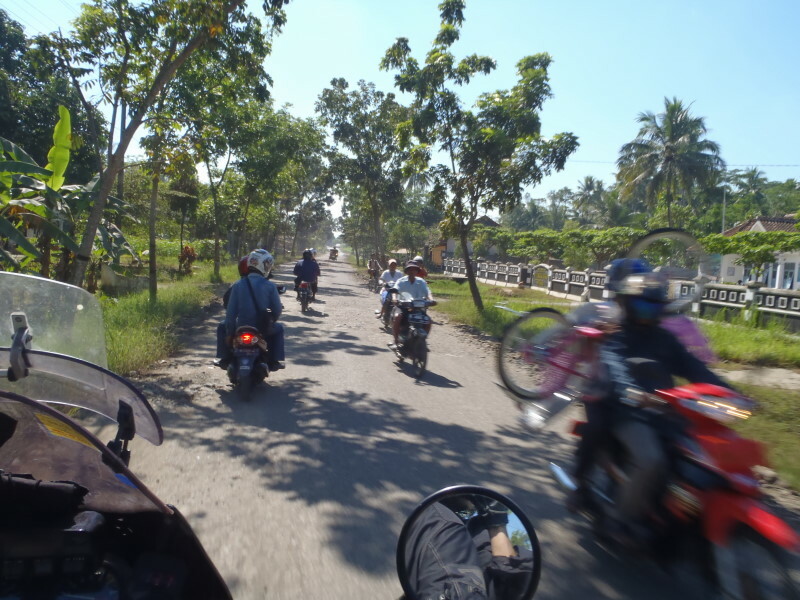 The last 20km before Tangerang were really painful: The traffic turned crazy, the road became more and more narrow and full of pot holes and we were more standing than driving – nearly wide as a car with the panniers on it is impossible to sneak through the cars, trucks and busses. 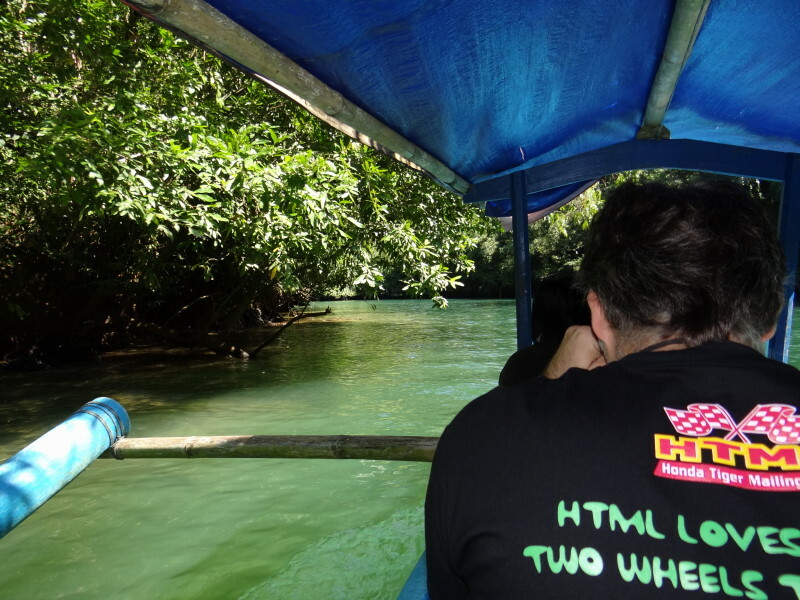 Finally we arrived at the meeting point where other HTML members were already waiting for us. 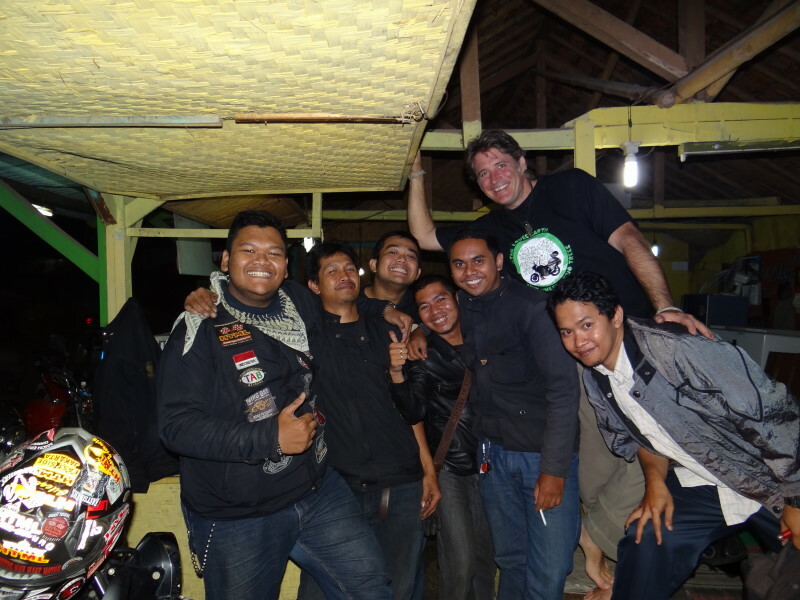 Ivan, the head of the HTML-Club for the Tangerang district invited us to stay in his place where we drove all together. 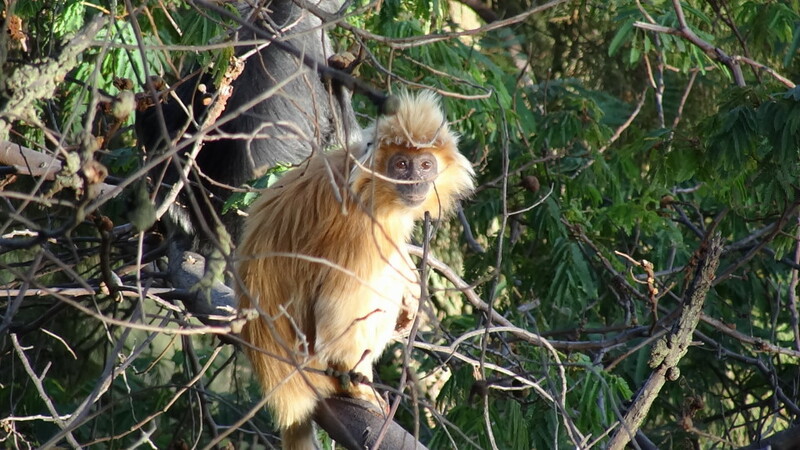 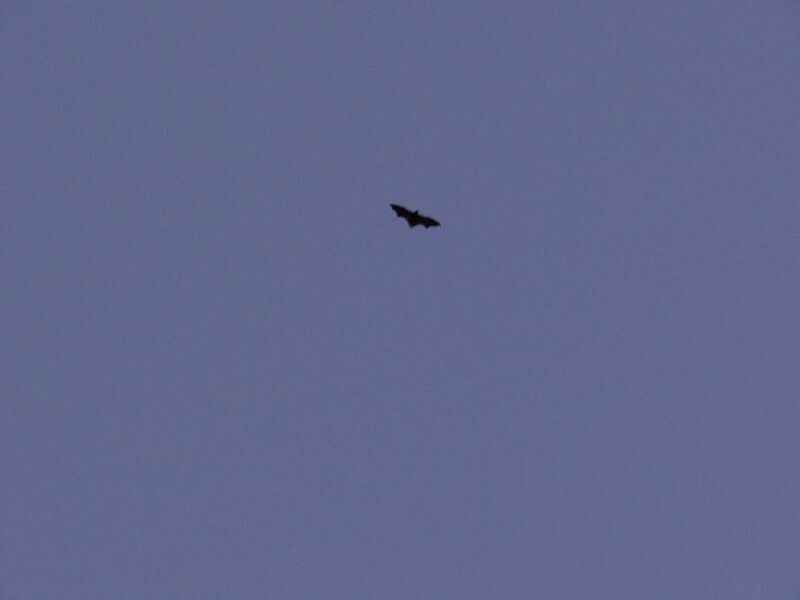 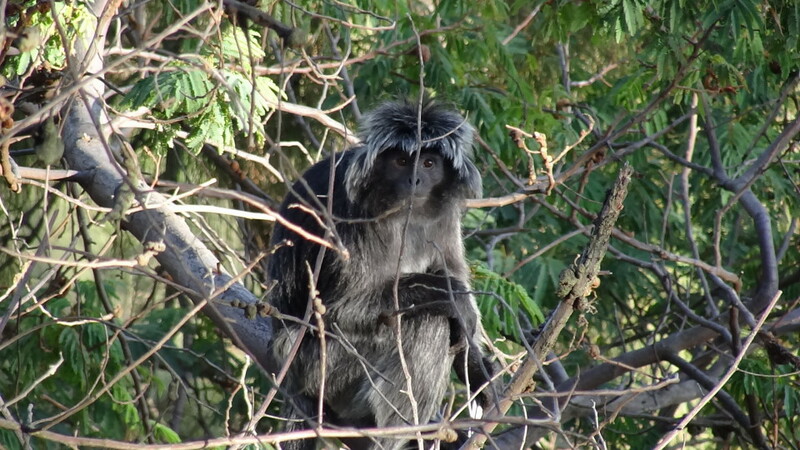 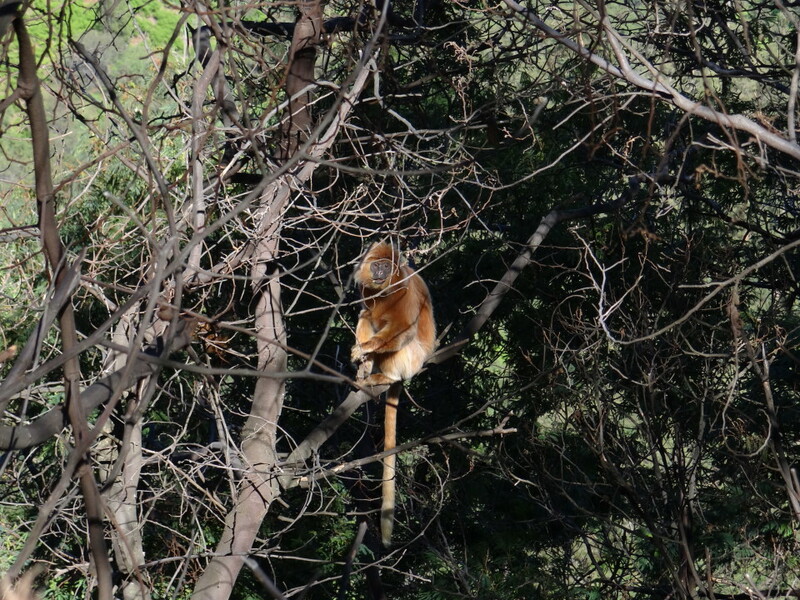 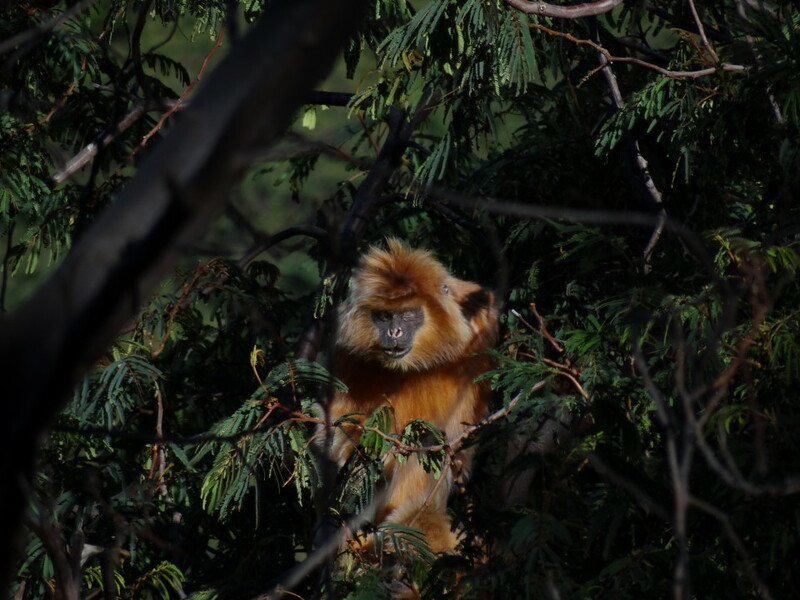 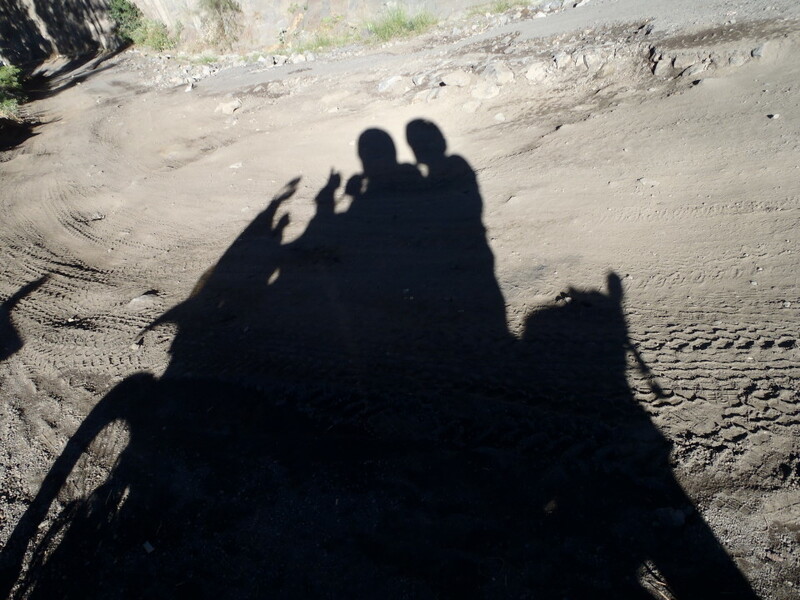 We were really sad after 4 days to leave but we are sure we will see them all again… one day! 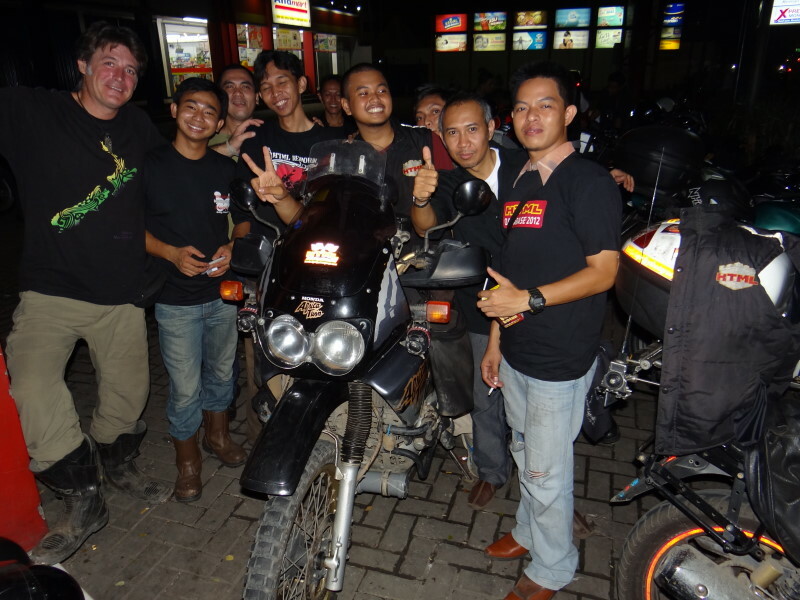 There are no existing words to impress how much we enjoyed meeting YOU ALL! 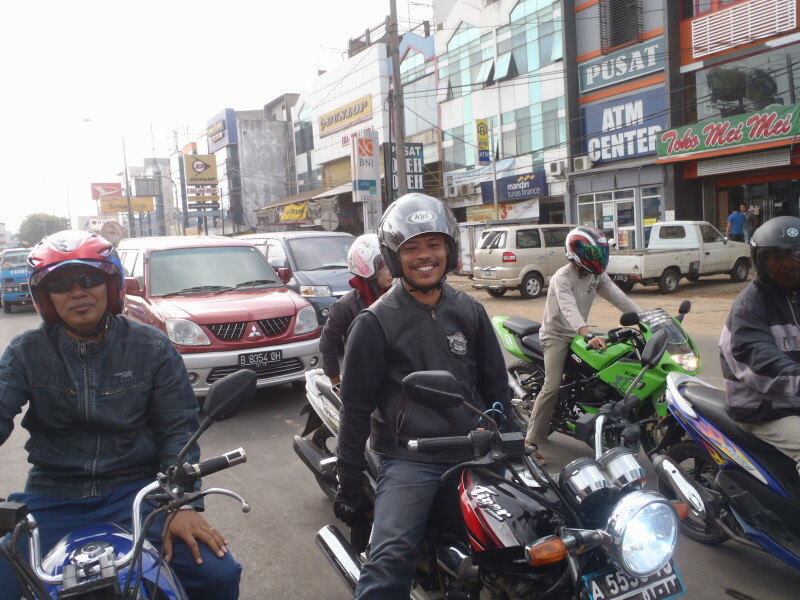 Of course we got escorted out of Tangerang by Lutson and we got the contact of the HTML-Club head of Bandung district, Lutfee, who was welcoming us with his friends before we reached the city. 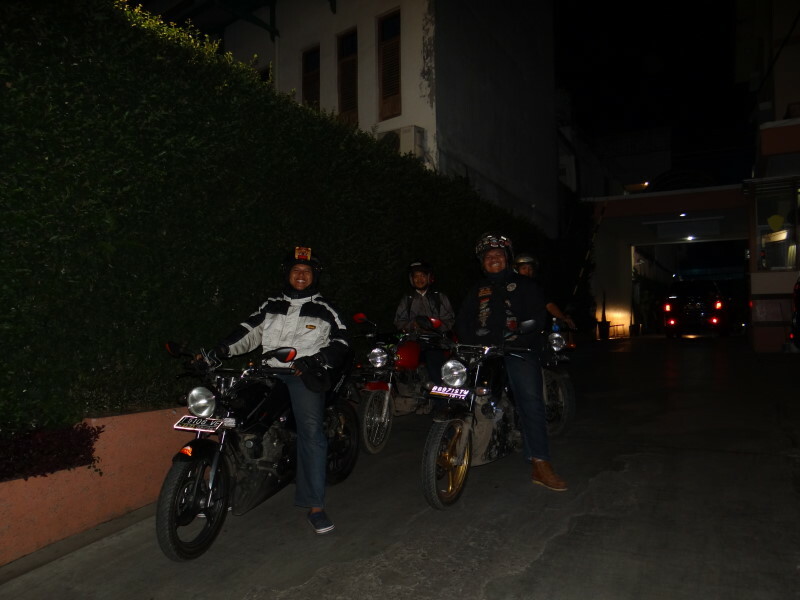 They helped us to find a place for the night and we enjoyed riding at the back of their tigers up the hill to have dinner together with a great view over Bandung at night. 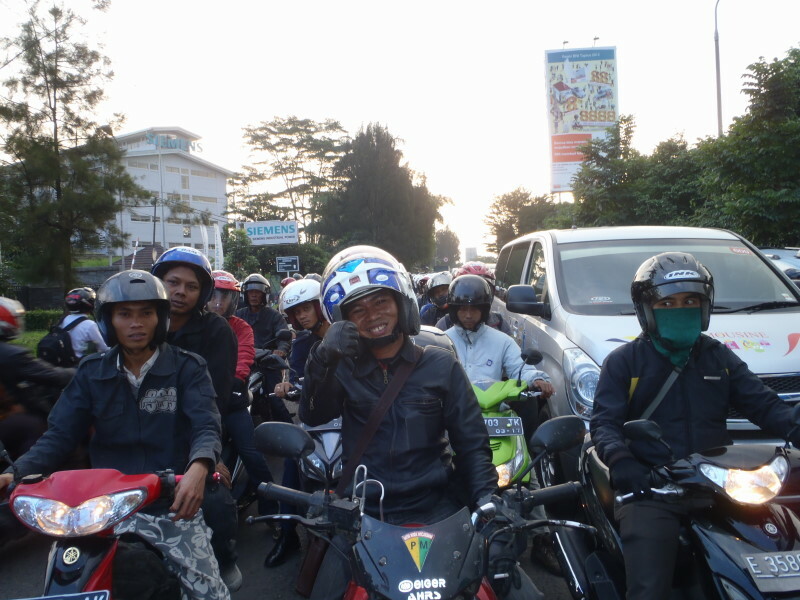 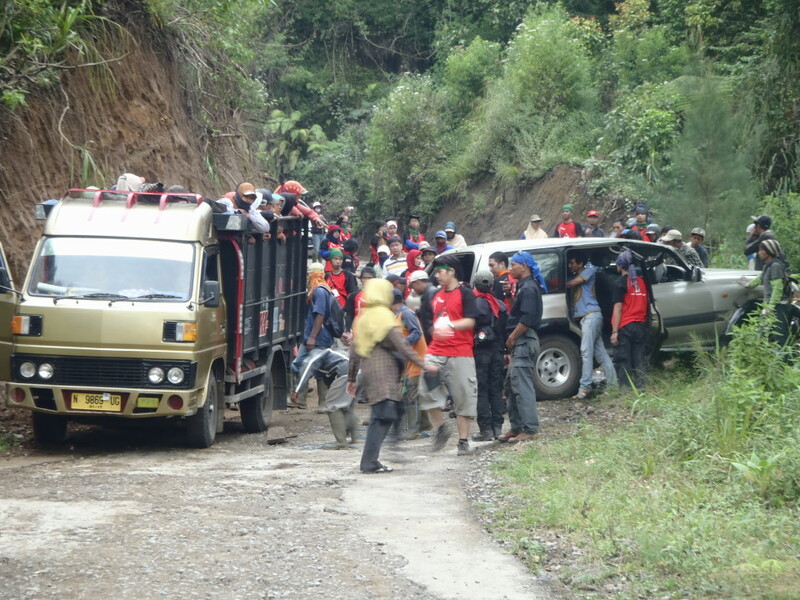 The next day they accompanied us out of Bandung. 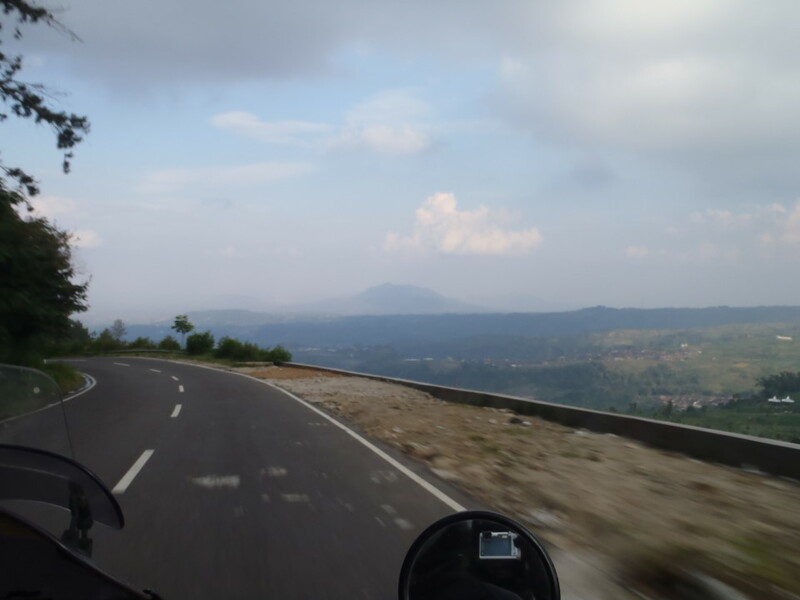 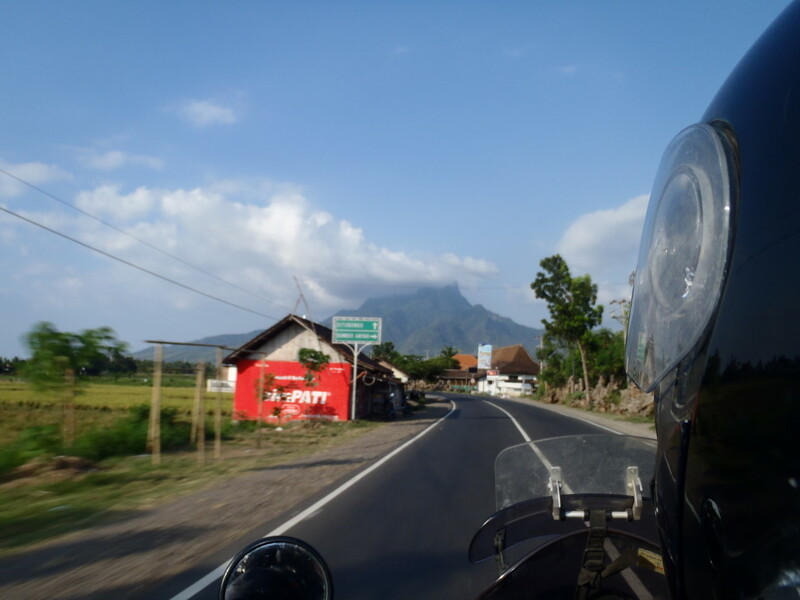 Heading direction Pangandaran we enjoyed the ride over the mountain roads while catching some views to the volcanic scenery. 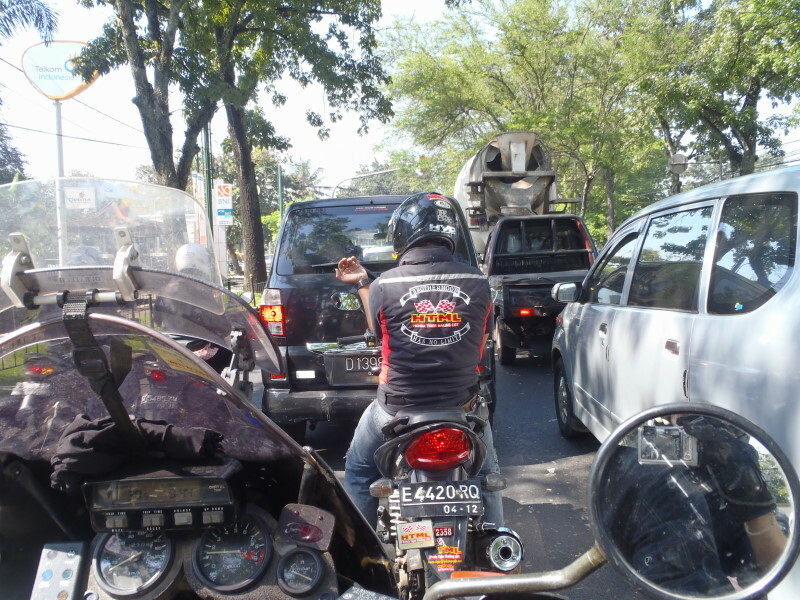 The traffic became less and less and in the middle of the way we got stopped on the road by a group of traveller. 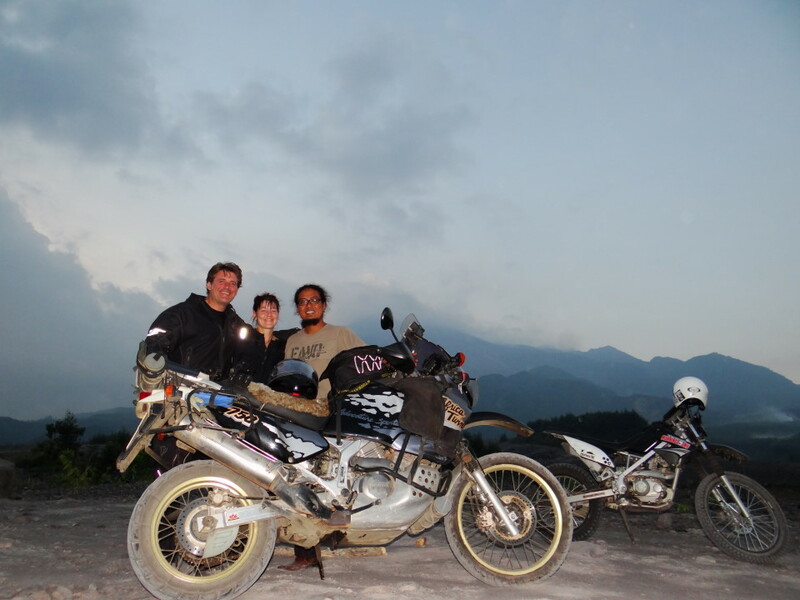 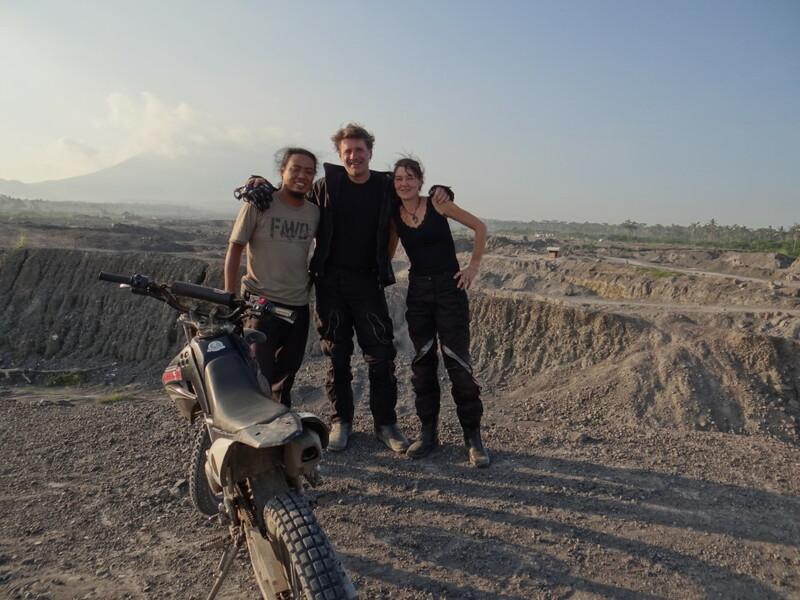 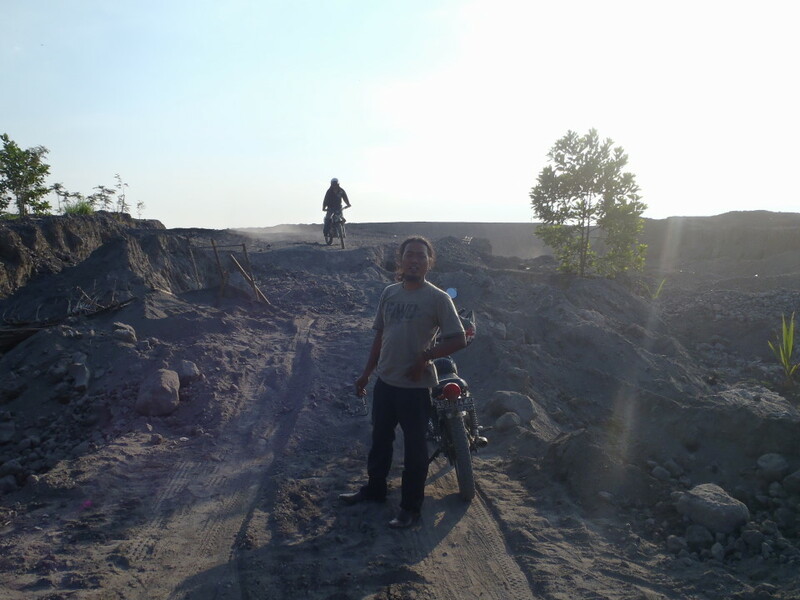 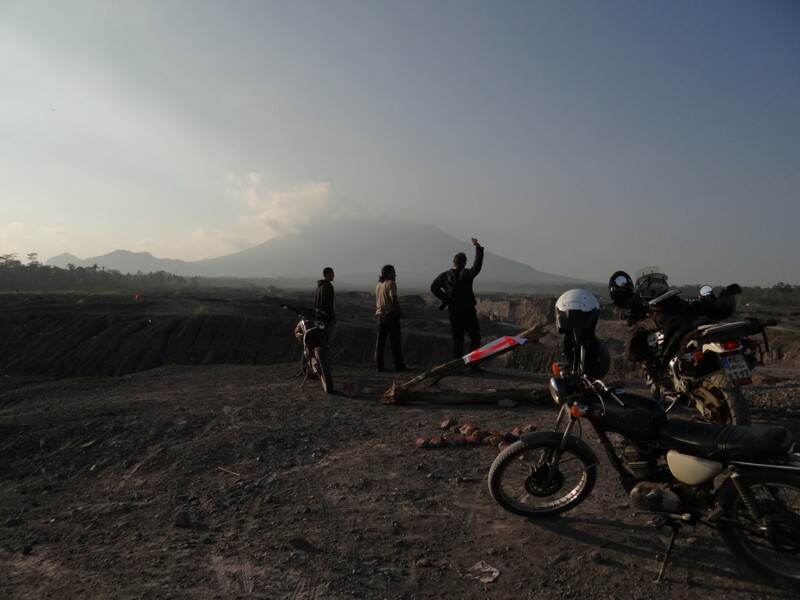 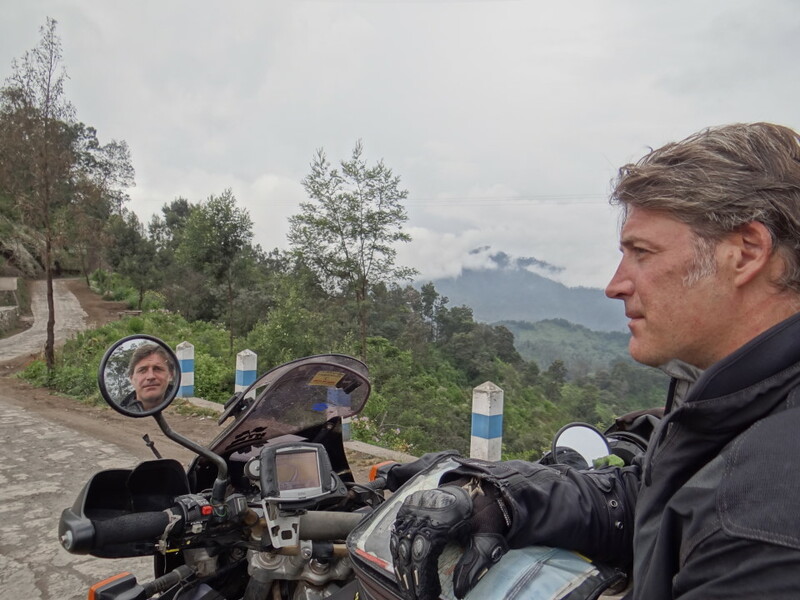 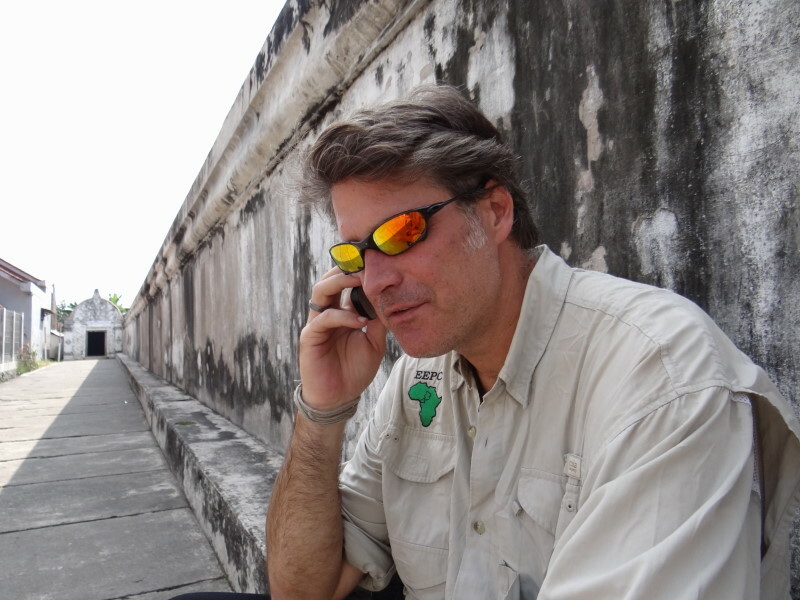 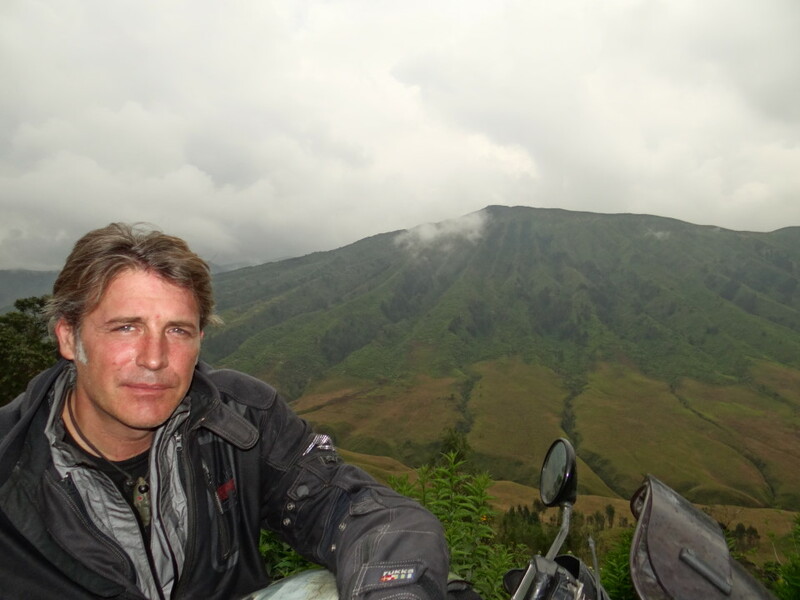 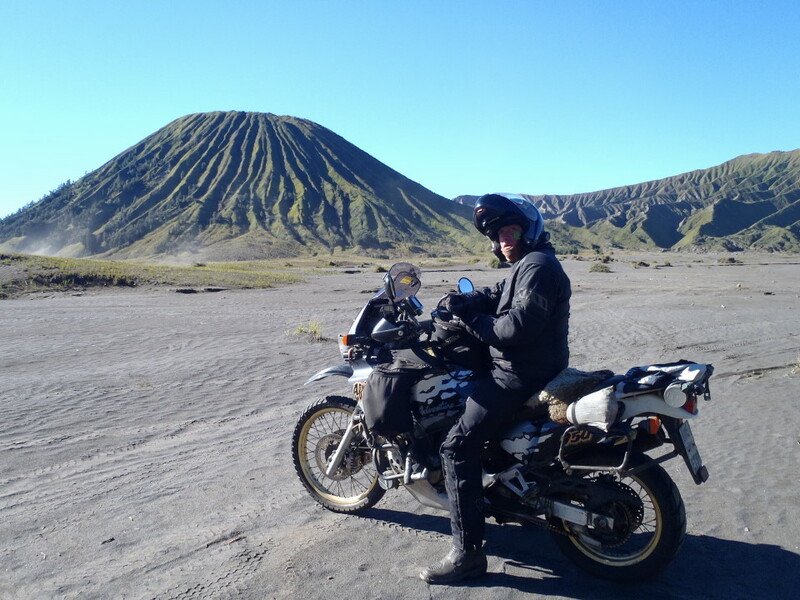 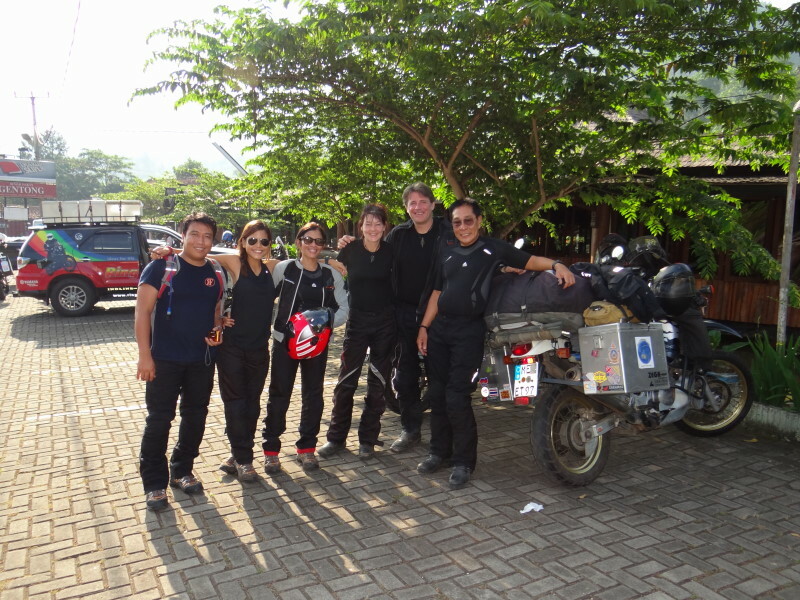 It was the “Ring of Fire” team: A family who is riding on Tenerees around Indonesia and working on a great documentary for the local television and for the Discovery Channel. 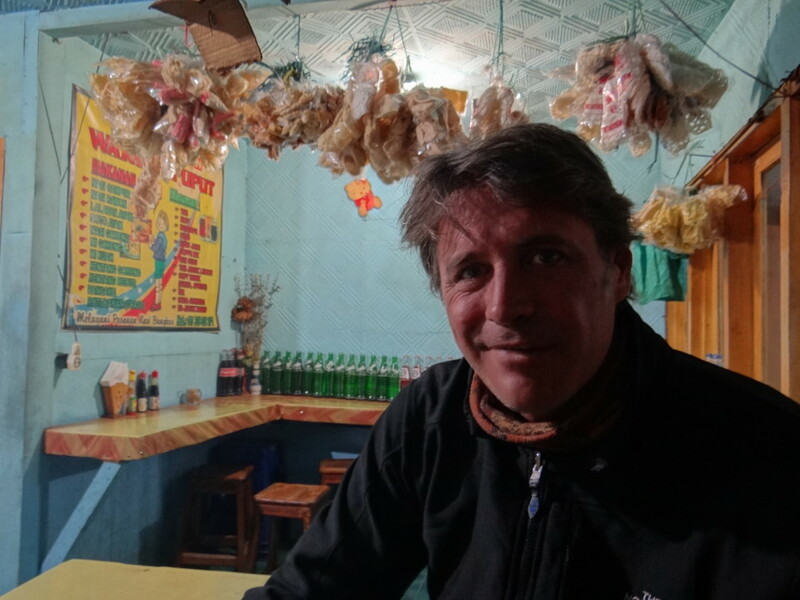 They invited us for lunch and we had the chance to exchange our experiences. 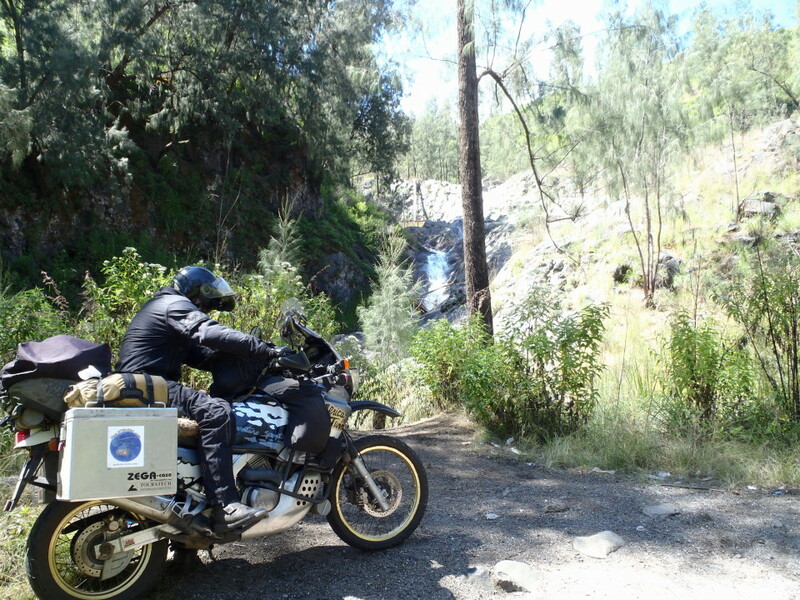 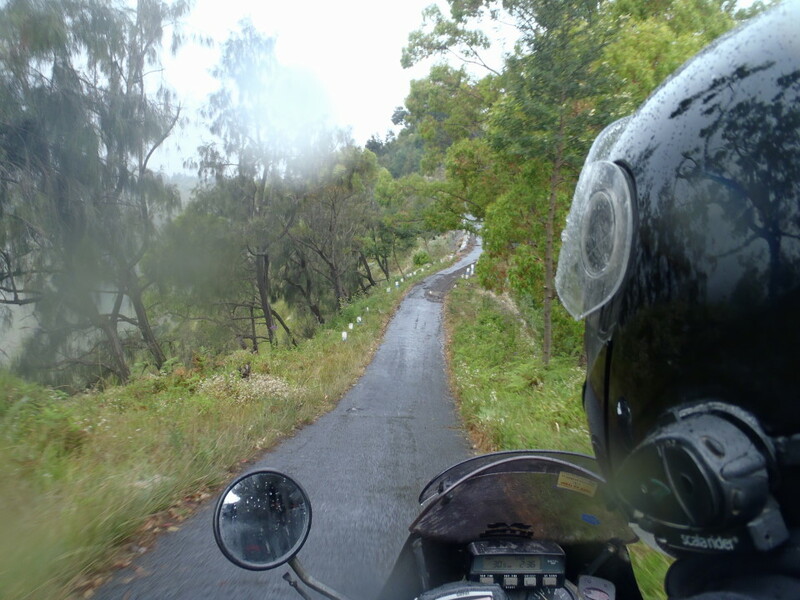 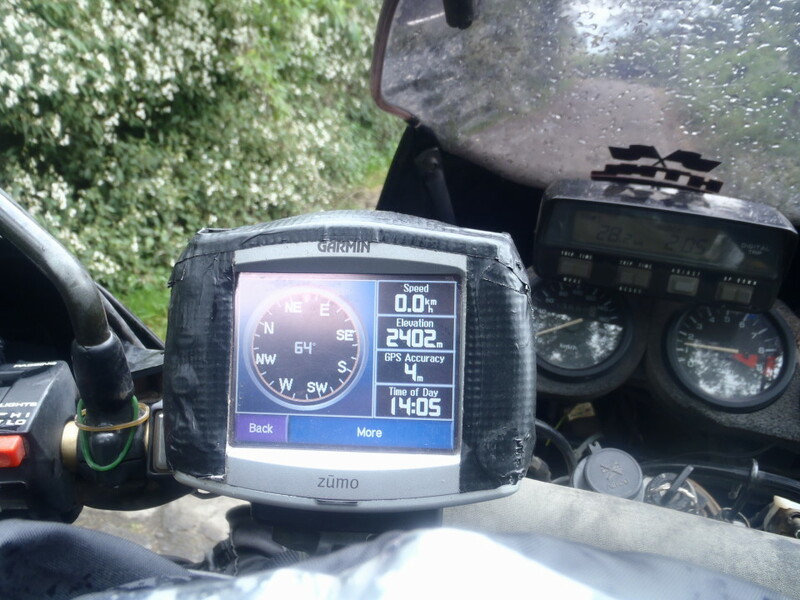 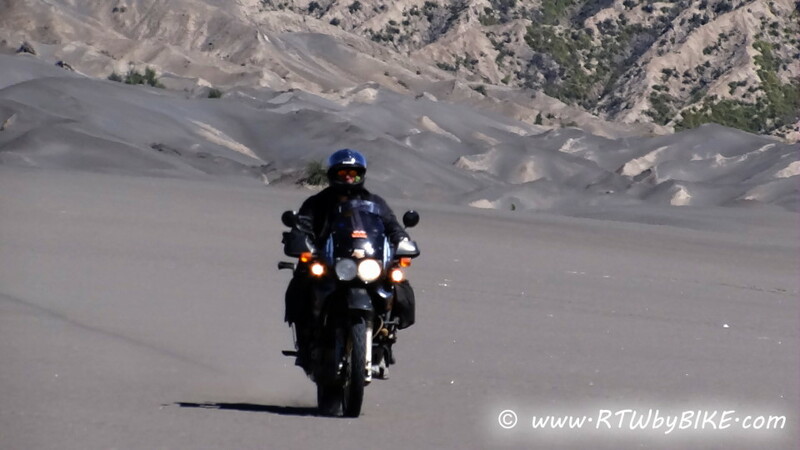 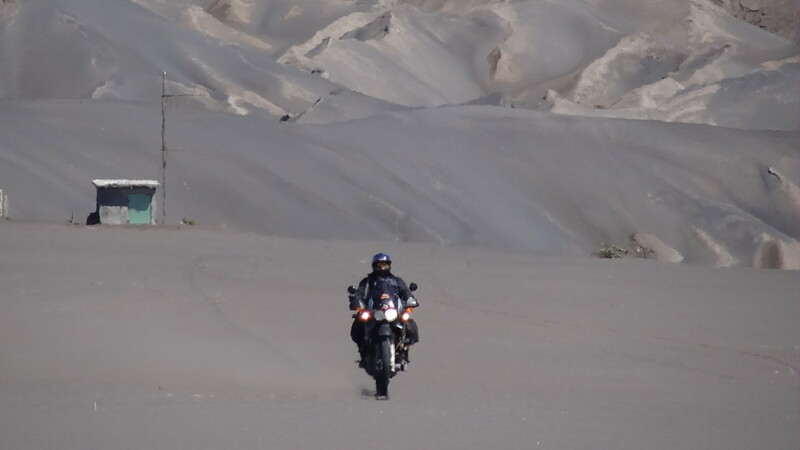 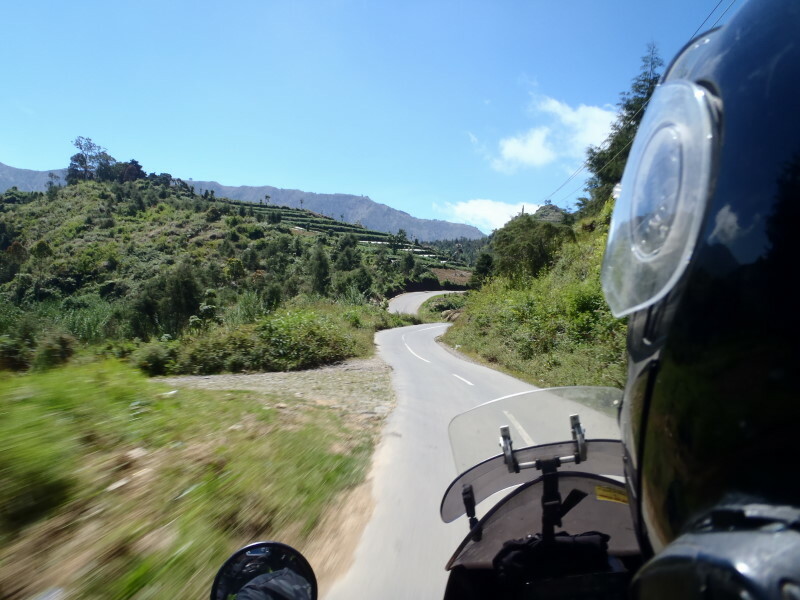 We got great tips for riding from them and we could watch some of their impressive videos. 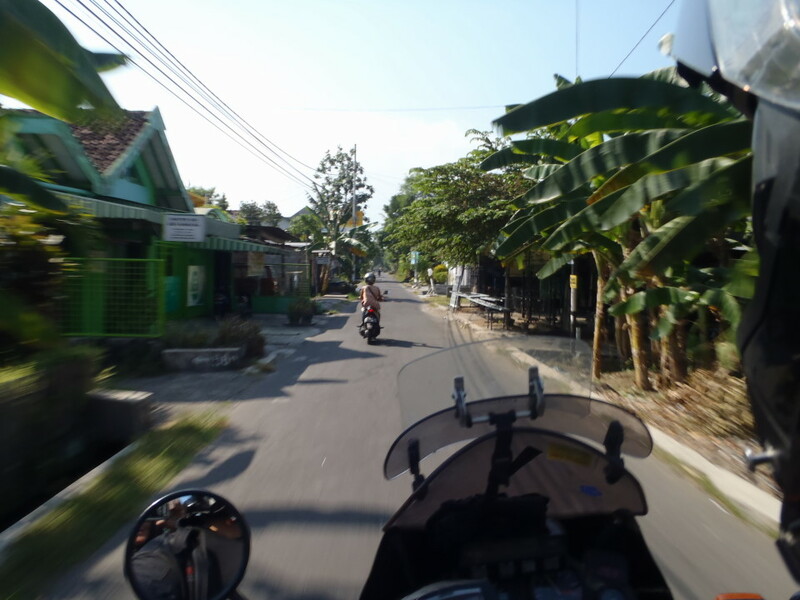 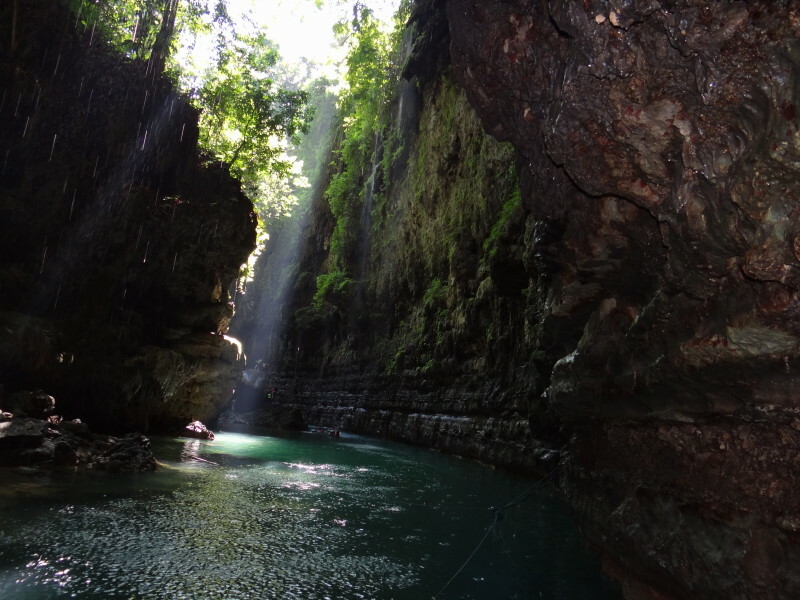 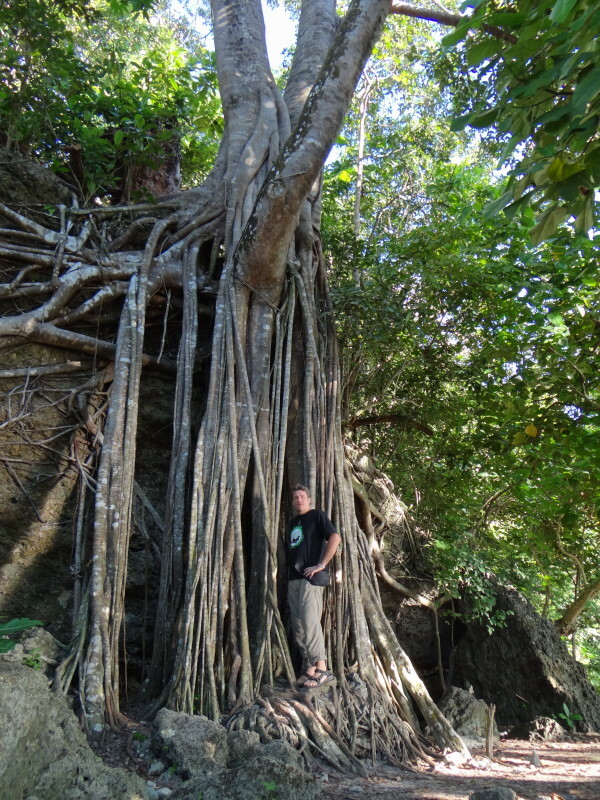 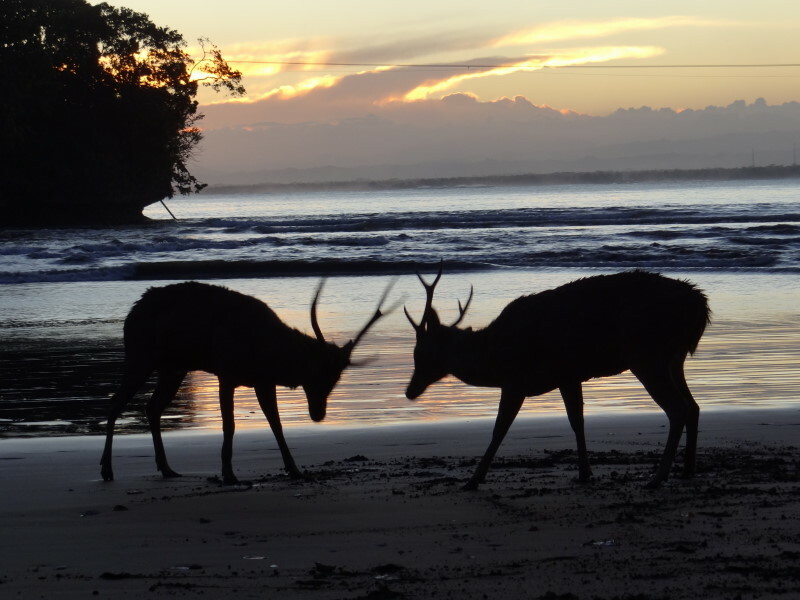 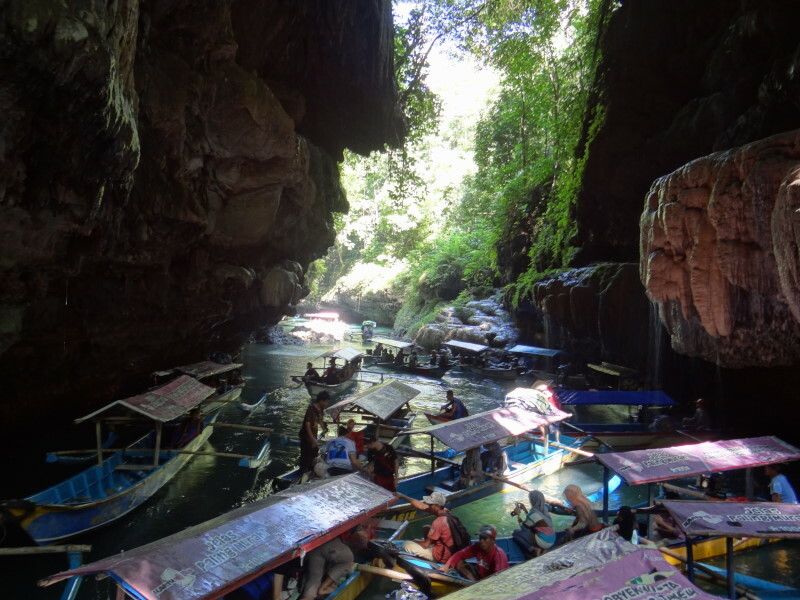 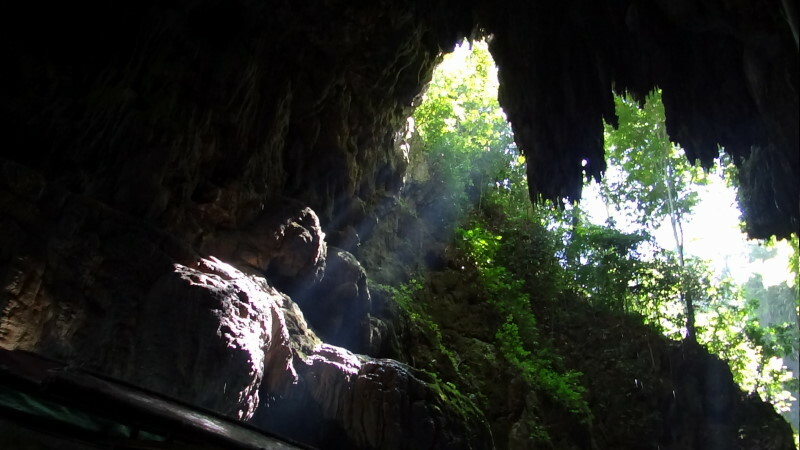 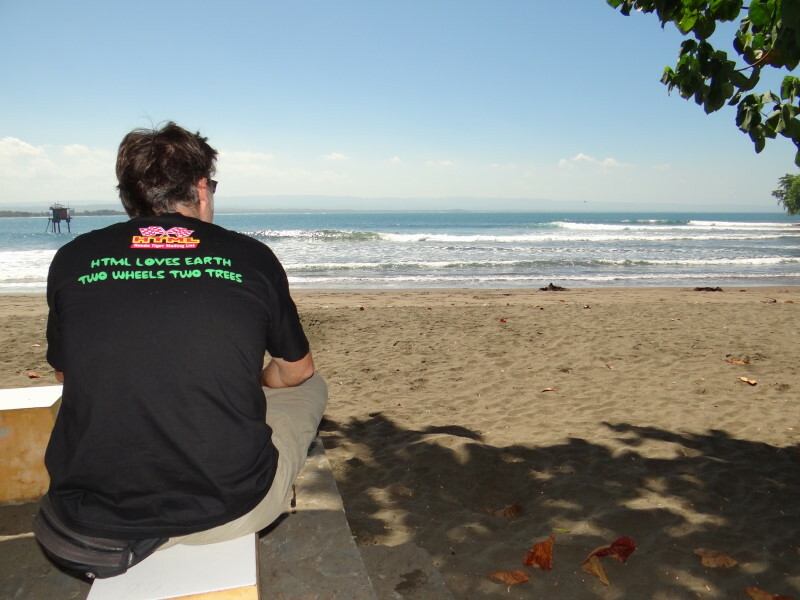 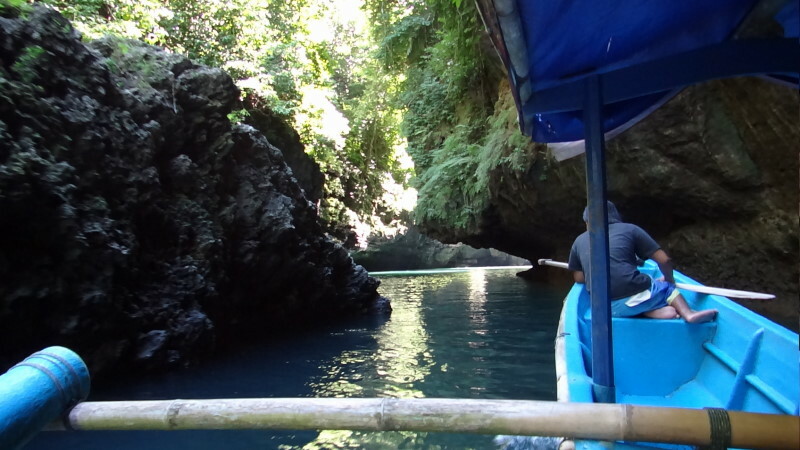 When we reached Pangandaran at the south coast we found an accommodation in a guesthouse of another HTML member ;-) The next day we explored the close by Green Canyon, the coast line around and the nature reserve area. 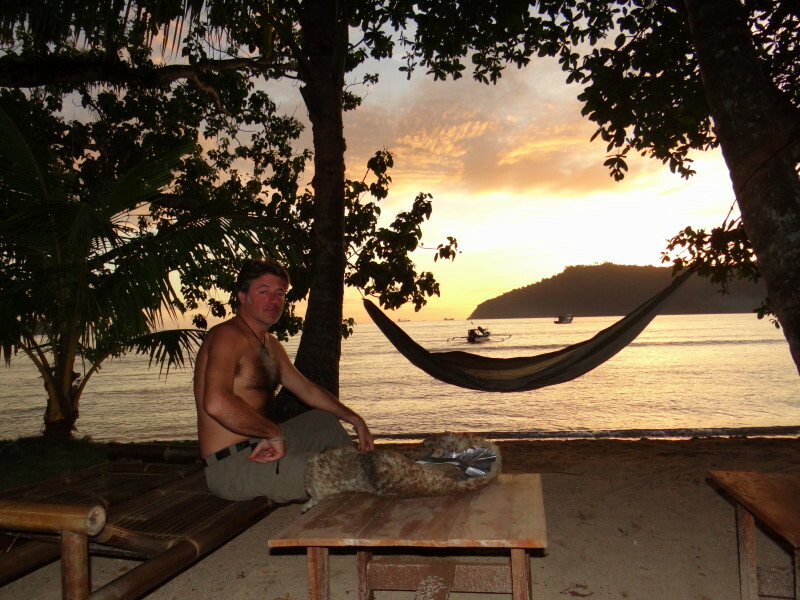 The sunset we spend swimming and sitting and the white beach, watching the monkeys, deer and huge bats. 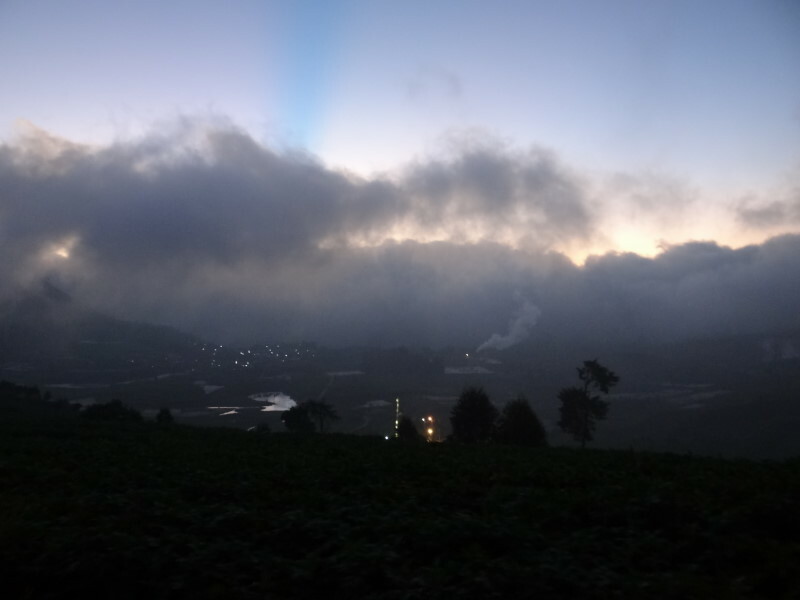 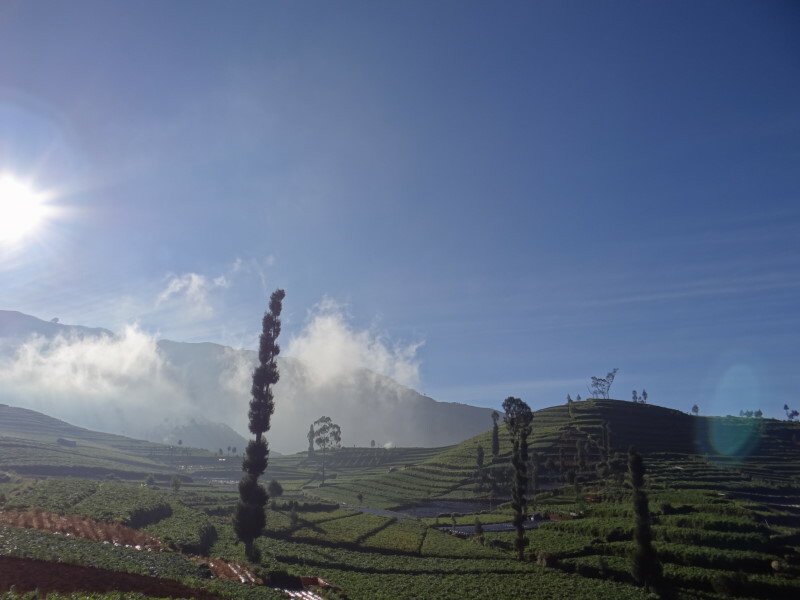 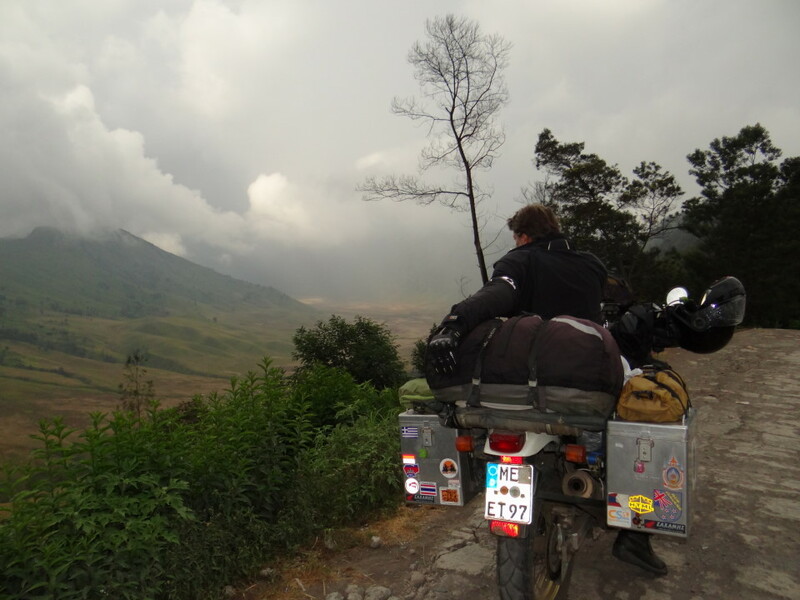 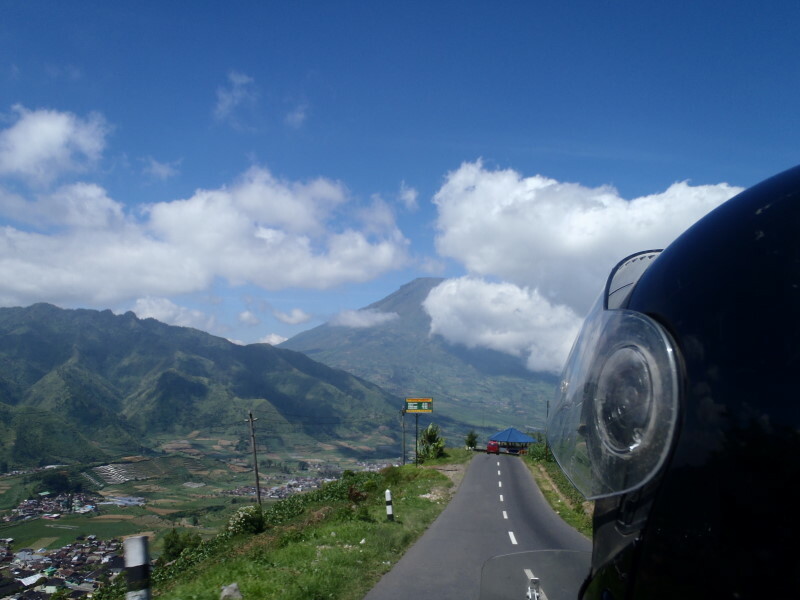 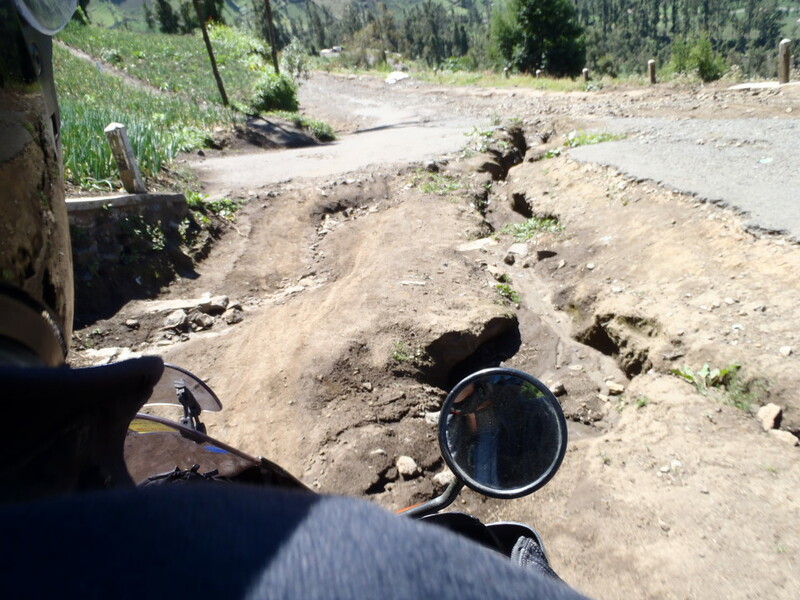 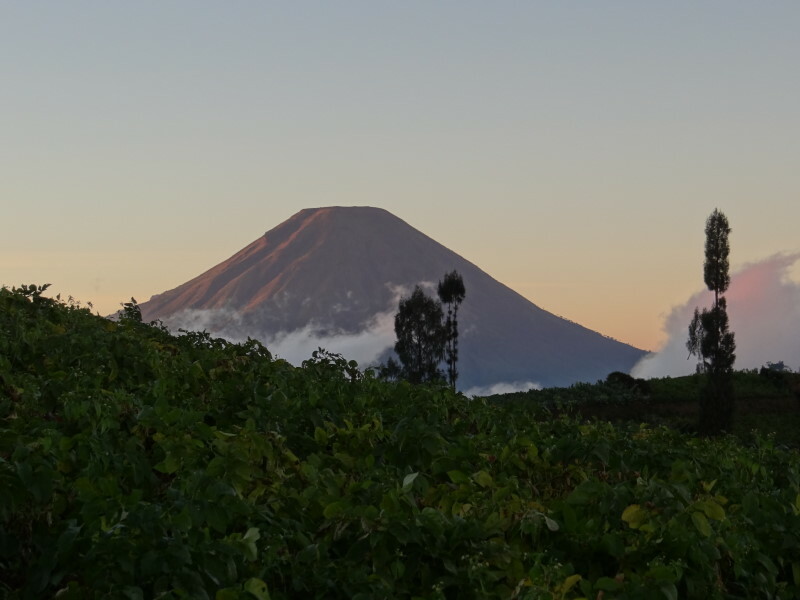 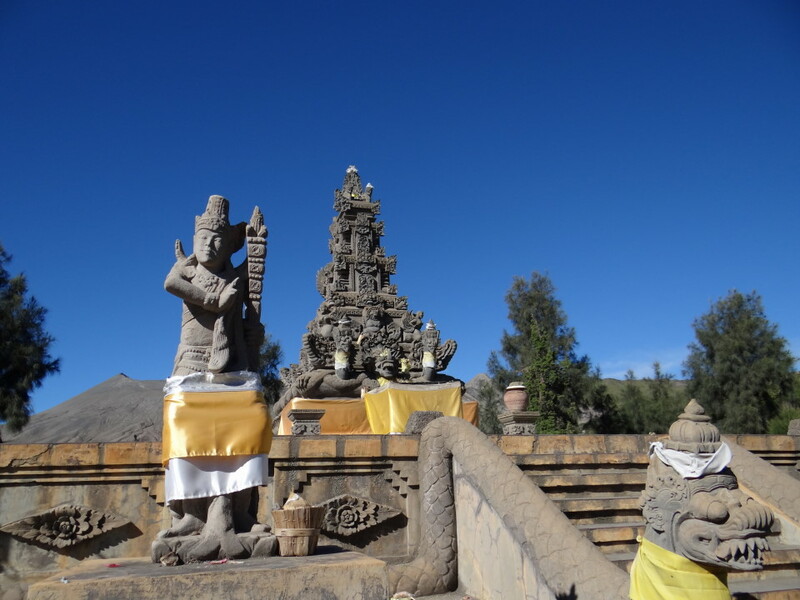 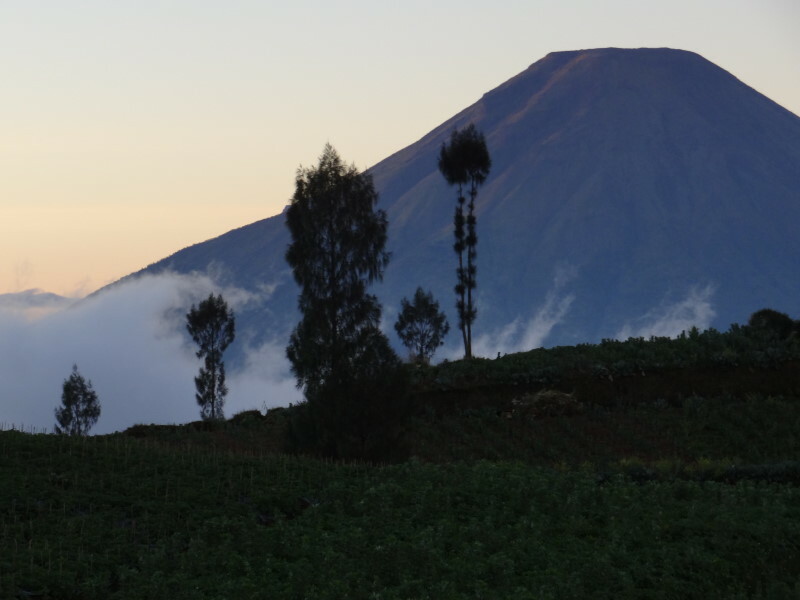 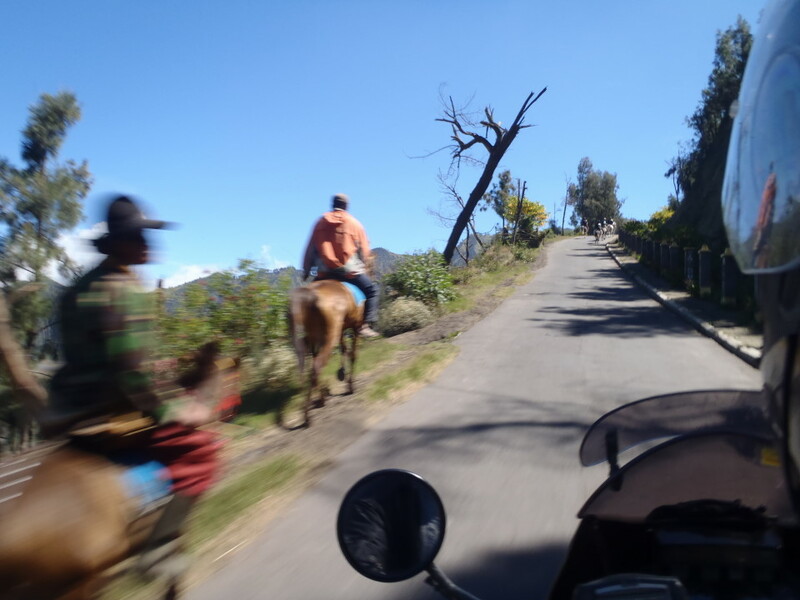 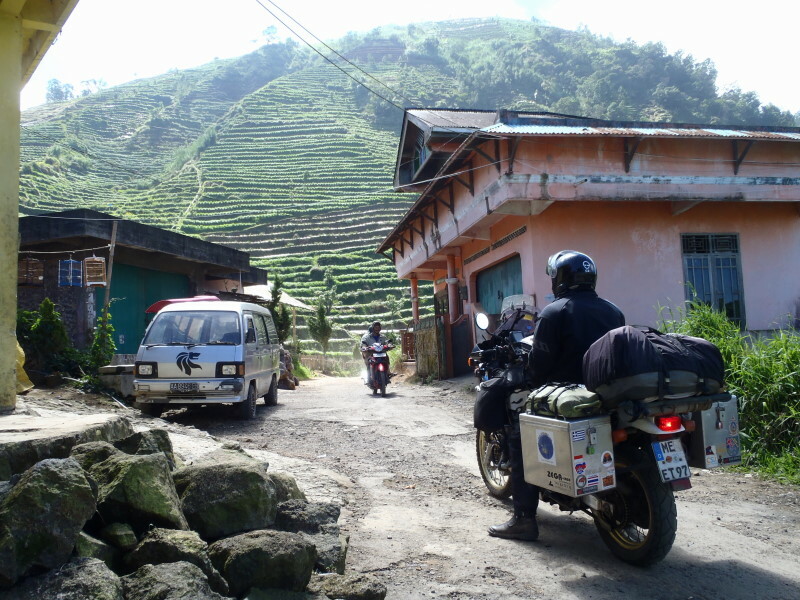 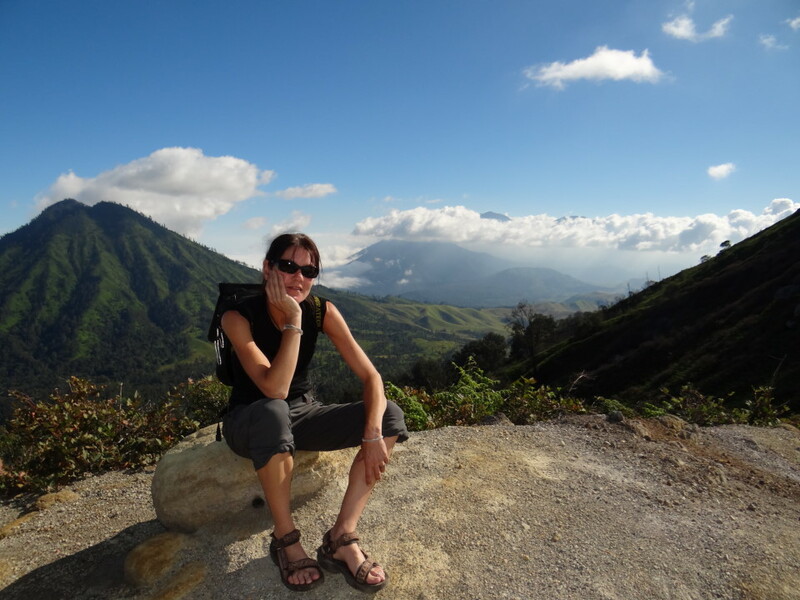 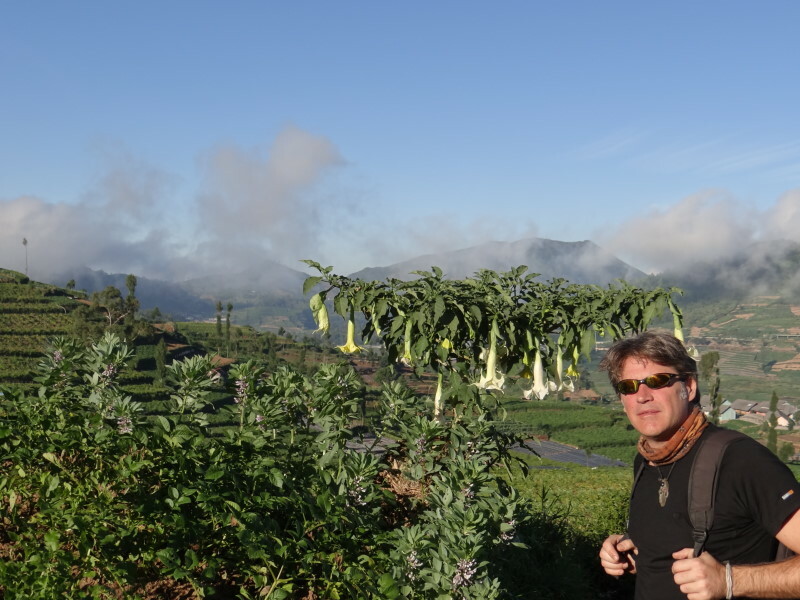 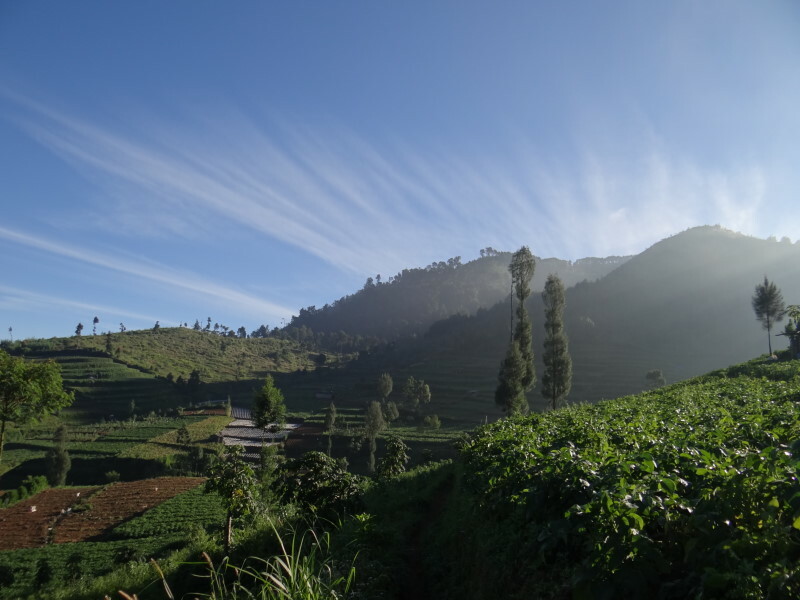 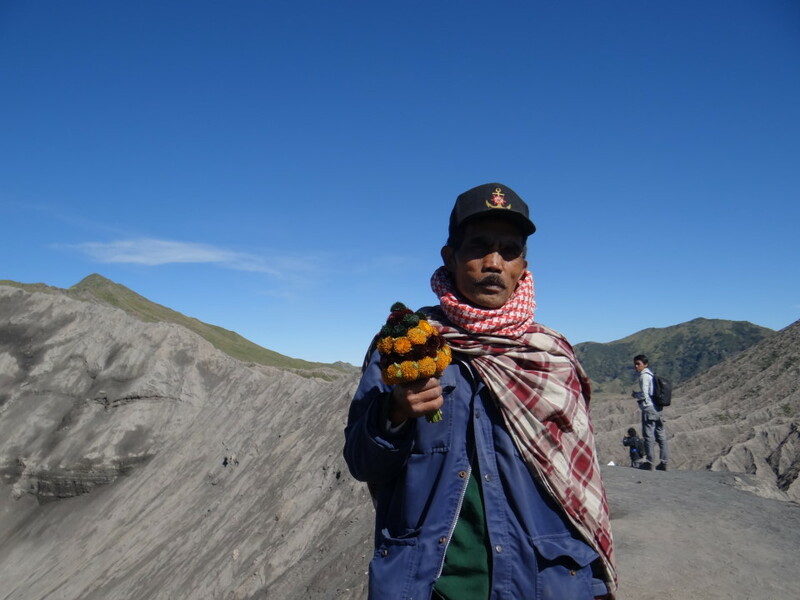 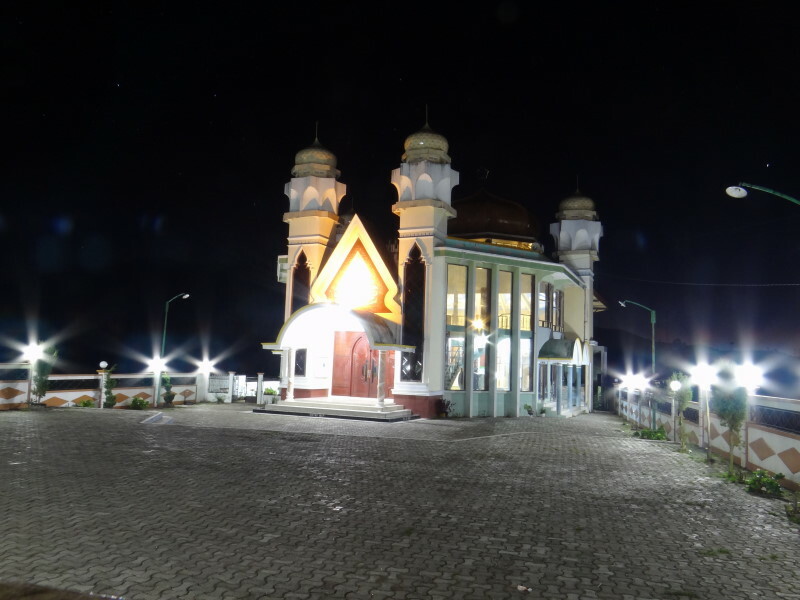 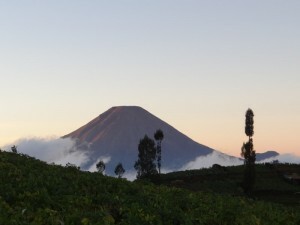 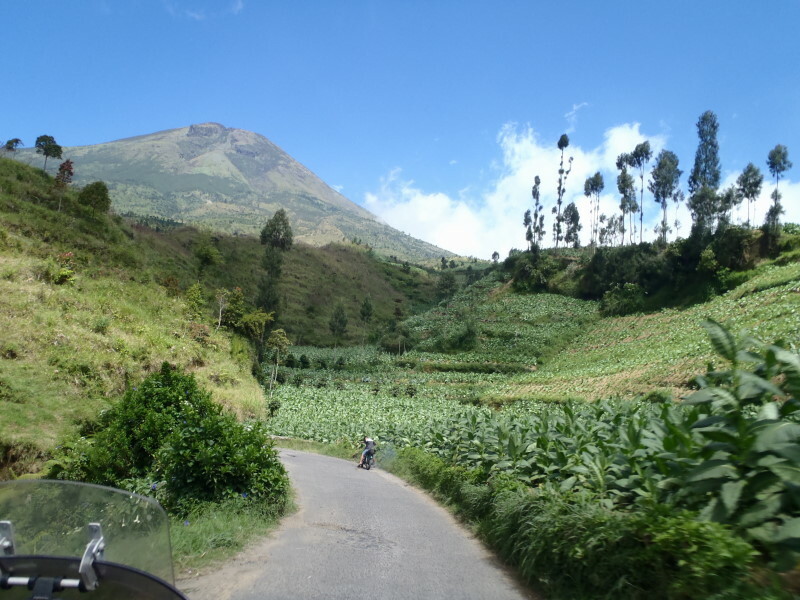 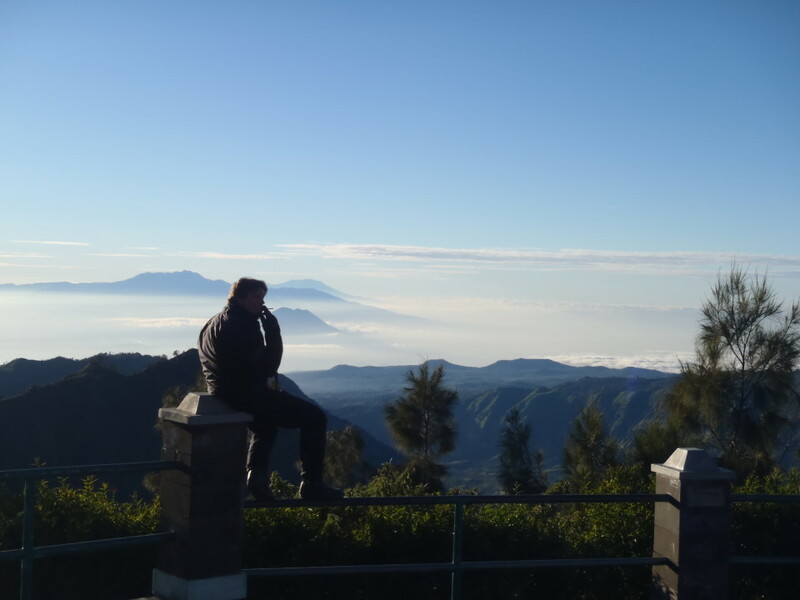 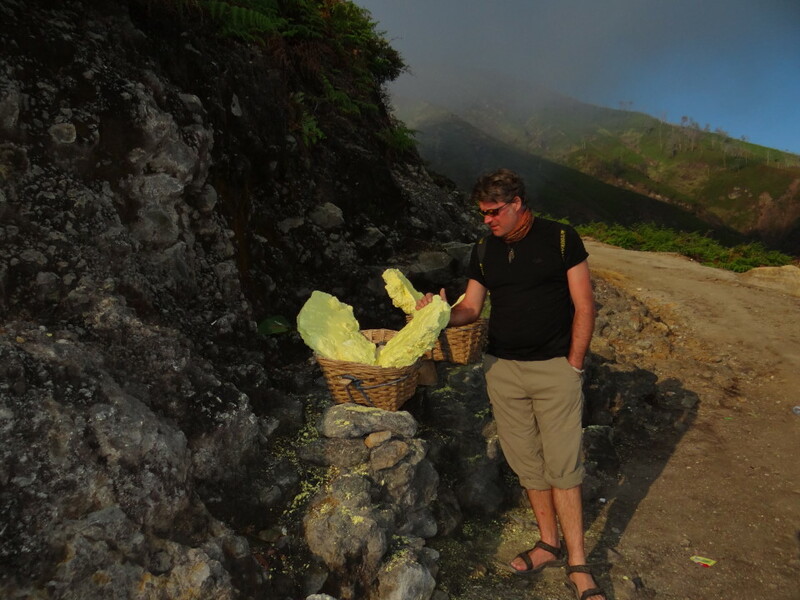 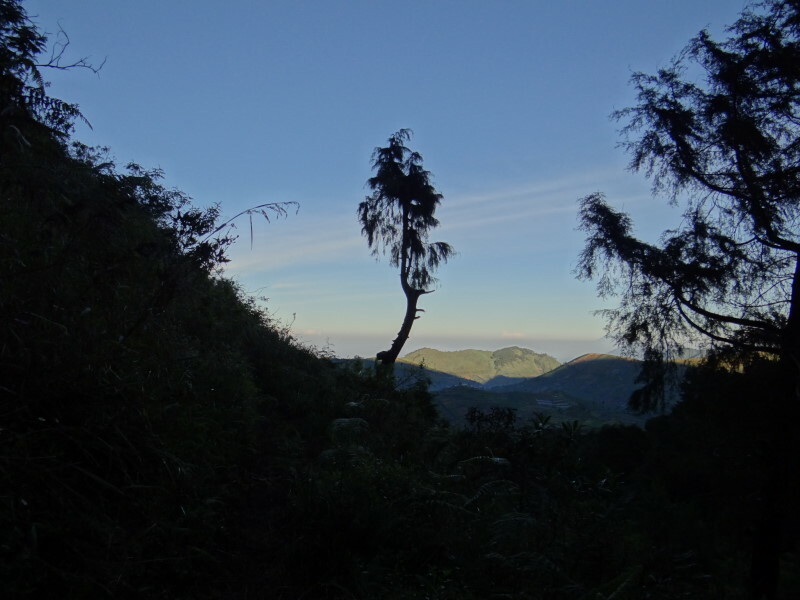 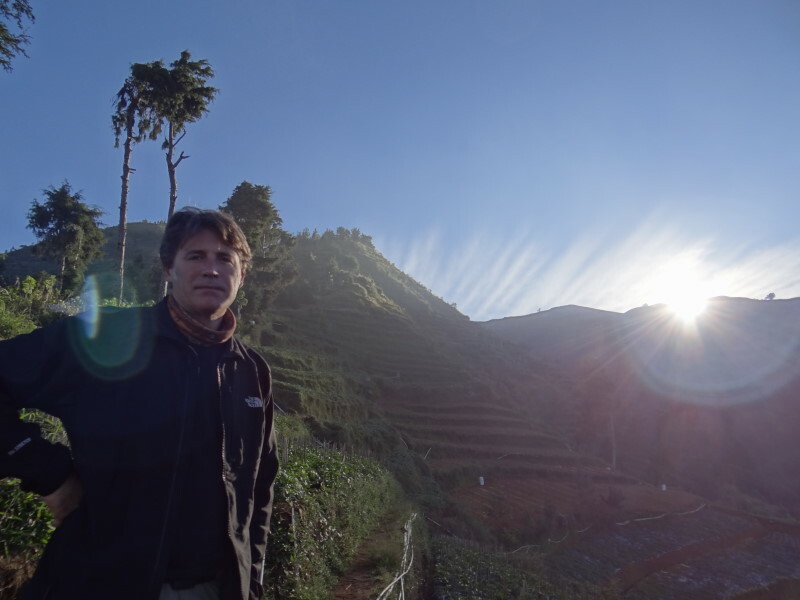 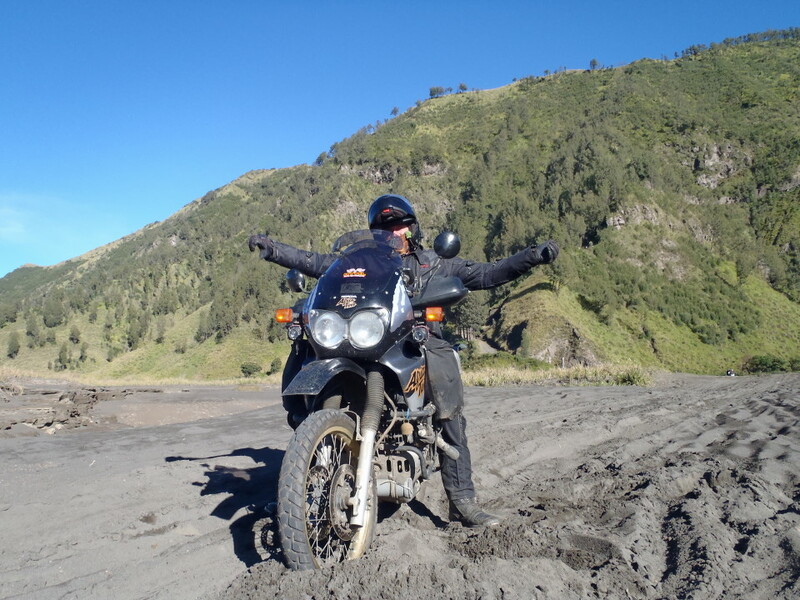 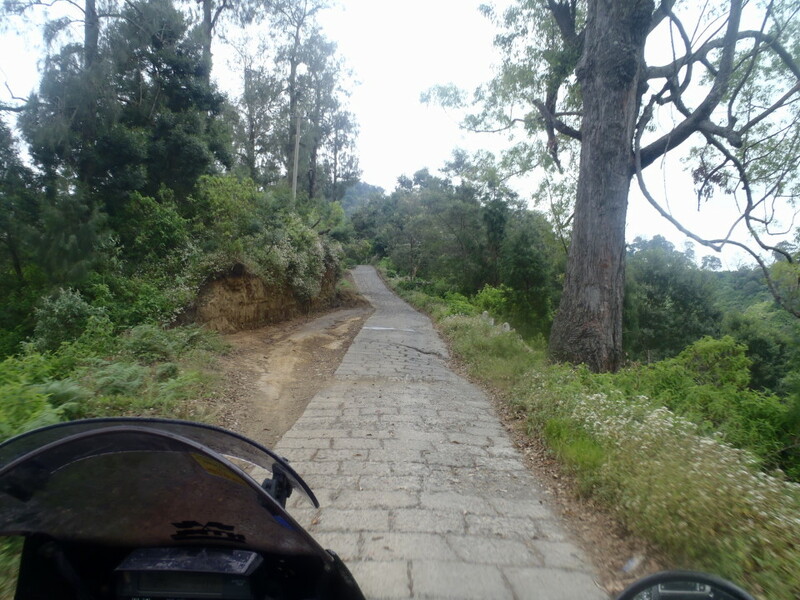 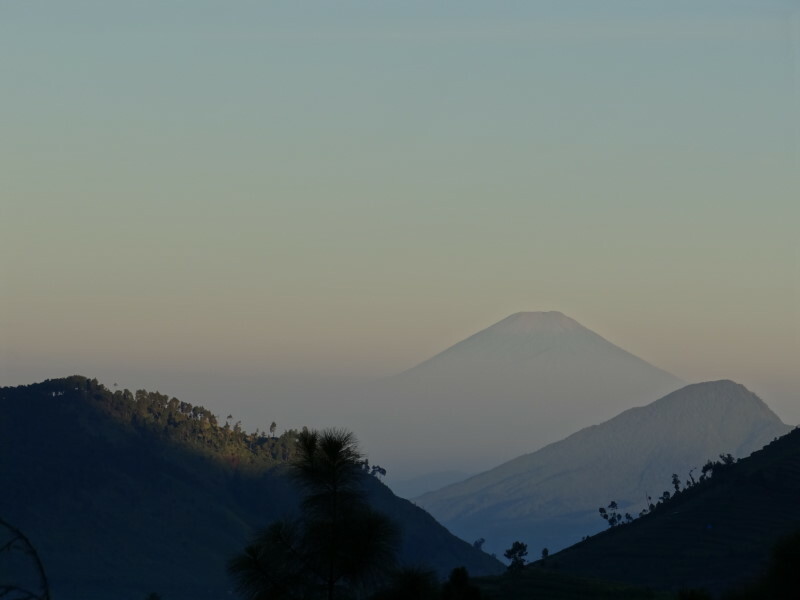 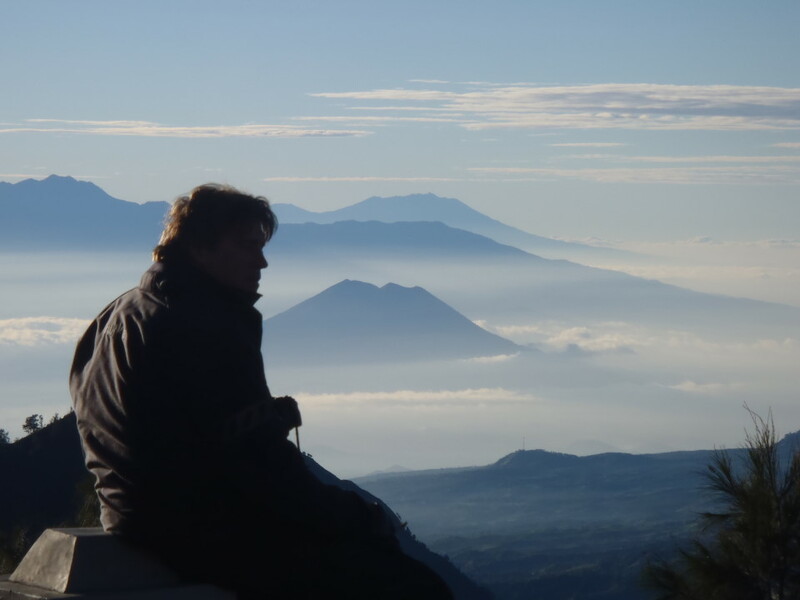 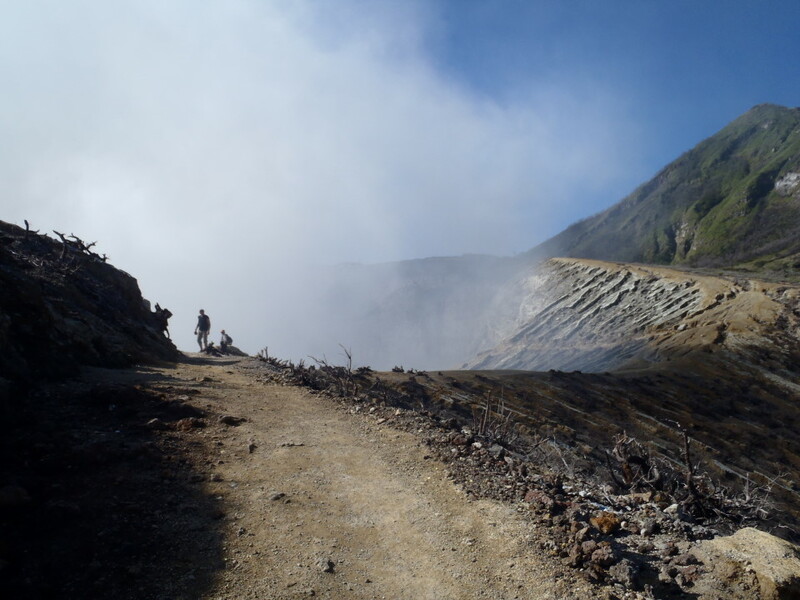 The next destination was the Dieng Plateau, a high plateau surrounded by volcanoes. 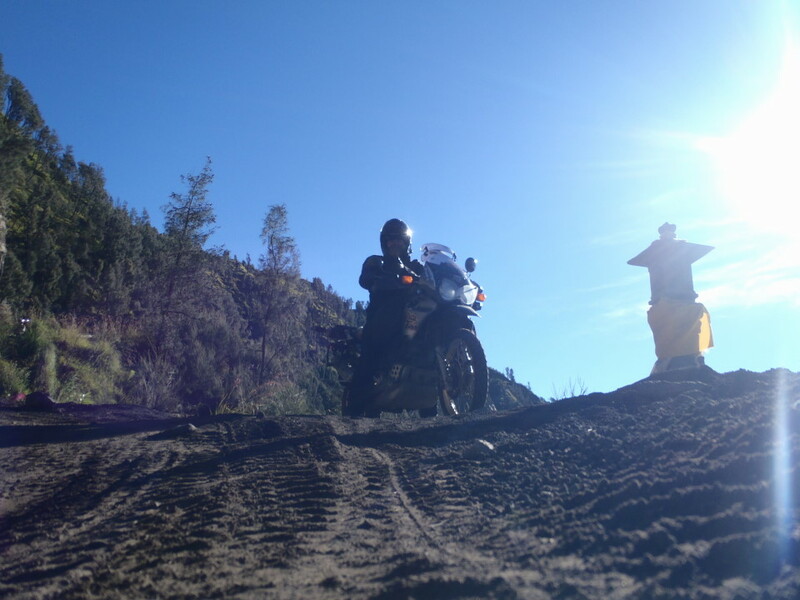 It was a great riding day. 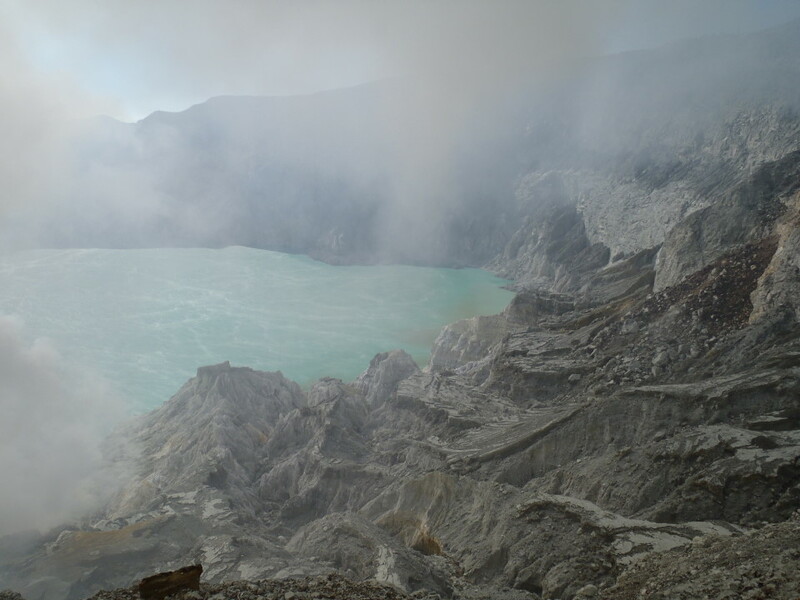 And a lovely scenery when we reached our destination with misty green hills and swirling clouds within the volcanic landscape. 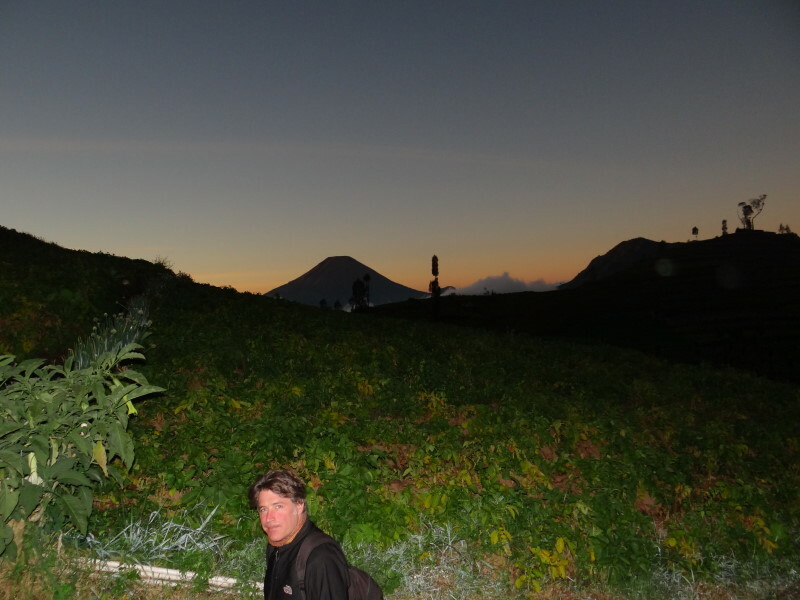 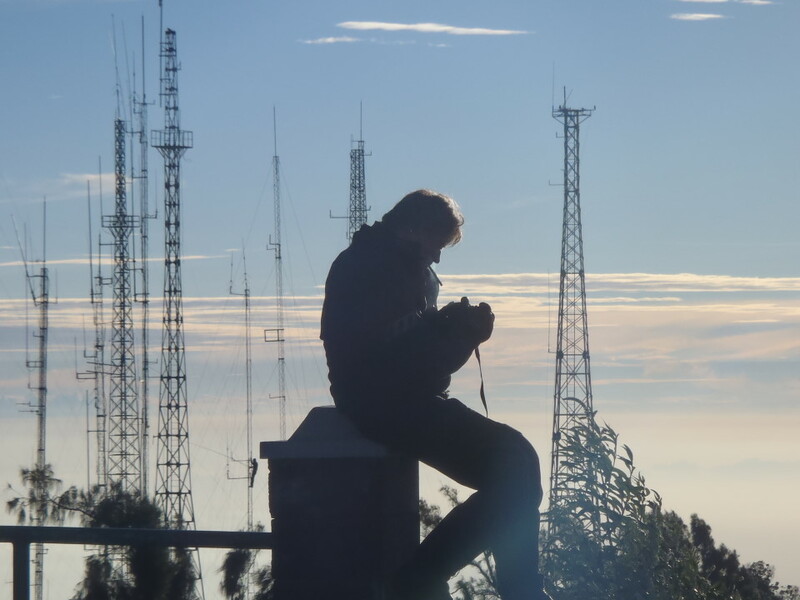 We had a look around in the dawn until it turned dark and the next morning we started at 5AM to hike up to the view point. 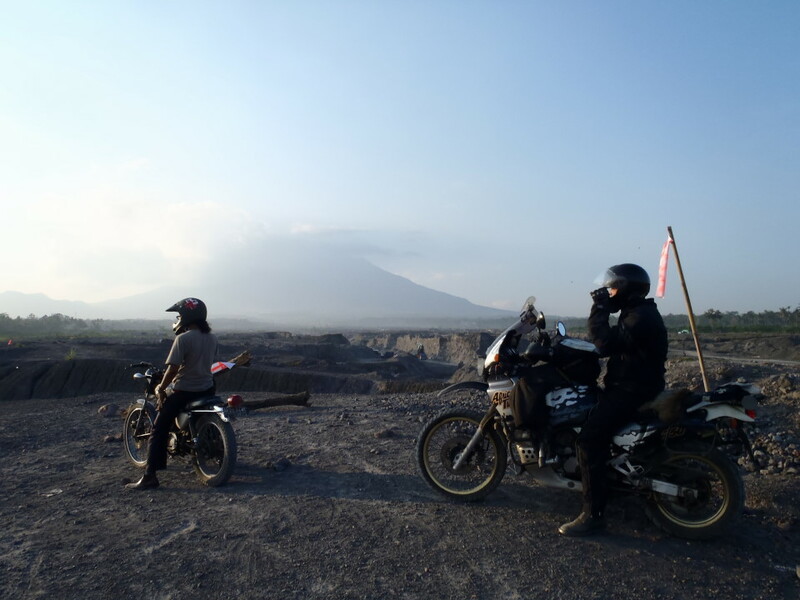 Later on after breakfast we were riding around the plateau area up to the mountain villages and the volcano lakes finally heading direction Yogyakarta. 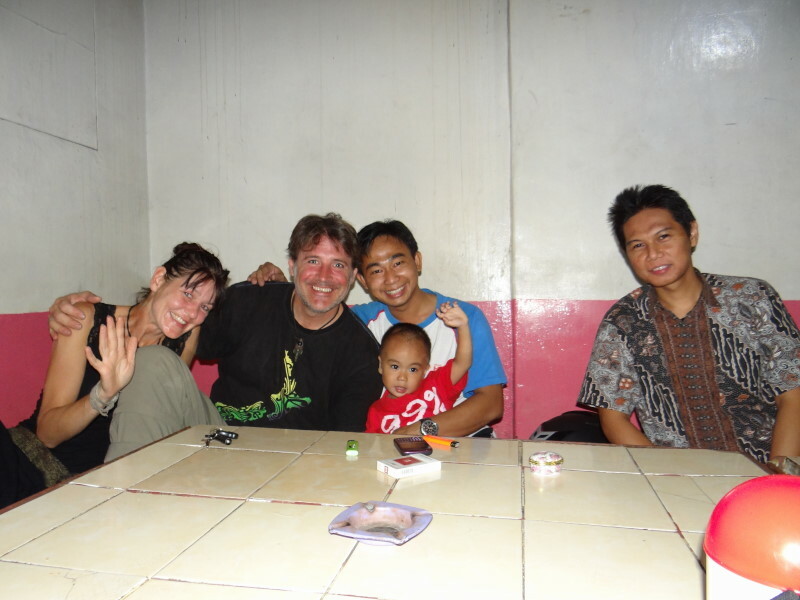 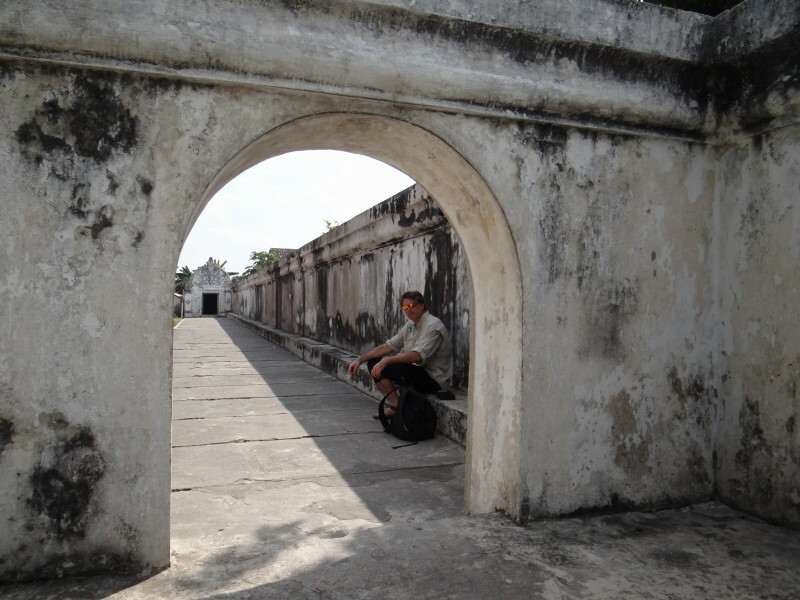 We had an invitation from Andy to stay with him in Yogyakarta. 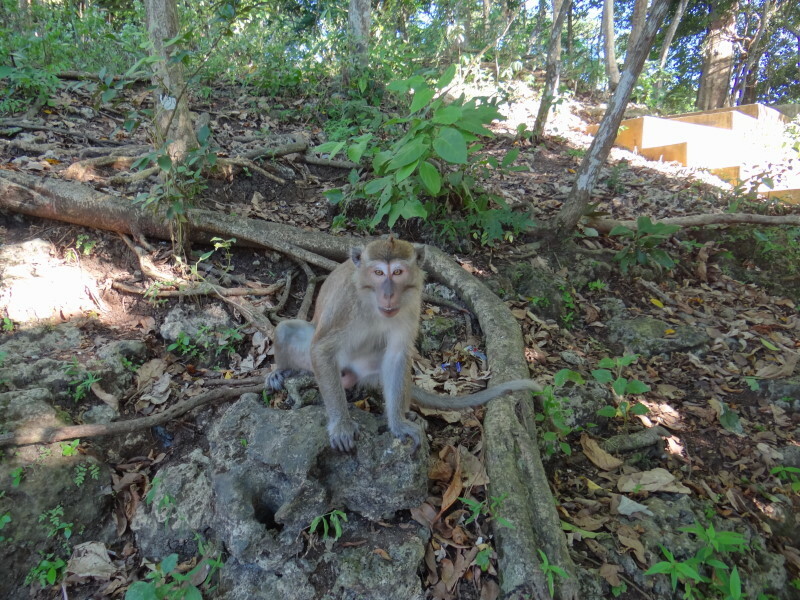 Unfortunately he had to leave for a job so we will not meet him personally. 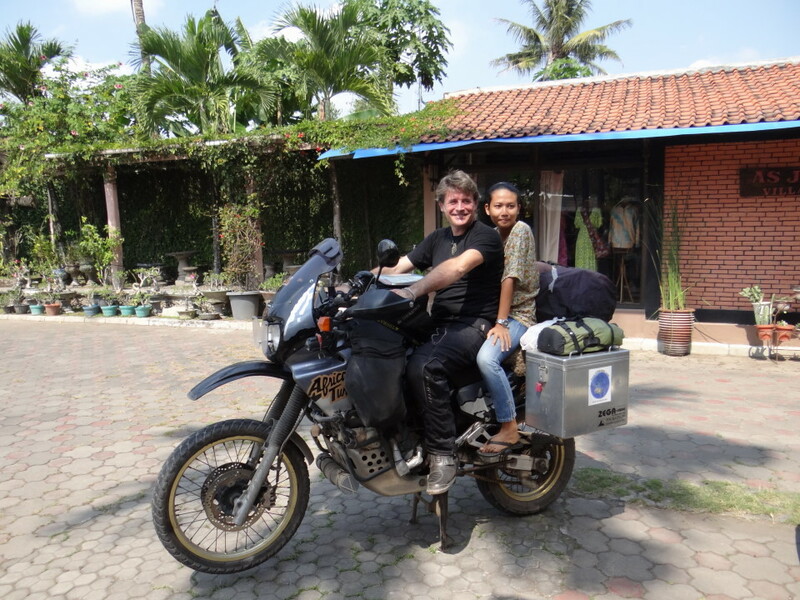 His lovely girlfriend, Shinta, welcomed and guided us around. 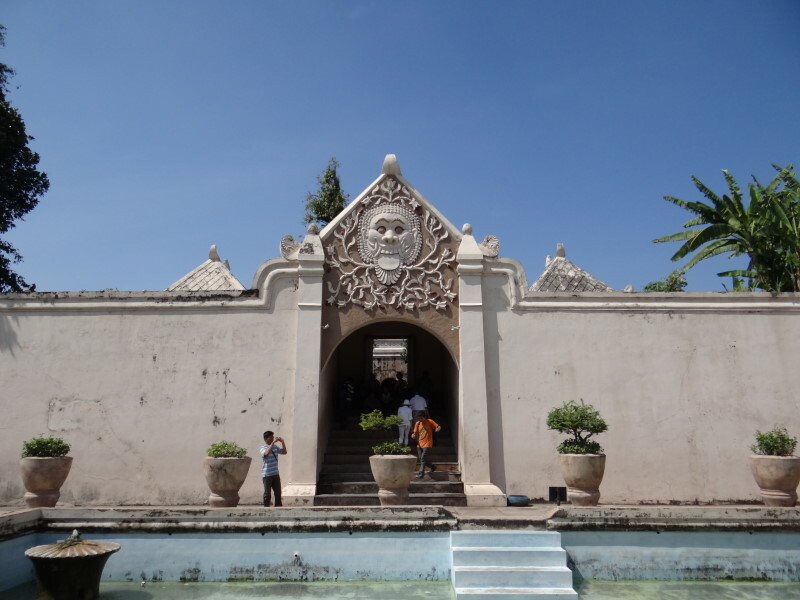 Yogya is a nice city, with small lanes, not much traffic, a lot of green, cultural scenery… we had some walks around at the water castle, Taman Sari and the underground mosque, we met Shinta`s family, got invited in her uncle´s restaurant which is located in a part of the royal palace and who is riding a tiger as well. 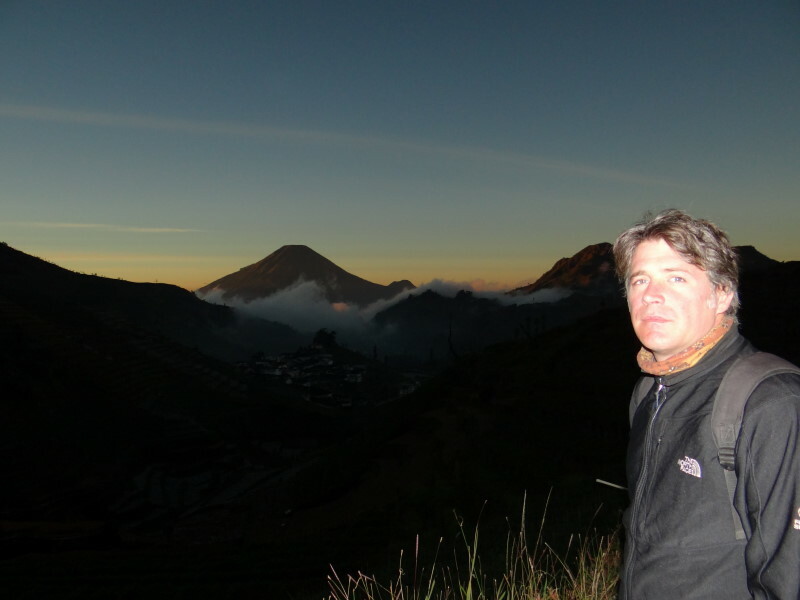 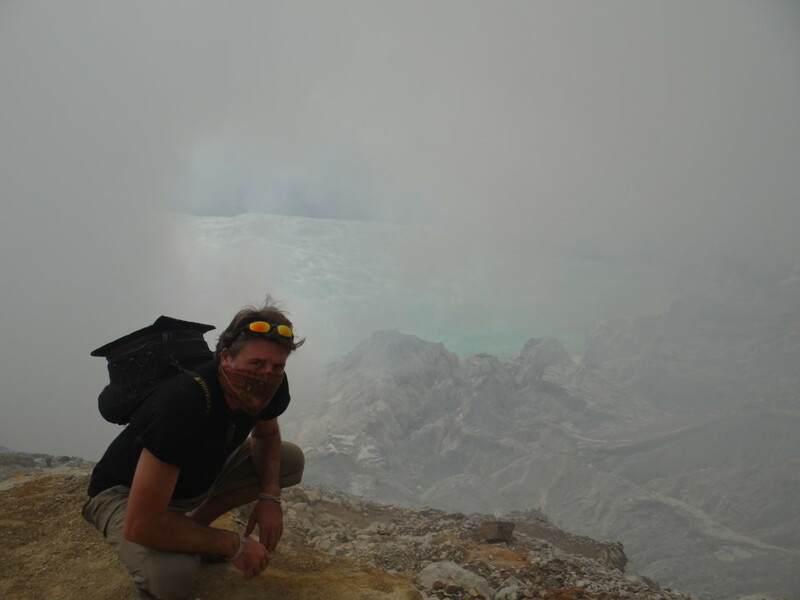 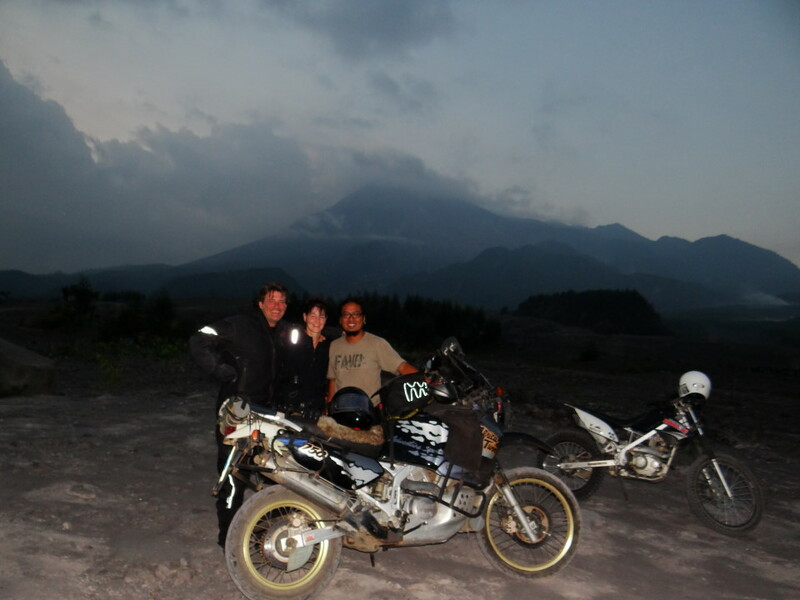 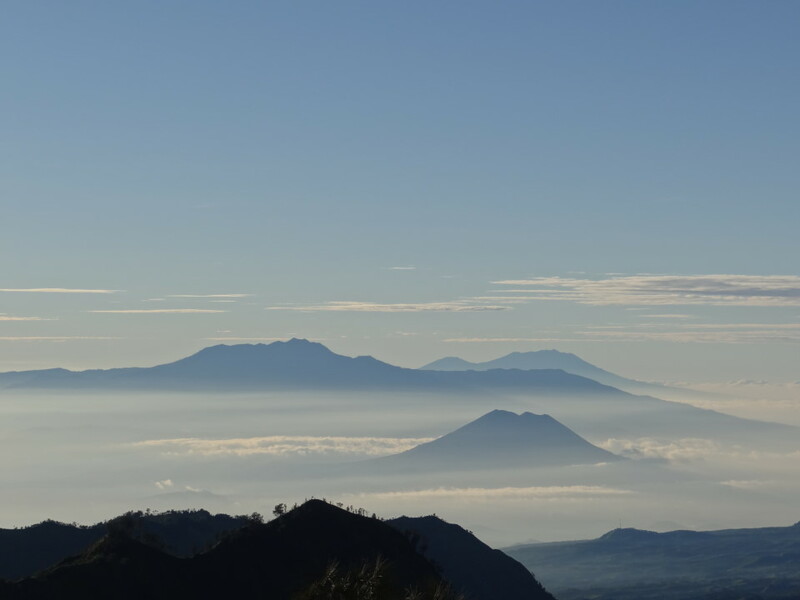 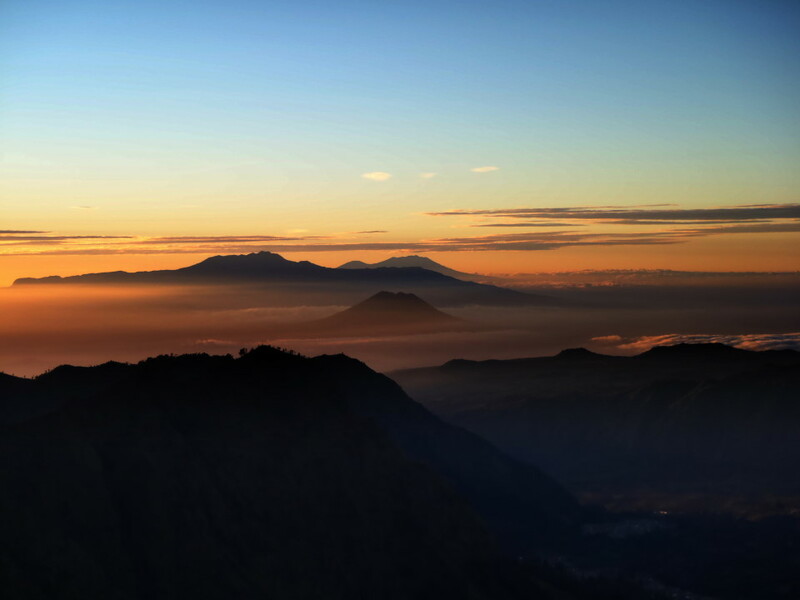 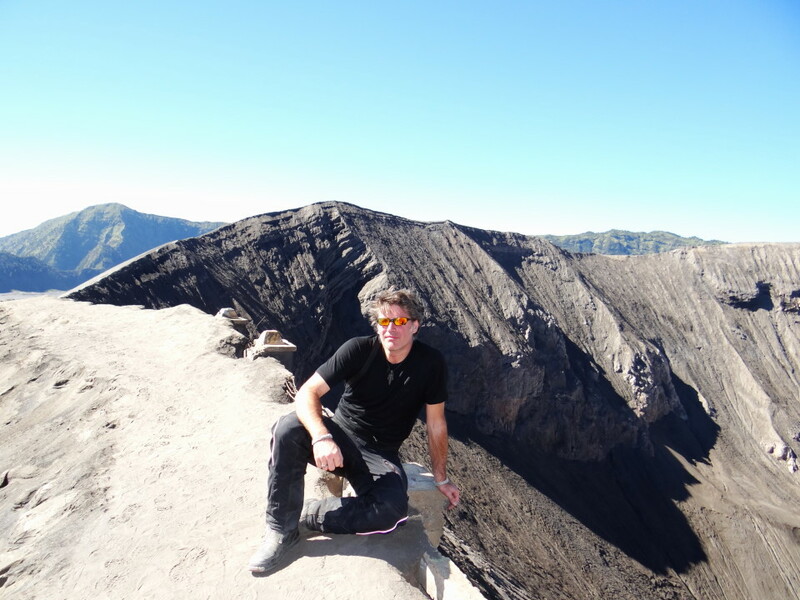 Today we will go together with a friend of Andy, Tommy, up to Mt Merapi, Mountain of Fire. 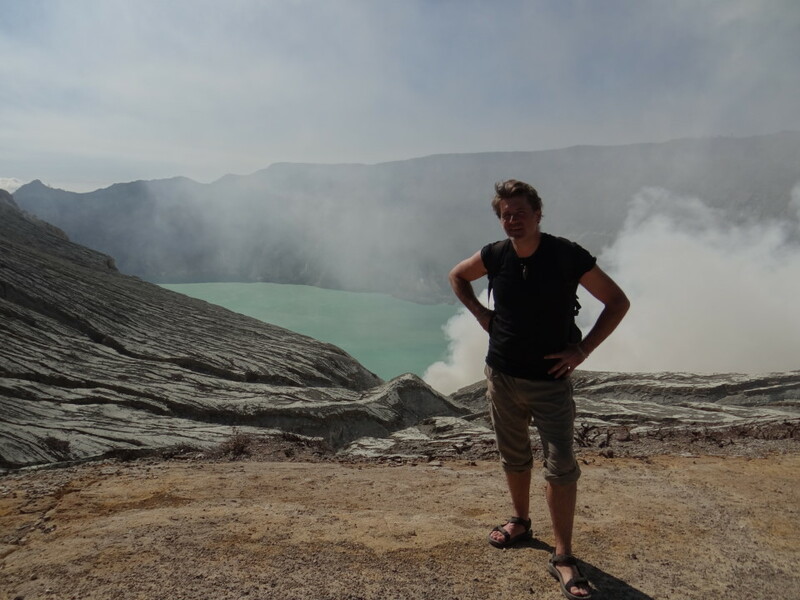 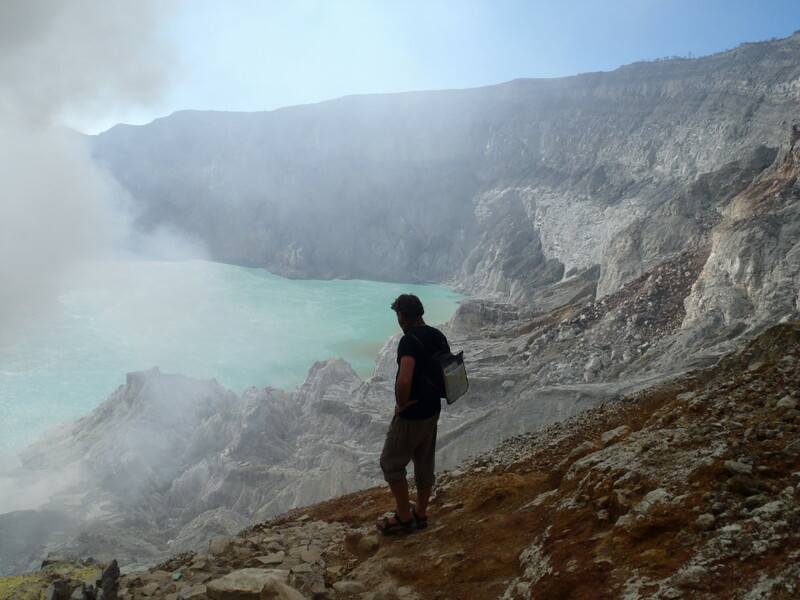 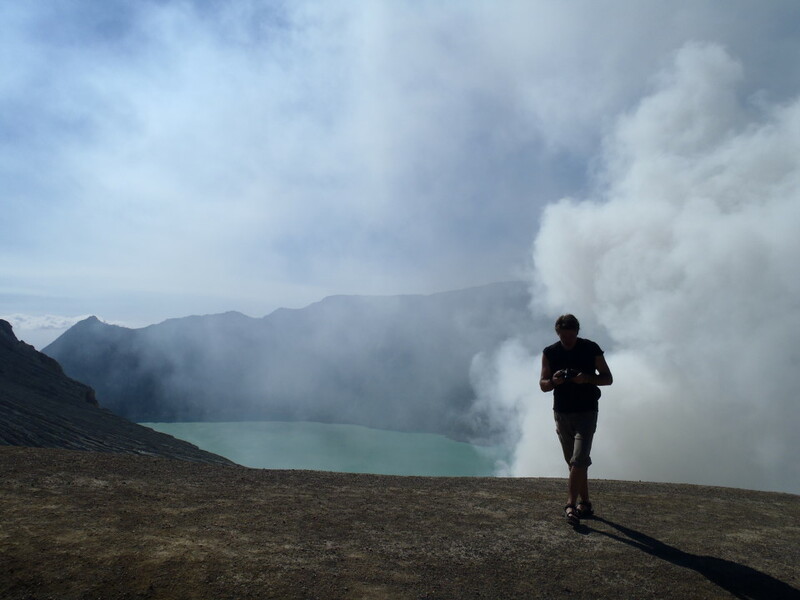 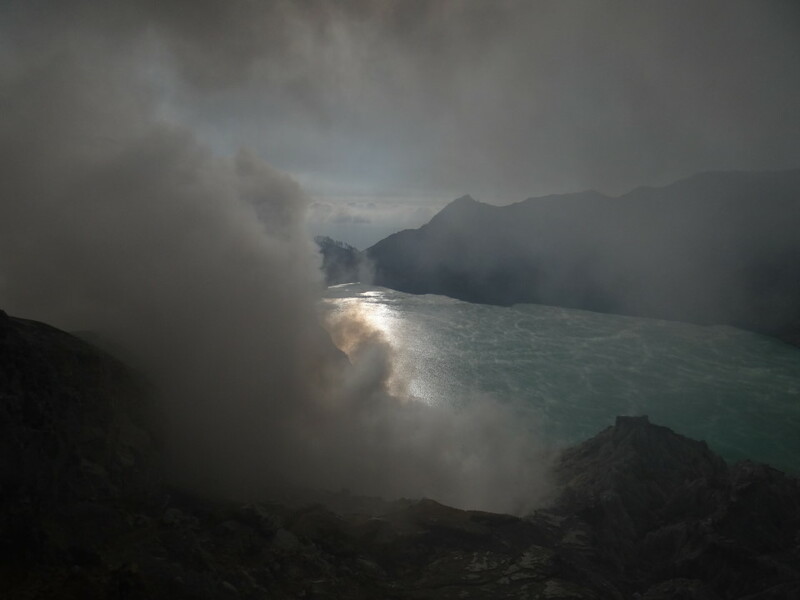 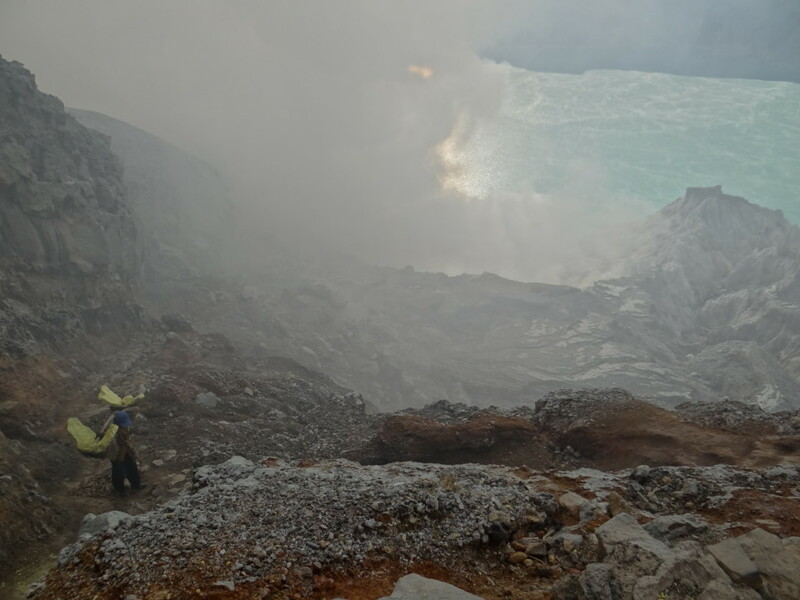 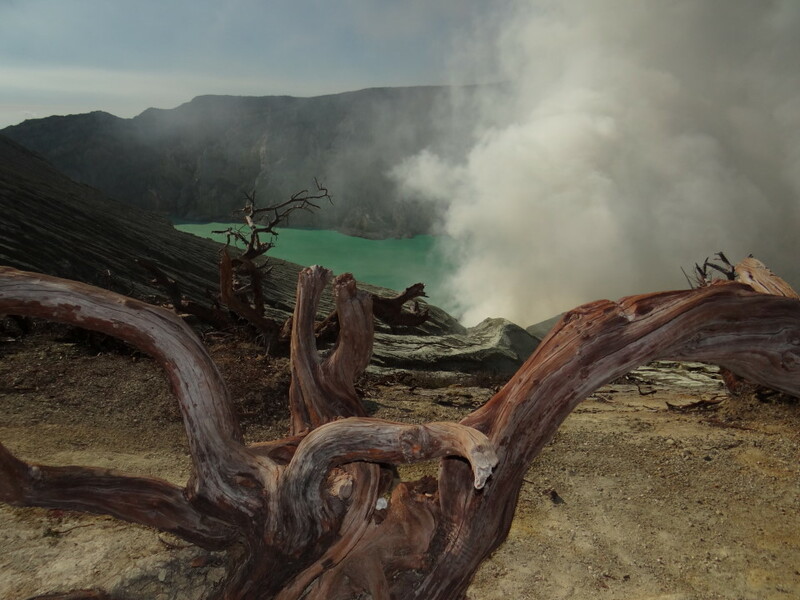 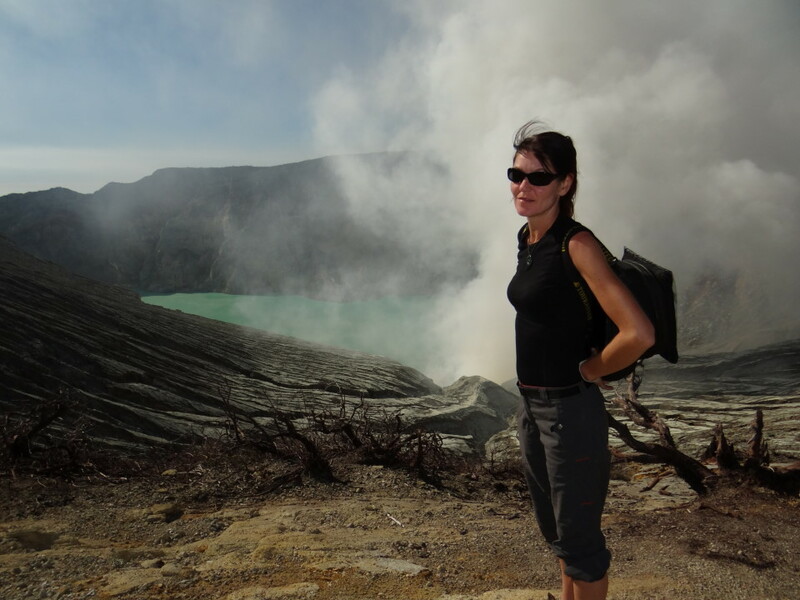 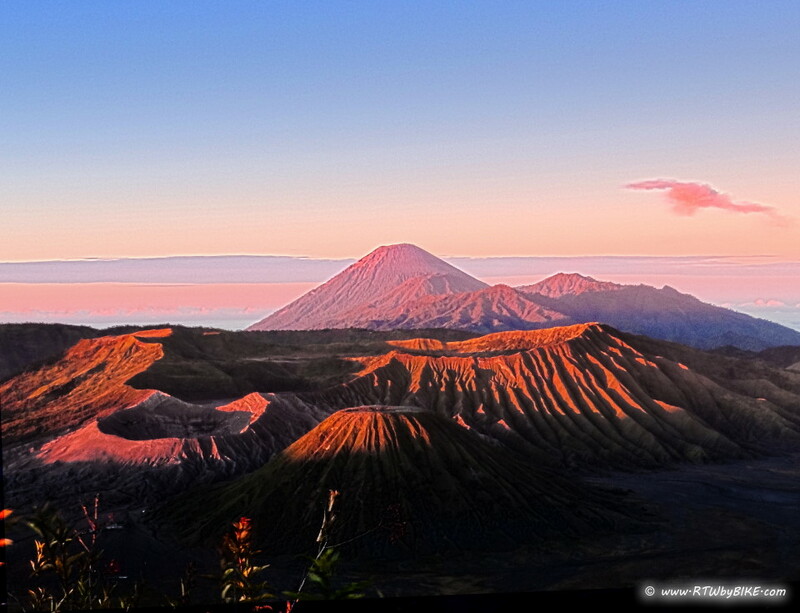 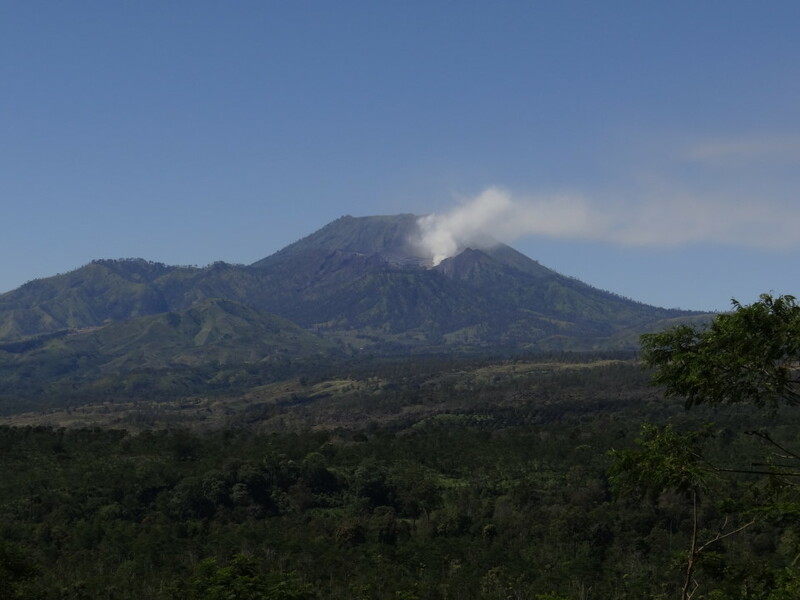 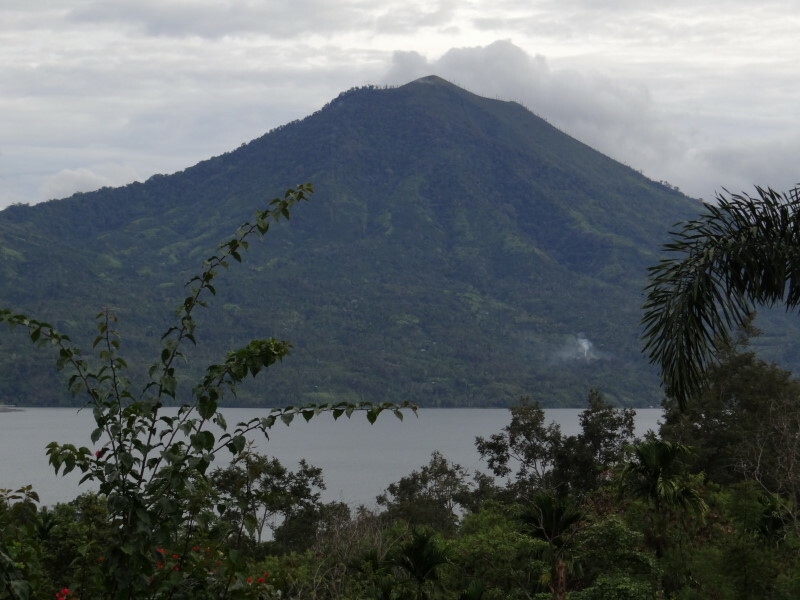 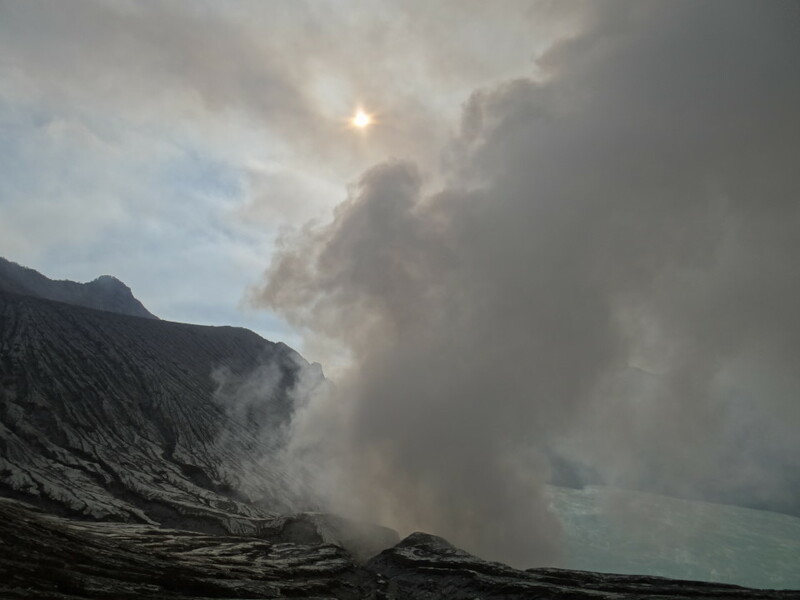 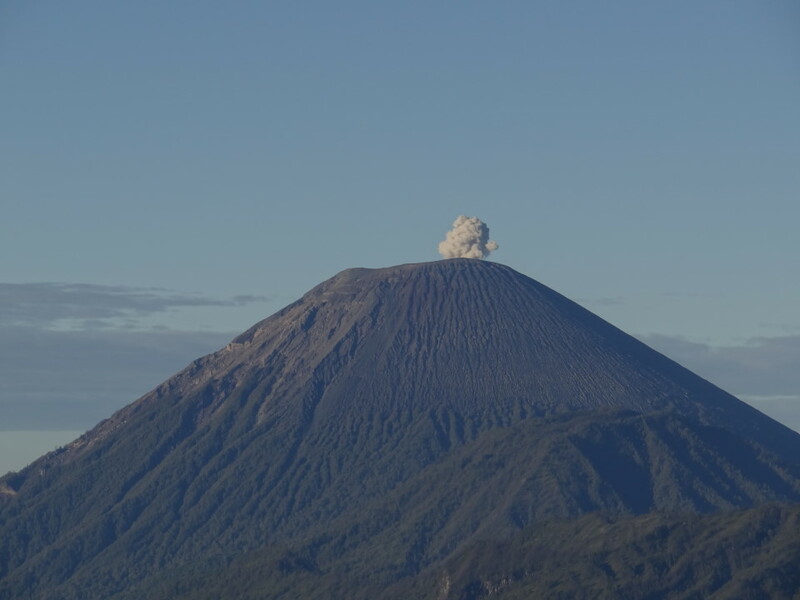 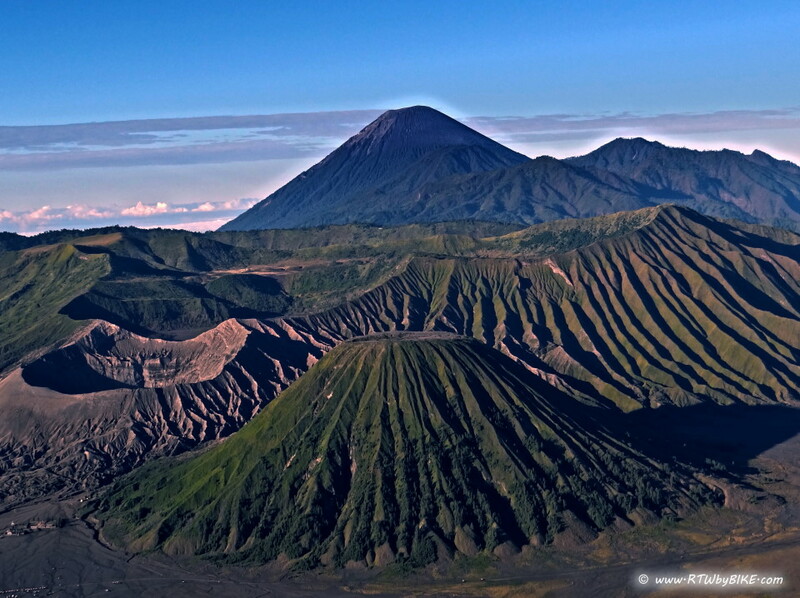 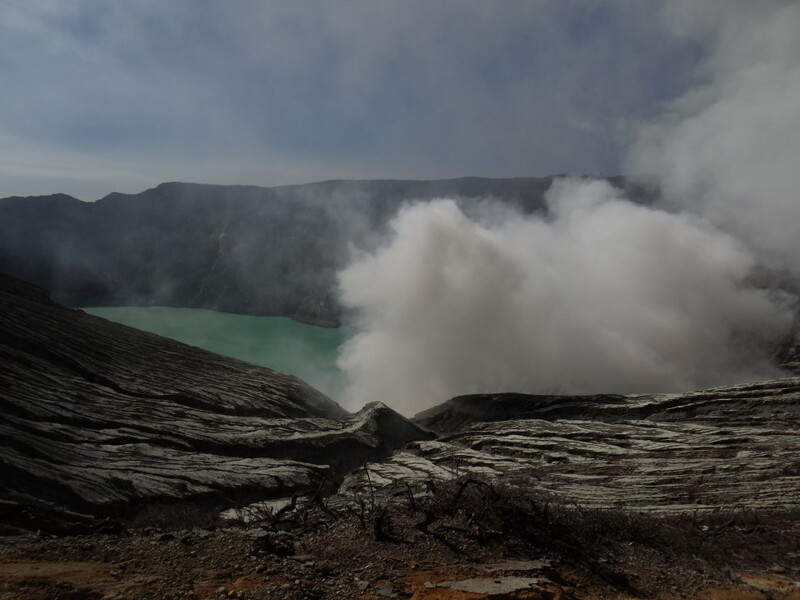 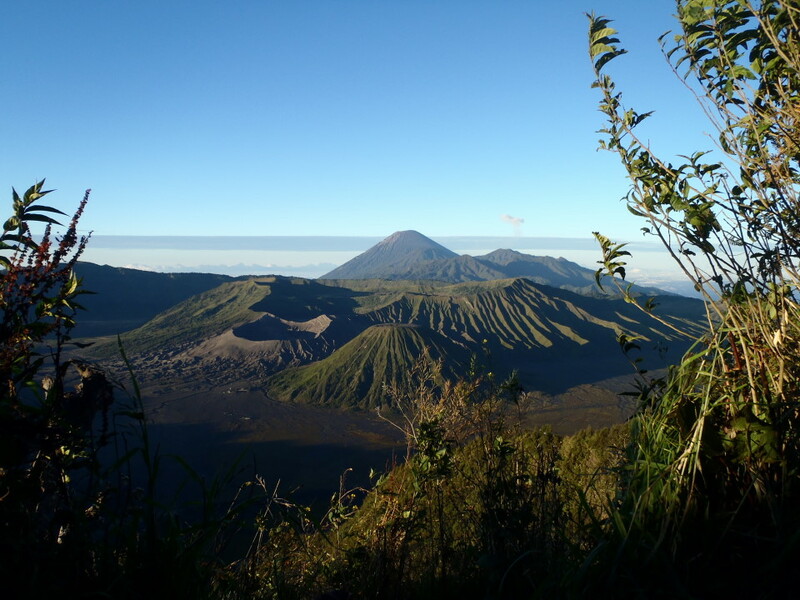 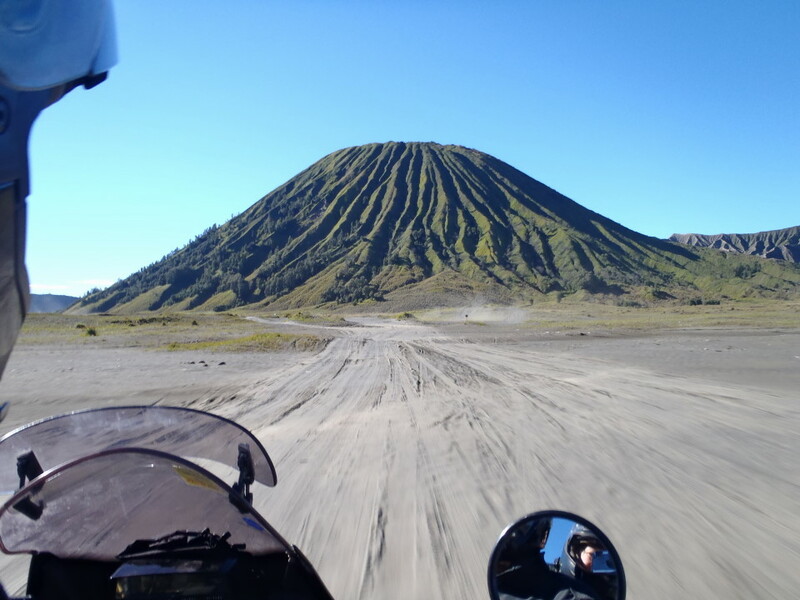 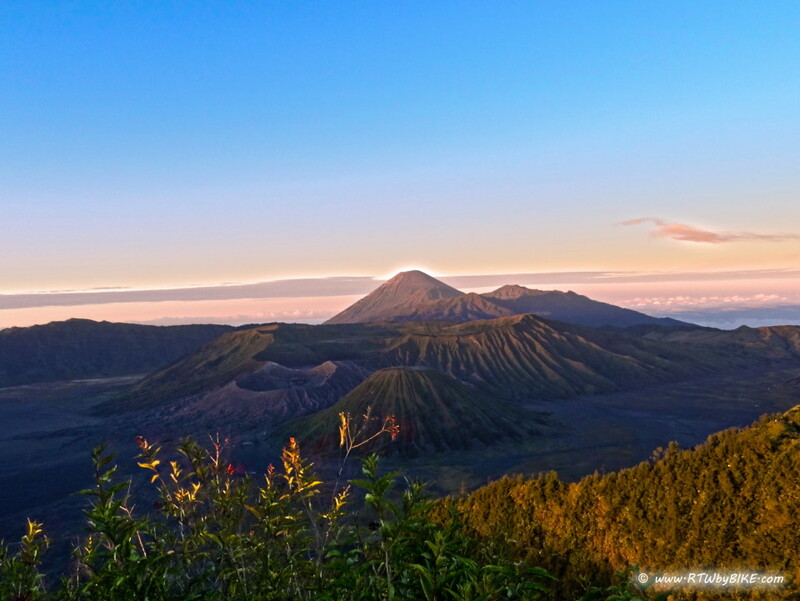 It is Indonesia´s most active volcano. 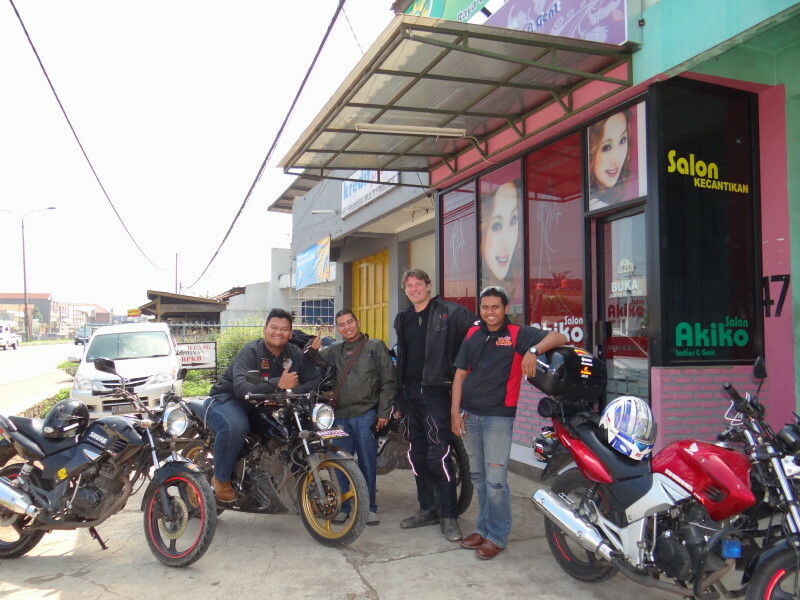 He knows the area very well and we are looking forward having a nice afternoon on the motorcycle! 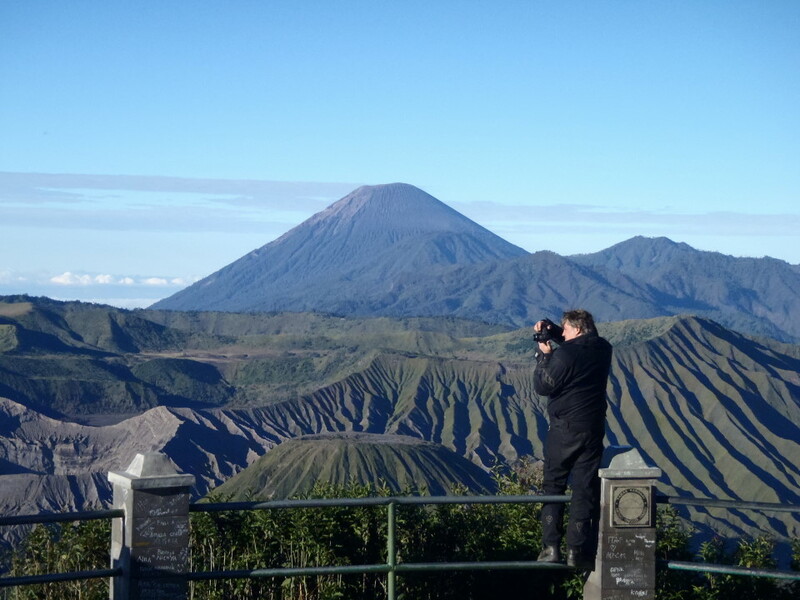 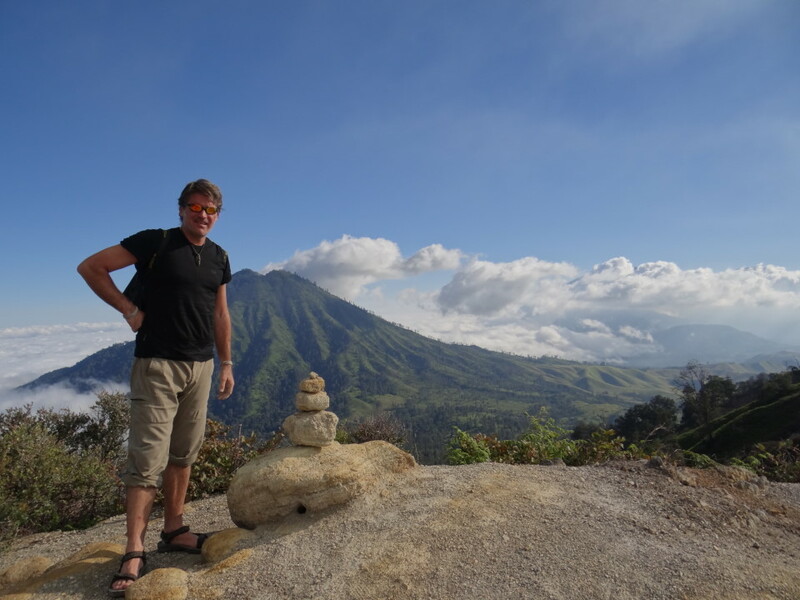 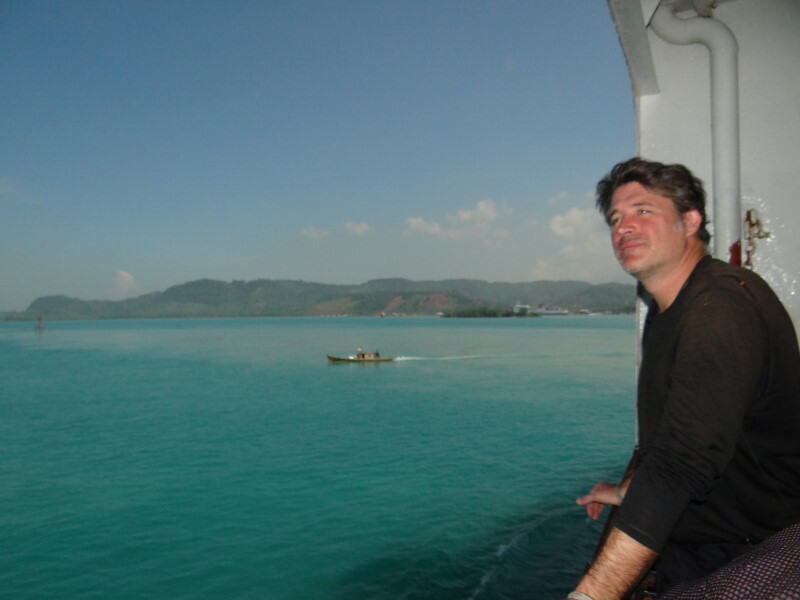 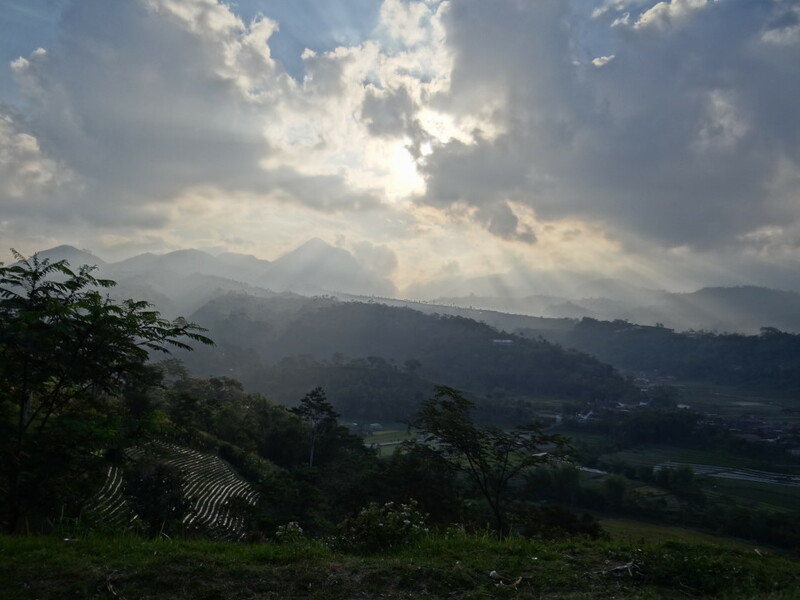 As you can see, we have a lovely time here in Indonesia and we are impressed by the hospitality, the friendliness and last but not least the breathtaking landscapes. 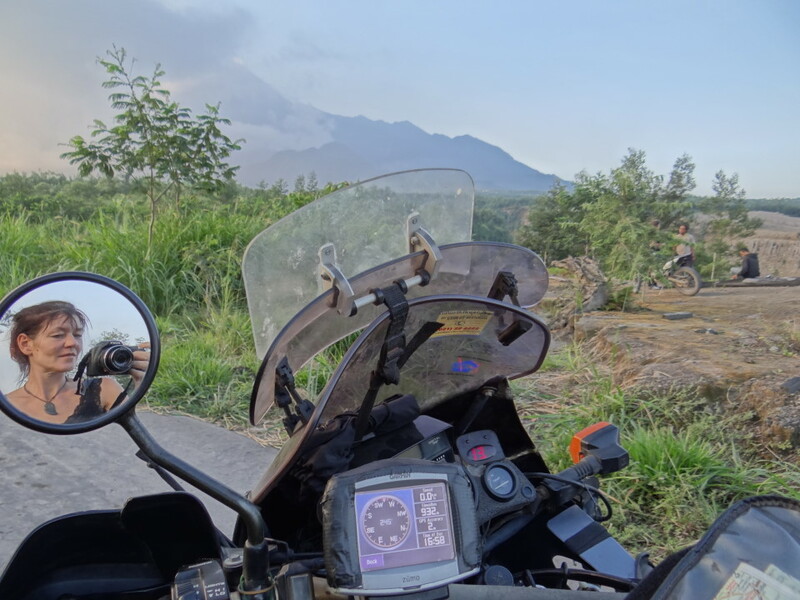 As we do not have internet connection that regular like in other countries, the up-dates are less often and perhaps a bit longer… We hope you enjoy it anyhow!